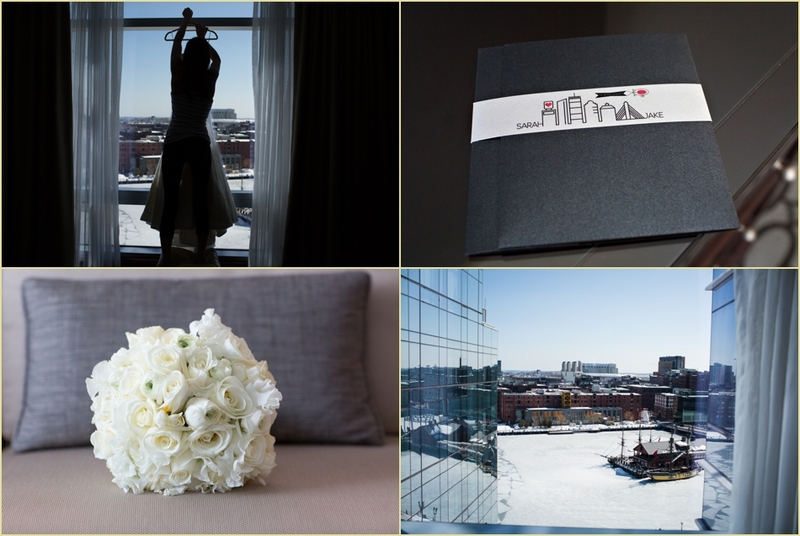 It was a beautiful day in Boston for this winter wedding — sunny, bright, with just a little bit of snow still lining the city streets. 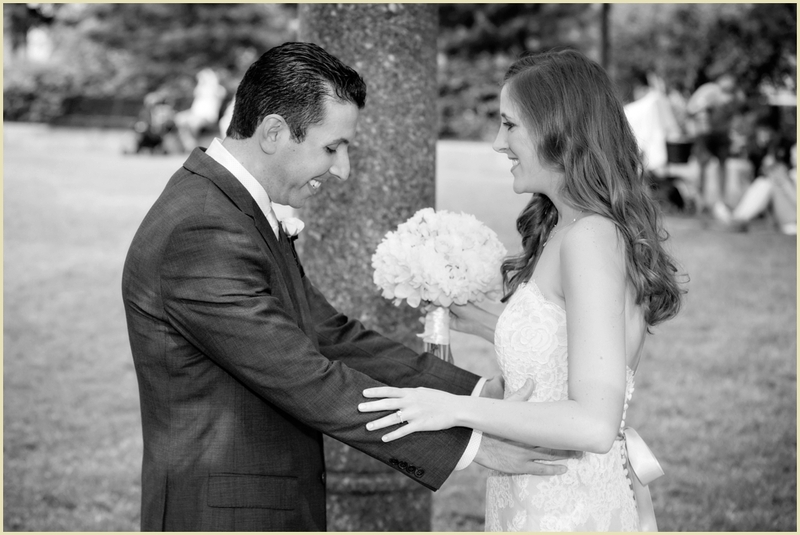 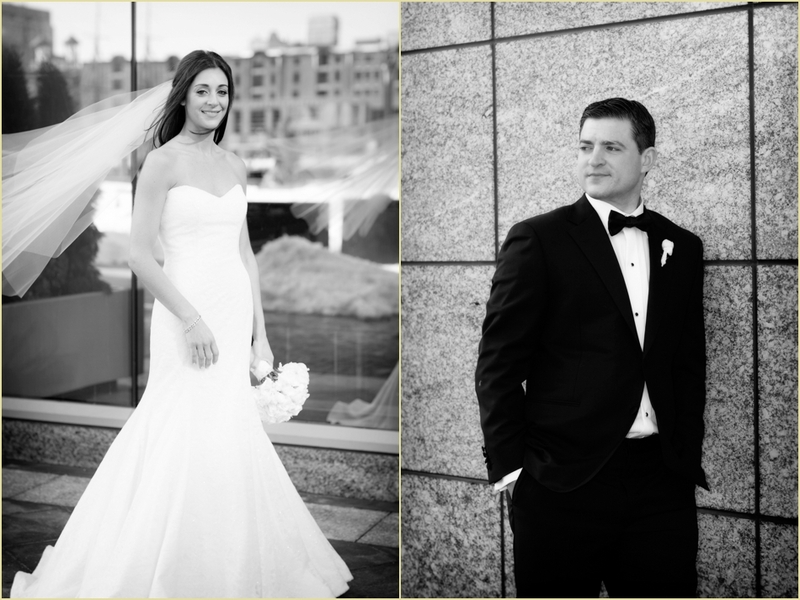 Bride and groom Lindsey and Sal are no strangers to the Boston social and event industry, Lindsey works at a local salon and has plenty of experience with brides on their big day and Sal owns a rental company. 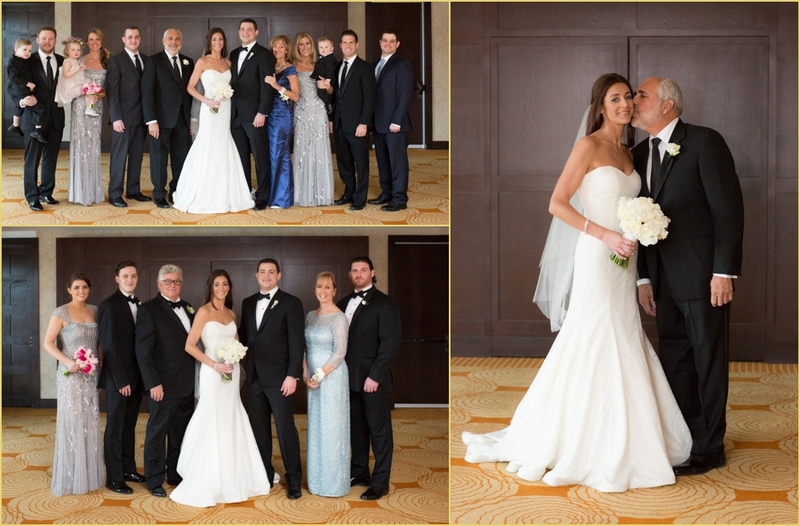 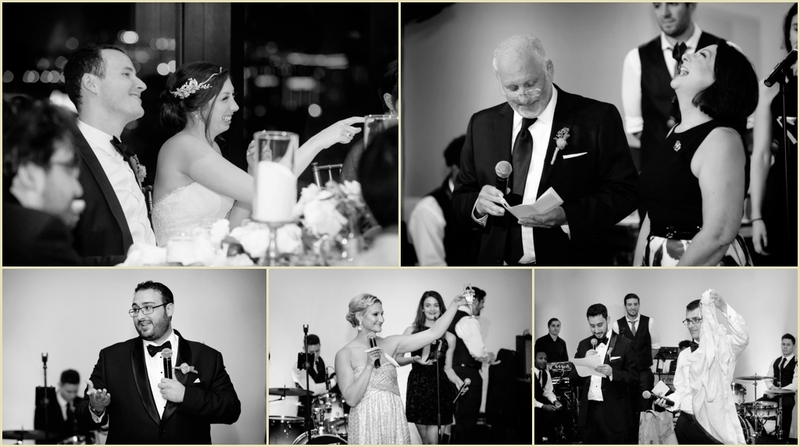 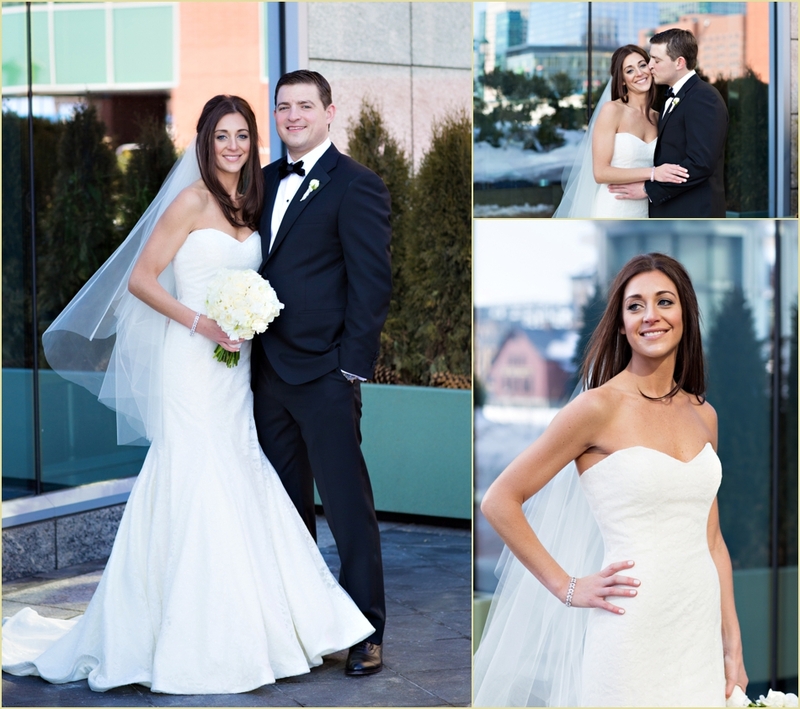 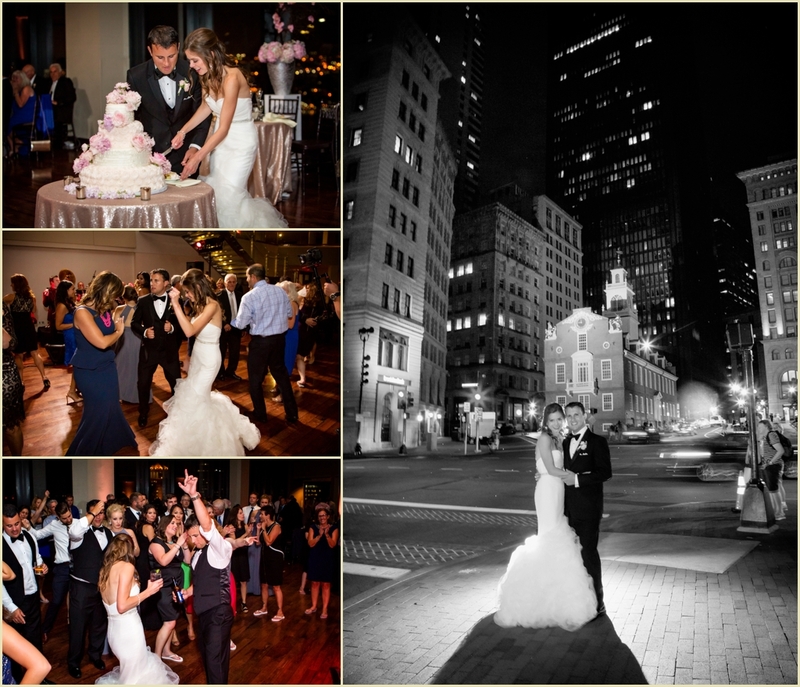 Their classic winter wedding at the State Room Boston was elegant, modern, and a perfect reflection of the beautiful winter season. 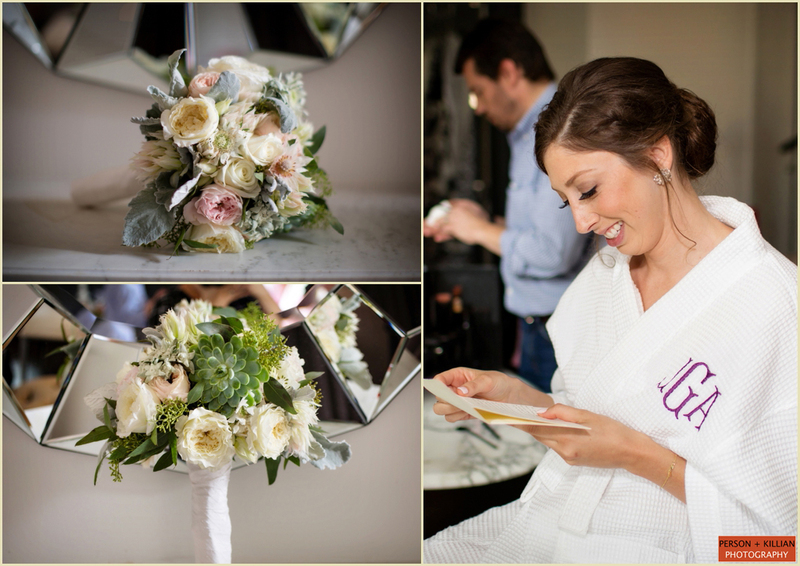 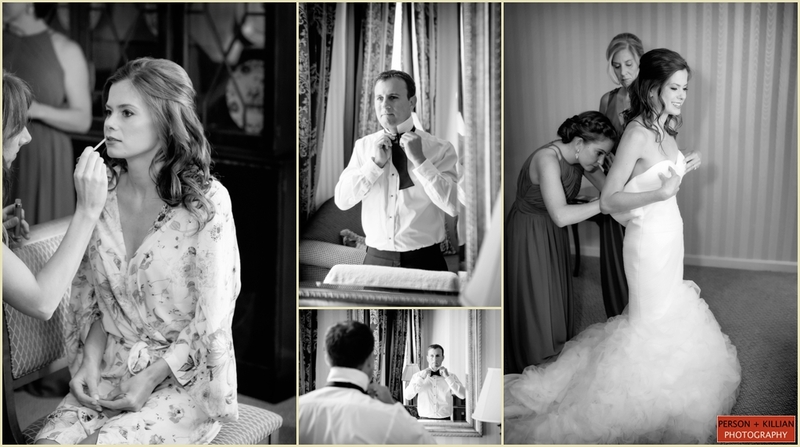 Lindsey and Sal prepped for the wedding day at the nearby Langham Hotel. 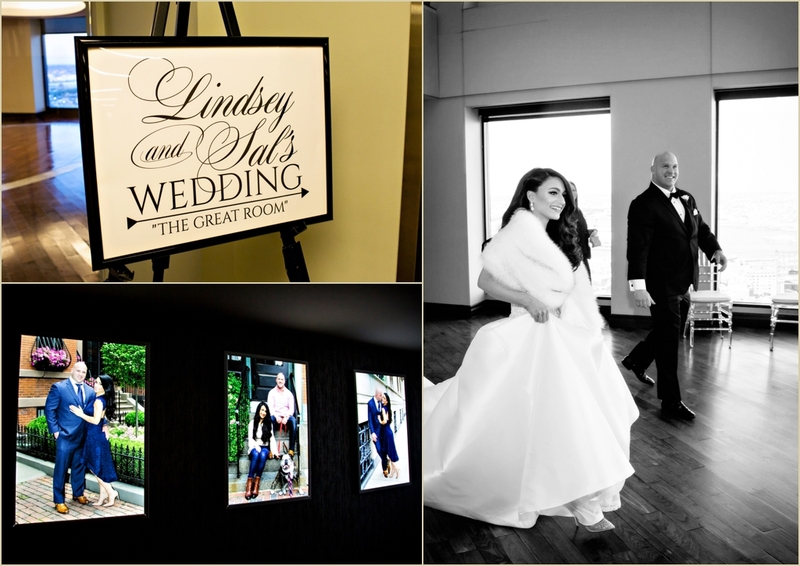 They wanted to keep their wedding party intimate, with only Lindsey’s best friend and salon co-worker serving as bridesmaid and Sal’s business partner and best friend filling the role of groomsman. 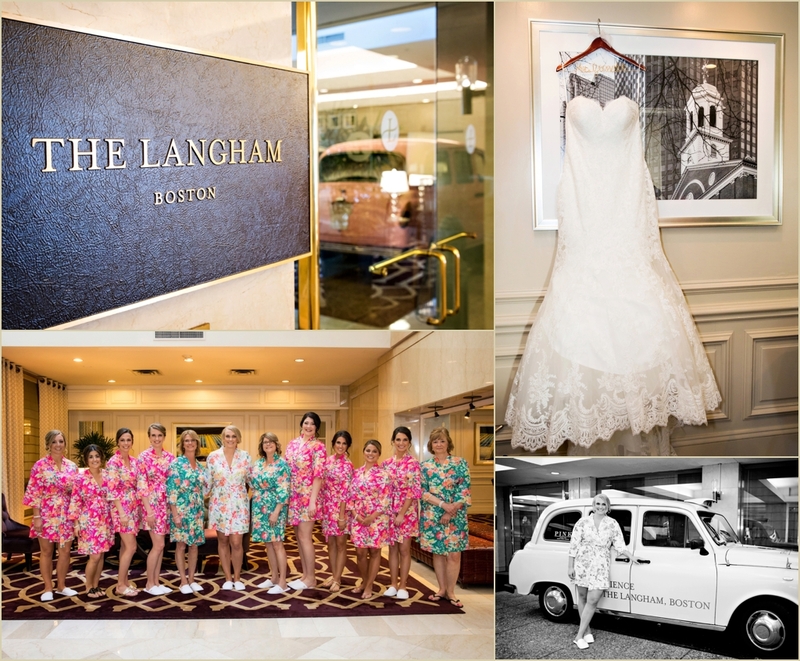 The couple met in the lobby of the Langham for their first look, before being whisked away in an antique white car from Le Limo. 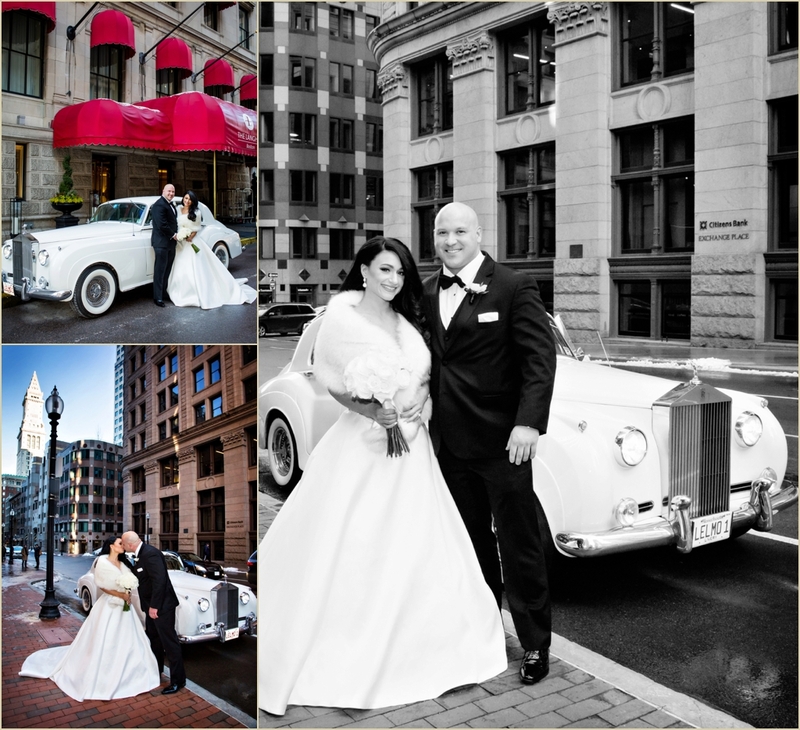 Both Lindsey and Sal love and own antique cars, so even though the drive wasn’t very long to the State Room Boston it was important that the car be incorporated into their wedding day! 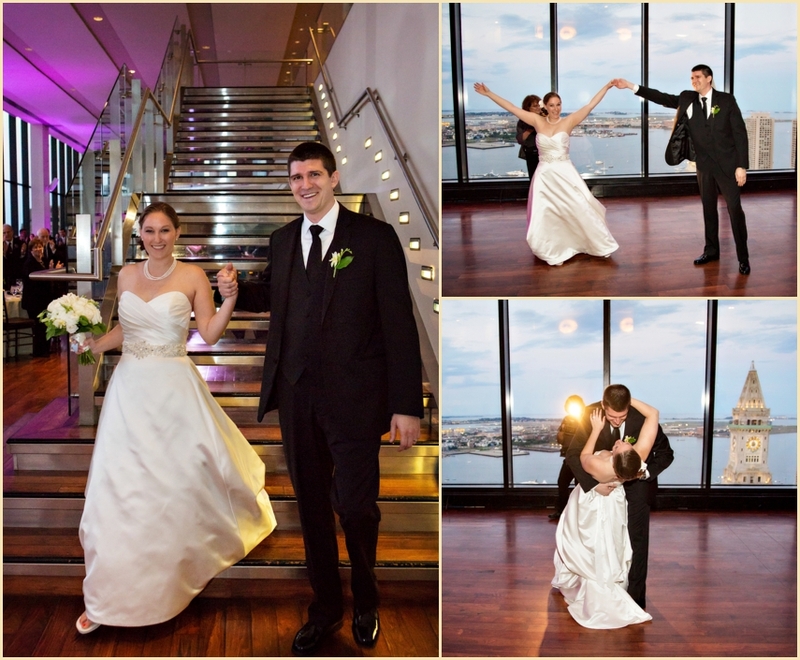 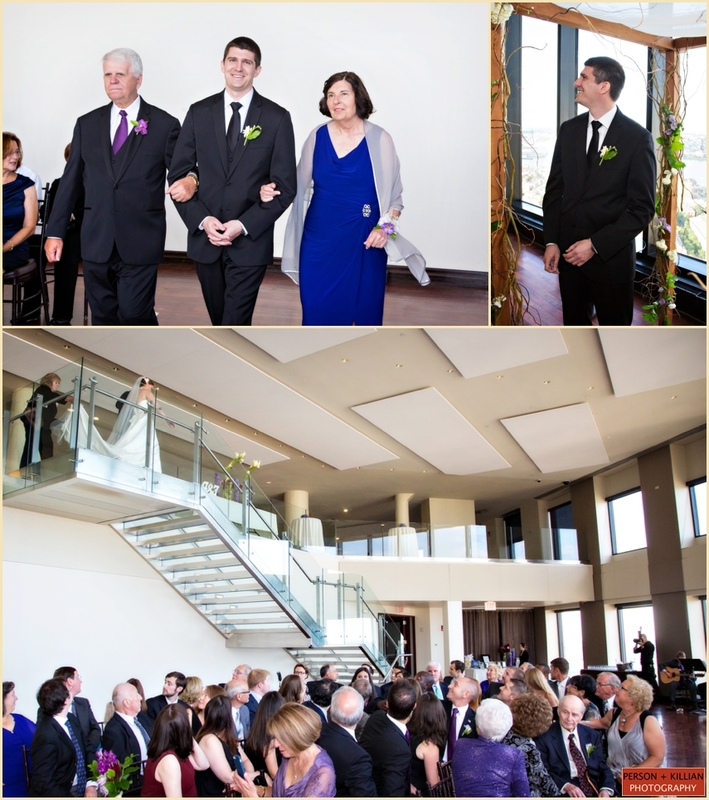 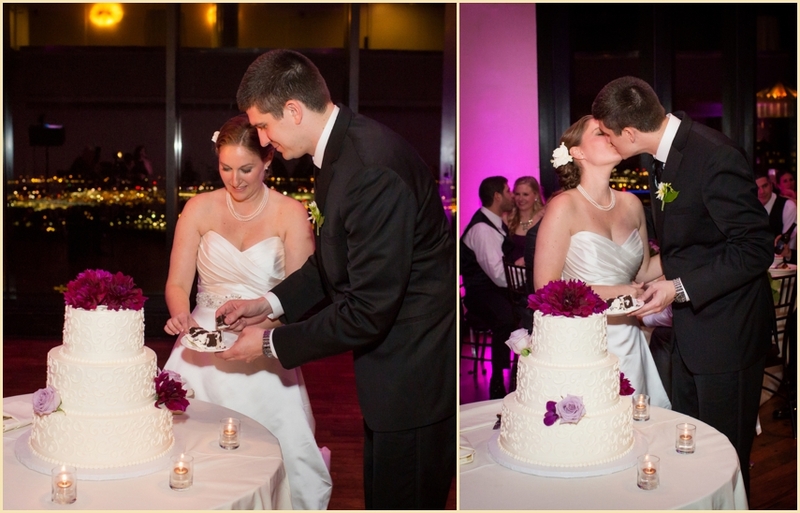 After arriving at the State Room Boston, we went straight up to the Great Room on the 33rd floor for some formal photos with the couple. 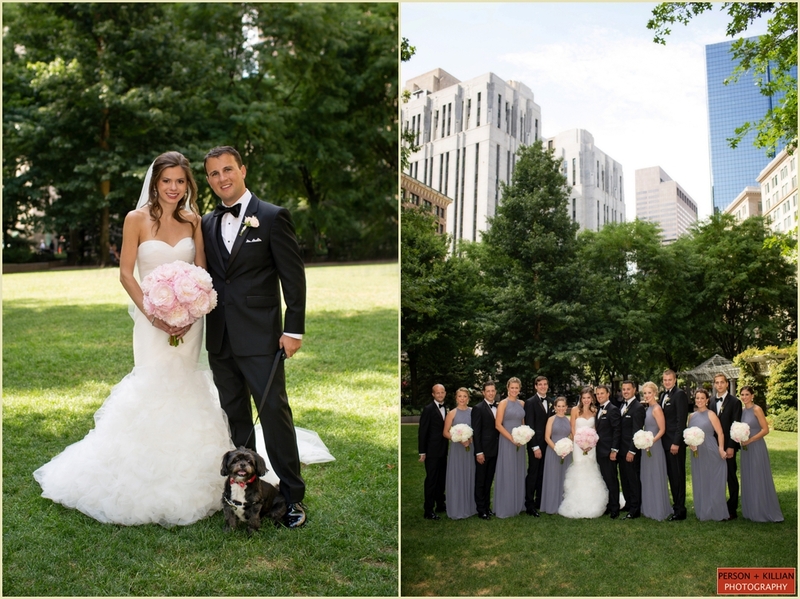 Lindsey and Sal’s beloved bulldog Bruin unfortunately couldn’t be at the wedding, but he was featured in their engagement photos leading up to the Great Room, as well as on the menus, place cards, and as a cut-out inside the photo booth. 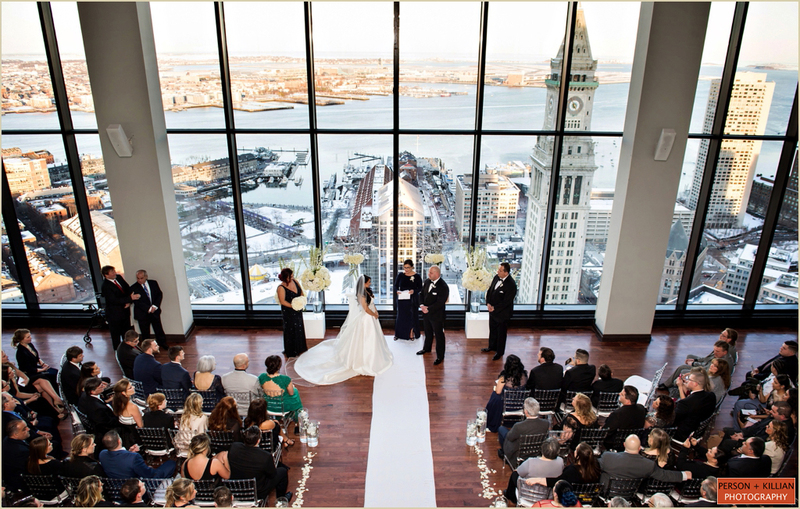 The wedding ceremony at the State Room Boston was officiated by Sal’s aunt, and the couple said their “I dos” overlooking the gorgeous snowy streets of Boston below. 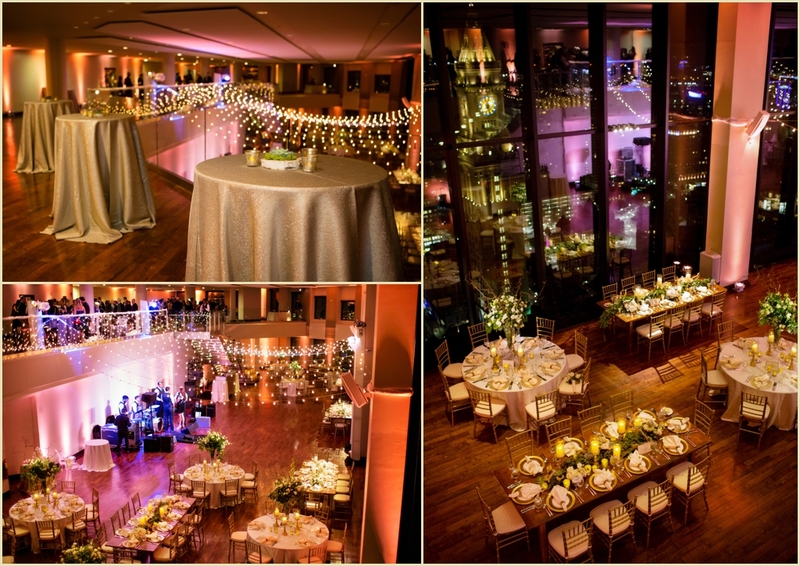 While guests enjoyed cocktails and hors d’oeuvres, the Great Room was transformed into a gorgeous winter wedding reception. 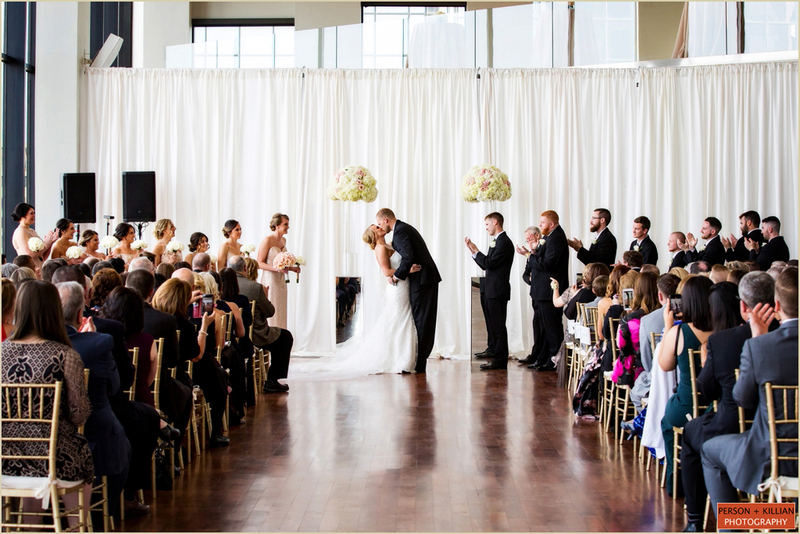 The couple chose a color palette of classic white — perfect for the season — with white linens, towering white floral arrangements, crystal chiavari chairs with white cushions, and a soft seating area of modern white furniture just off the dance floor. 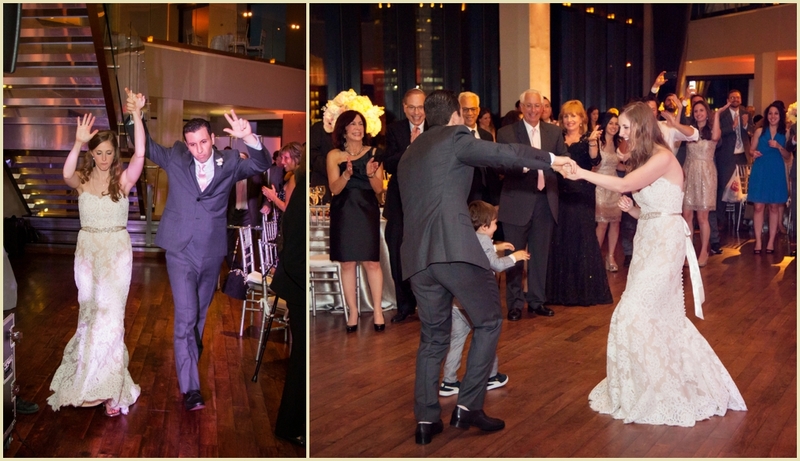 Lindsey changed into a second dress after dinner, with a sleeker skirt perfect for dancing. 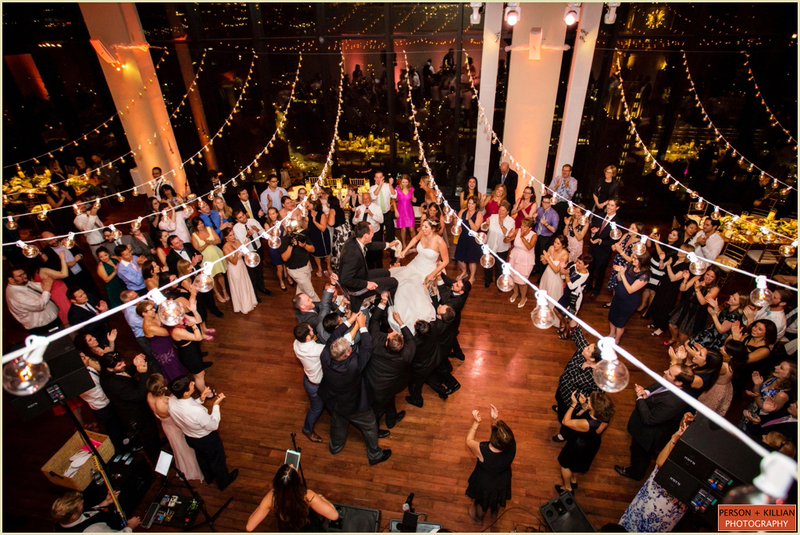 After the cake cutting and a few toast, this happy newlywed couple celebrated the night away surrounded by friends, family, and loved ones. 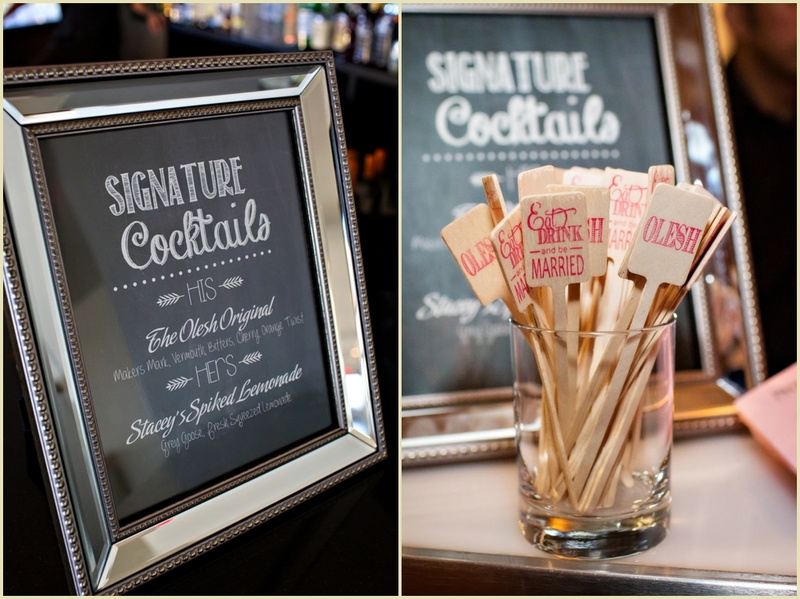 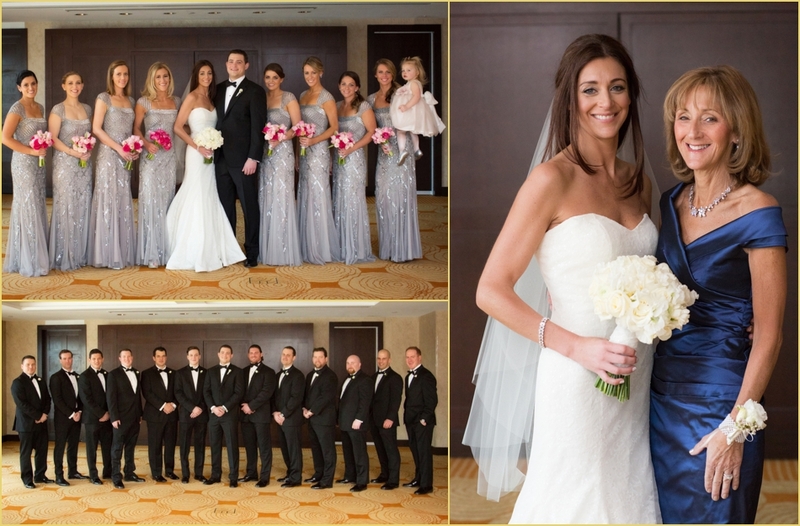 Thank you to Lindsey and Sal for being such a joy to work with, and to the entire team at the State Room Boston for this fabulous winter wedding celebration! 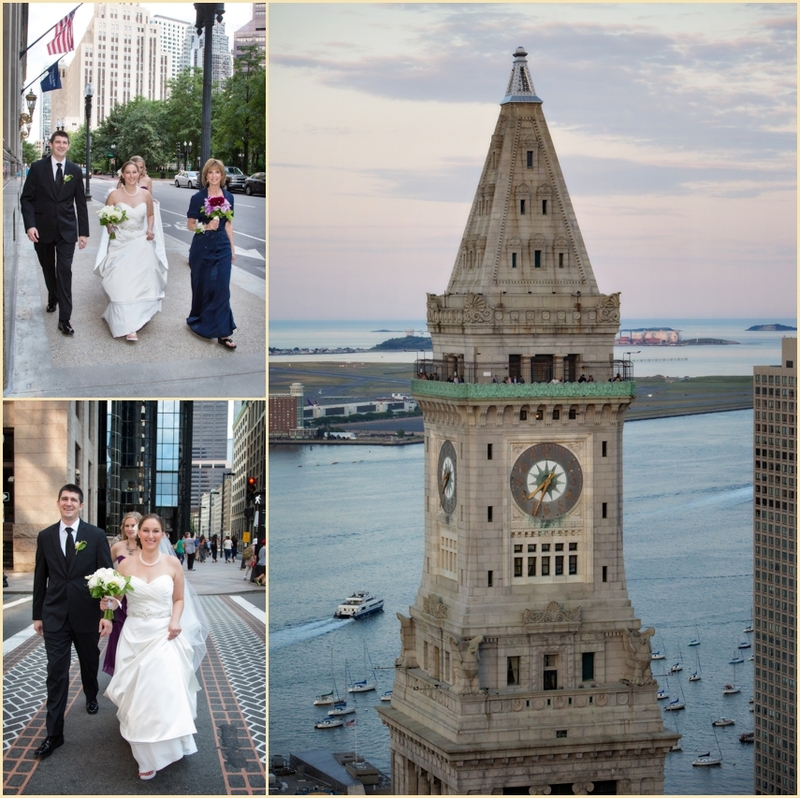 Lindsey and Pat’s journey to the altar began on Boston’s waterfront, when Pat popped the question to Lindsey on a walk along the Boston Harbor. 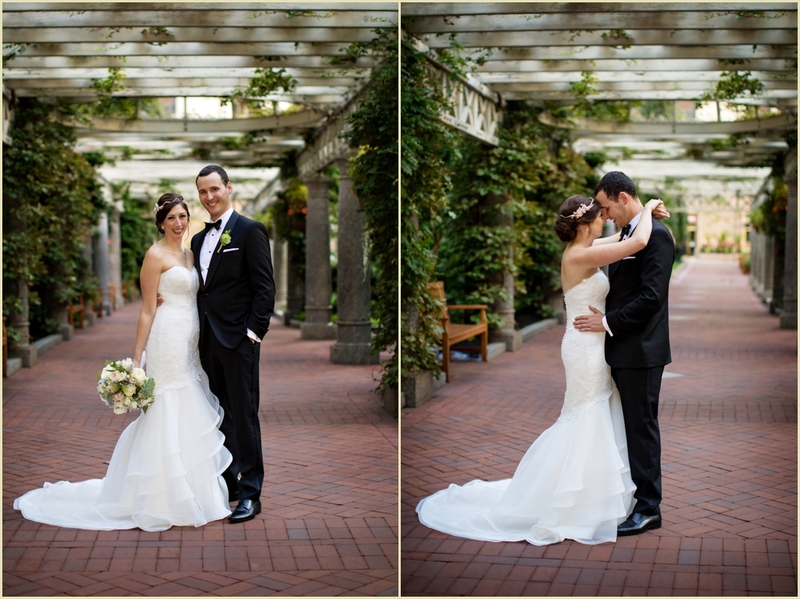 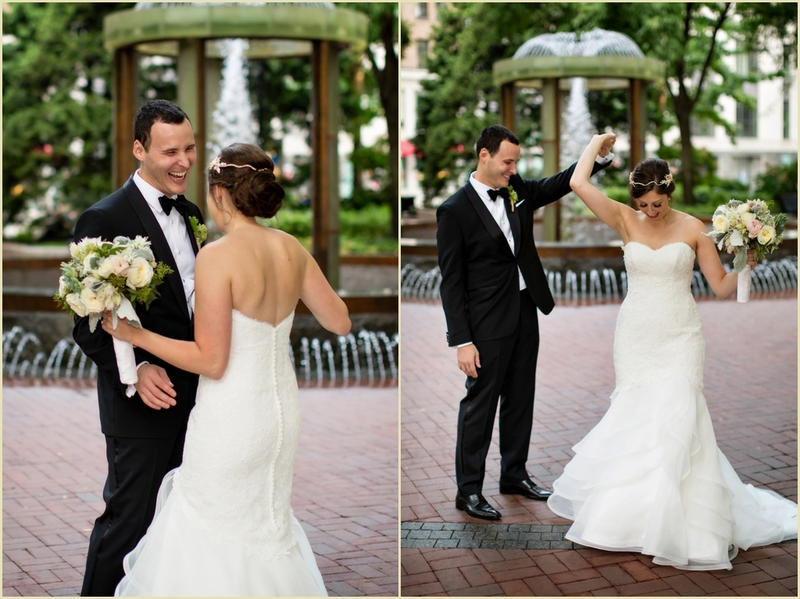 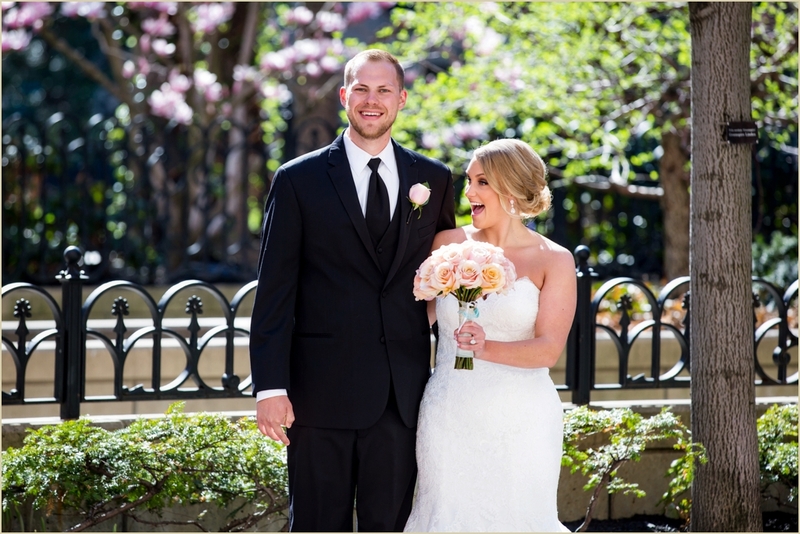 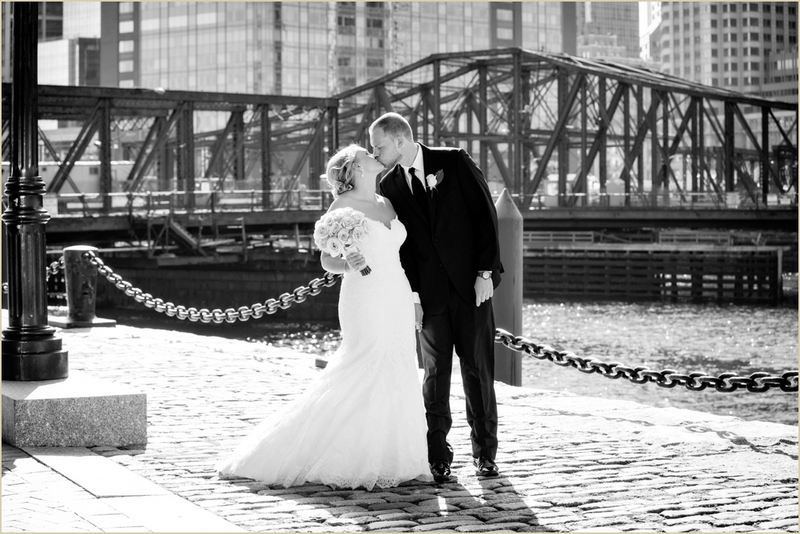 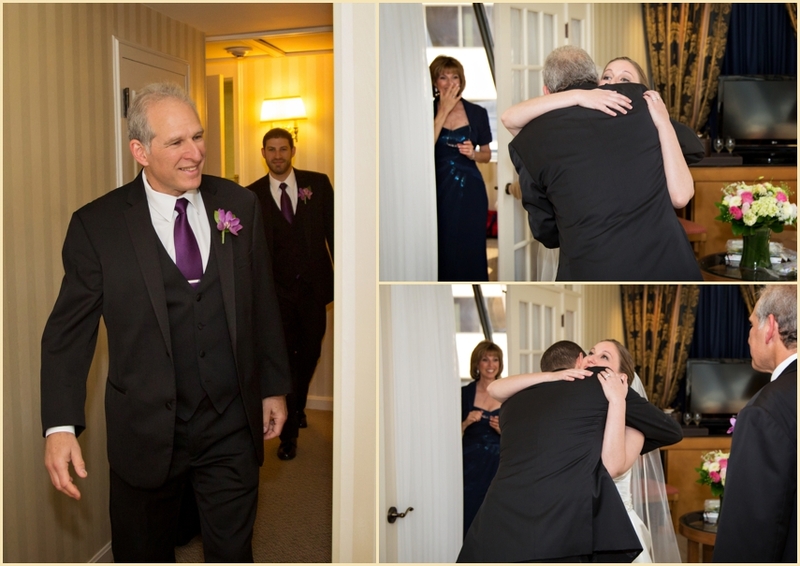 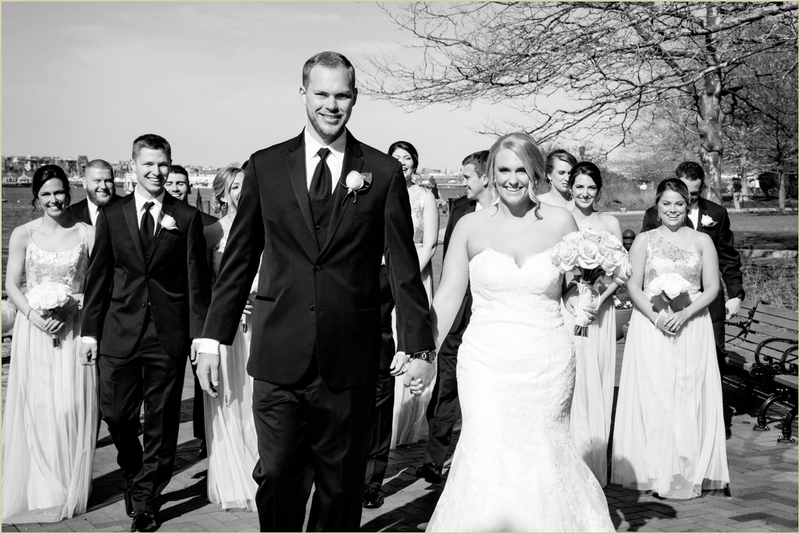 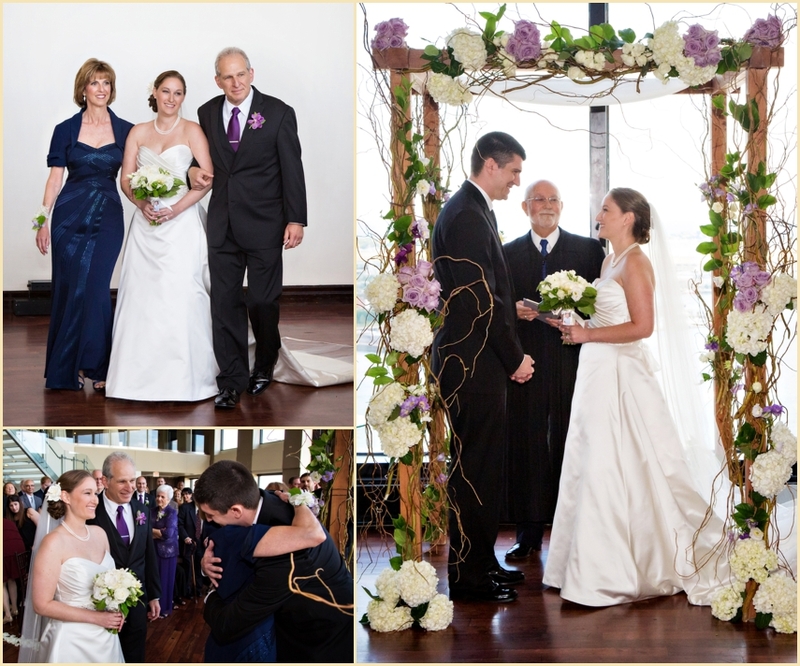 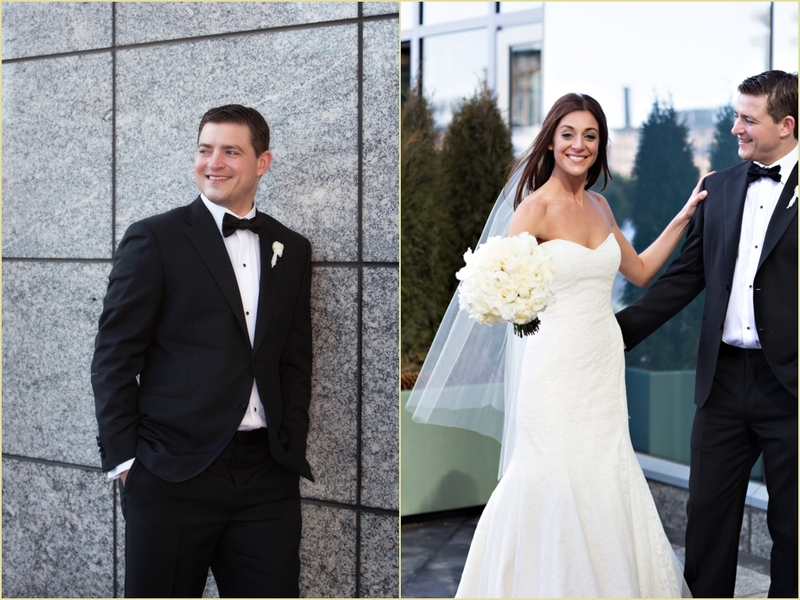 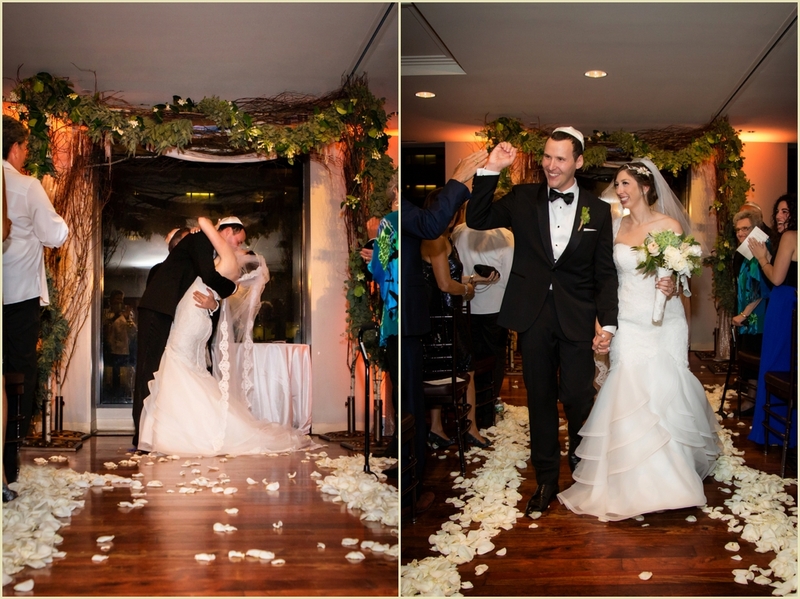 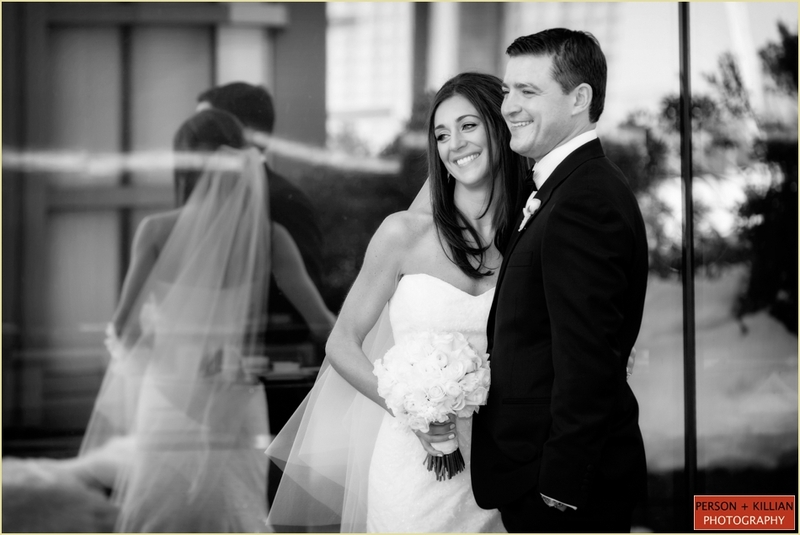 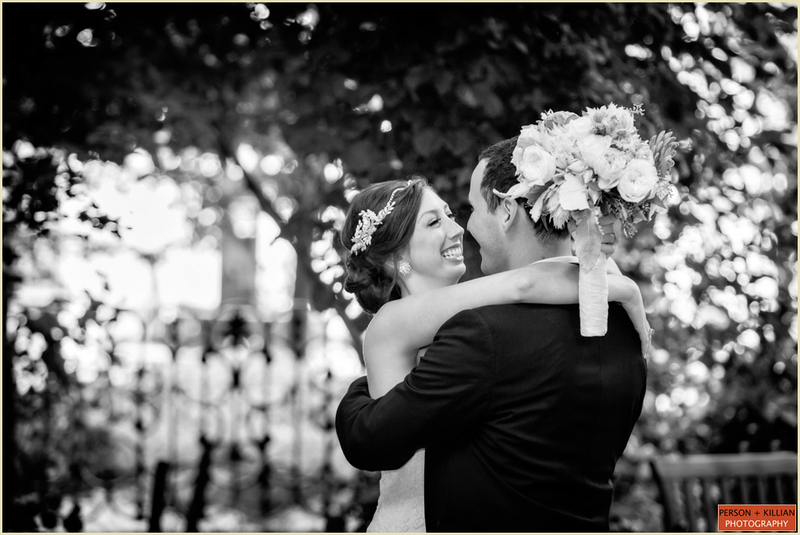 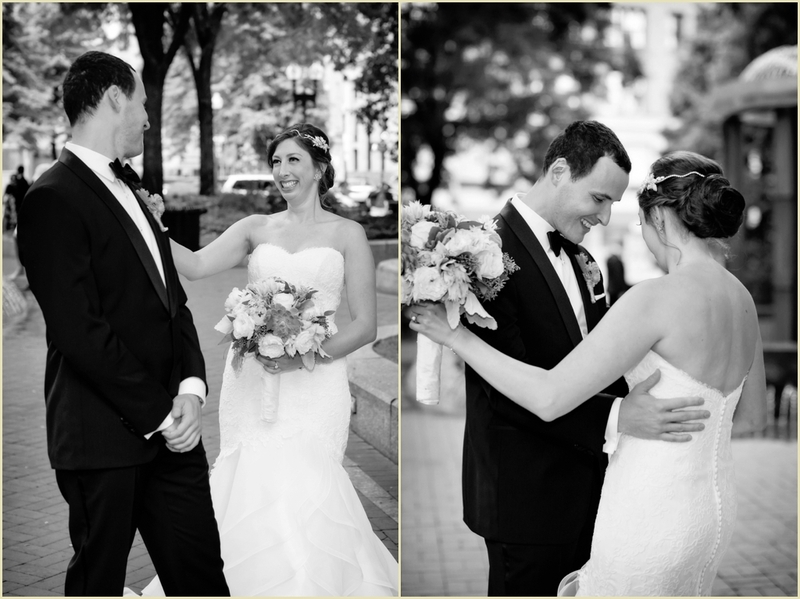 Their State Room Boston wedding brought them full circle, right back to the same spot on the Harborwalk but now as husband and wife! 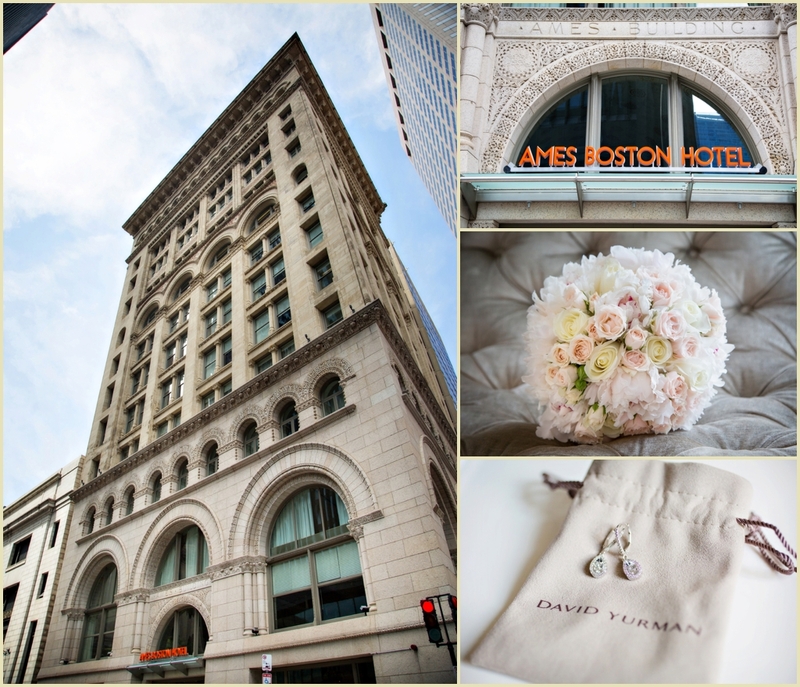 The soon-to-be newlyweds started their day at the Ames Hotel in Boston’s historic downtown, just steps from Faneuil Hall and the Old State House. 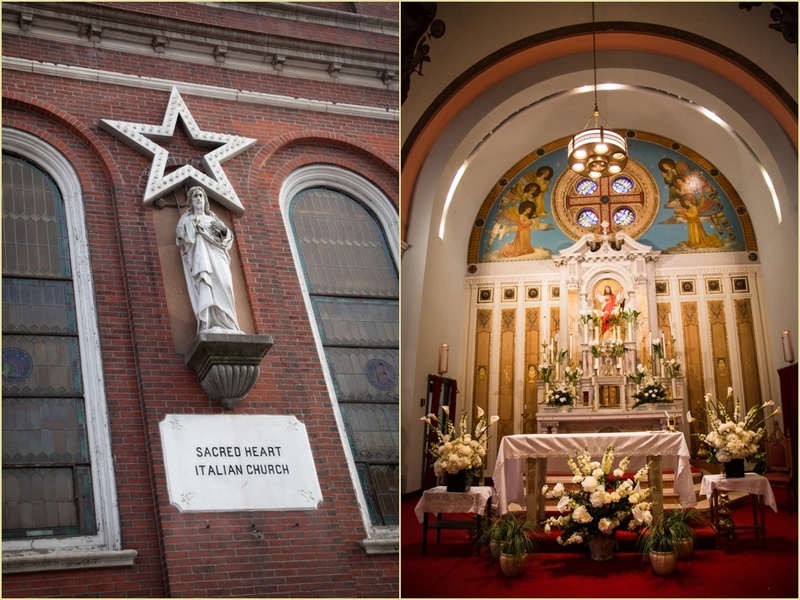 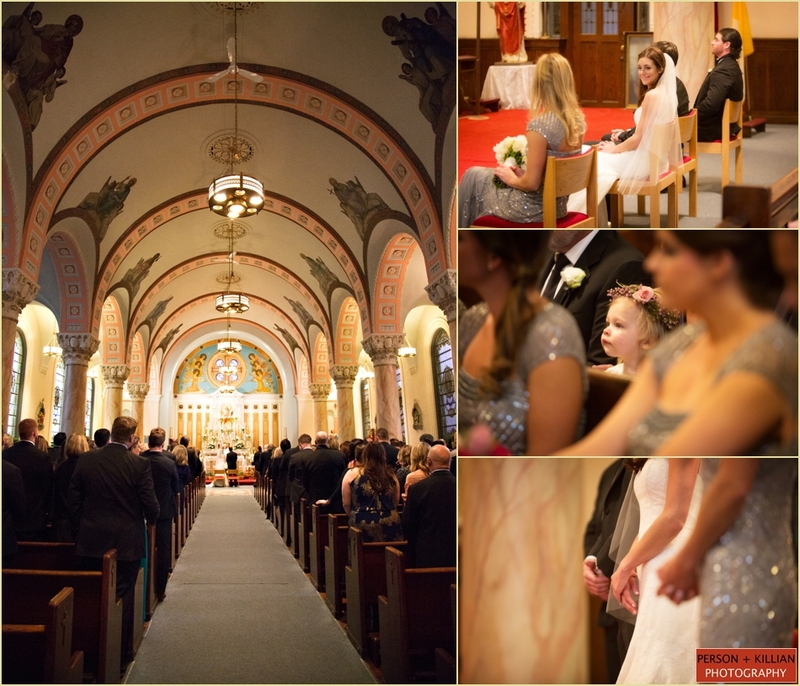 Once the full wedding party was ready to go, we journeyed to the Holy Name Parish in West Roxbury for Lindsey and Pat to say their “I do”s. 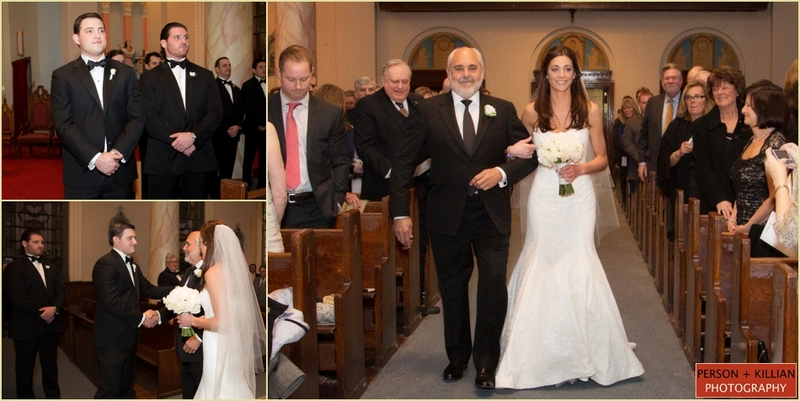 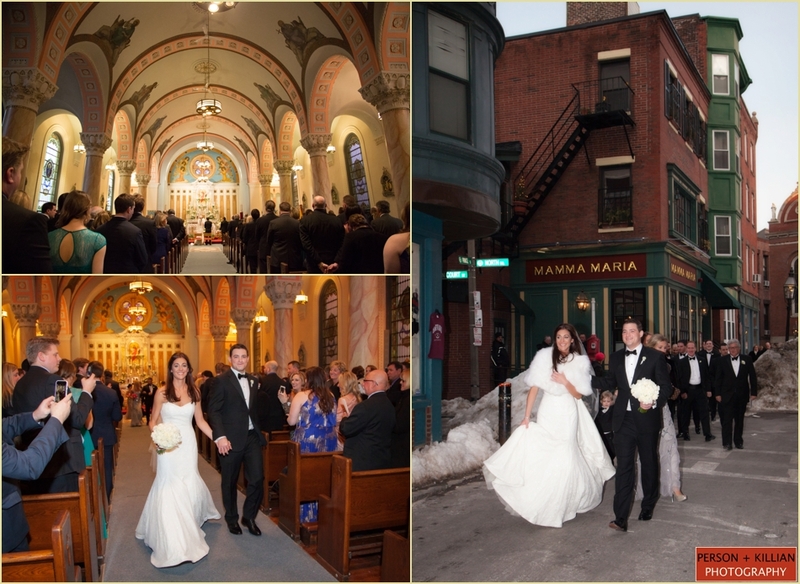 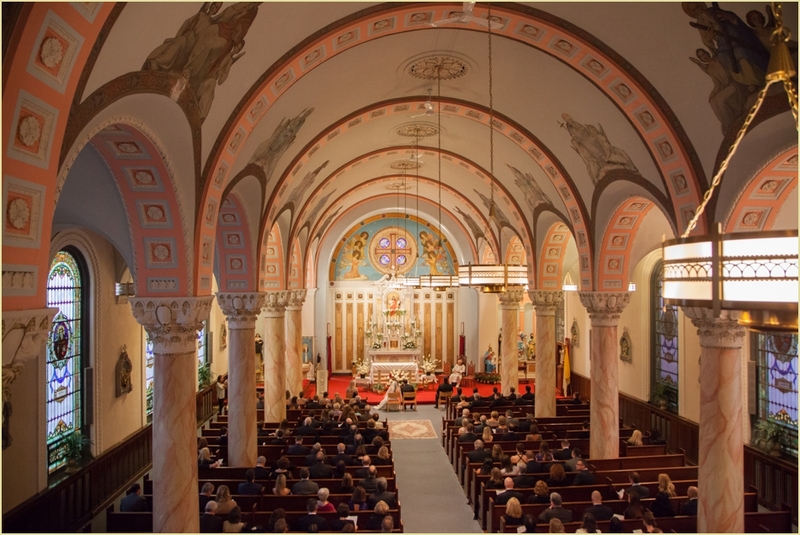 The couple become husband and wife in a full Catholic mass ceremony surrounded by family, friends, and loved ones. 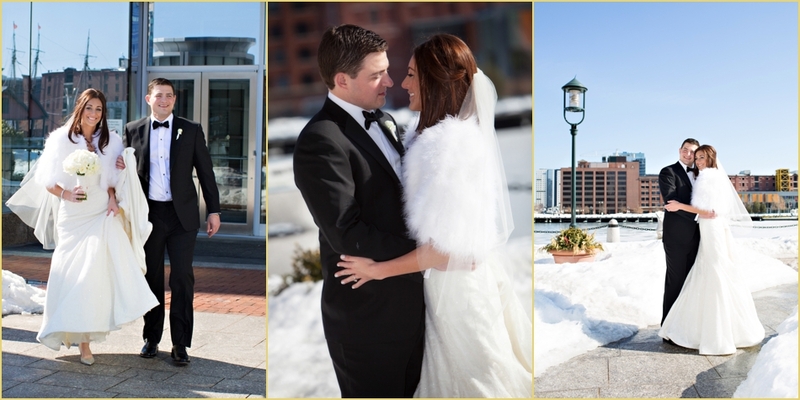 After the ceremony we took Lindsey and Pat back to a very special place — the exact spot on the seaport where Pat had proposed. 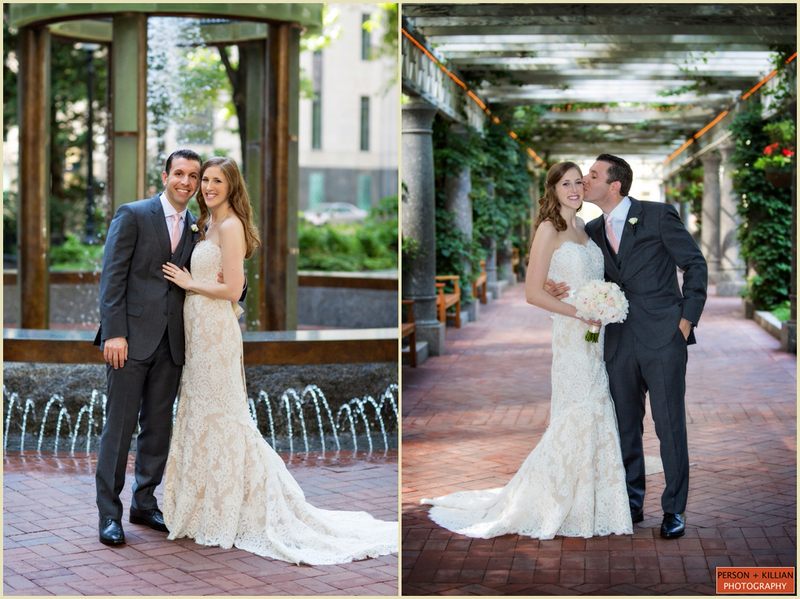 We took some beautiful photos of the new husband and wife along the Boston waterfront, then met up with the rest of the wedding party in Post Office Square for some formals with the whole group. 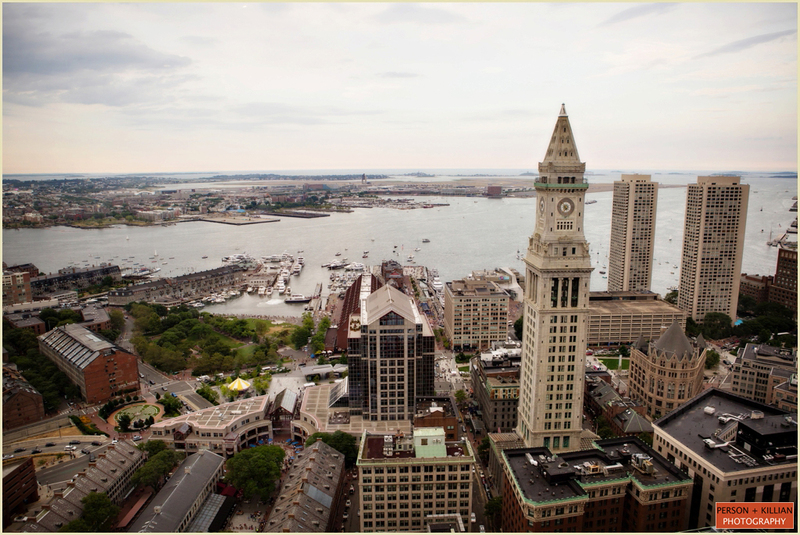 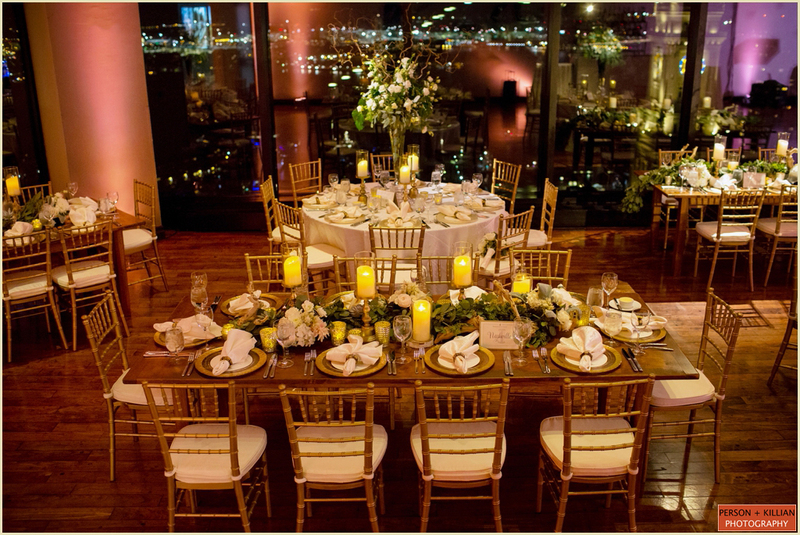 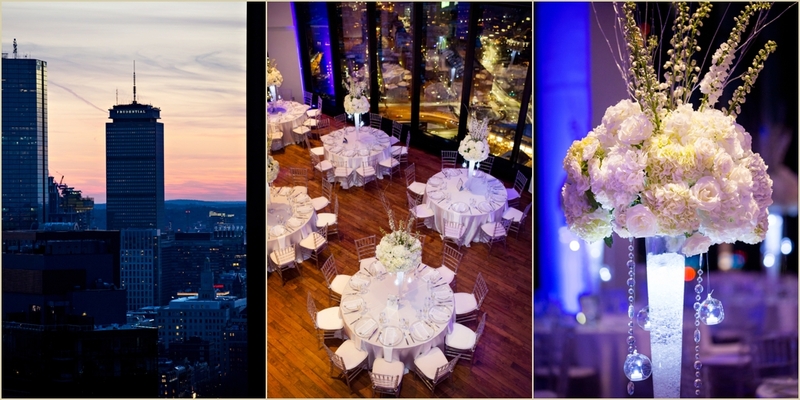 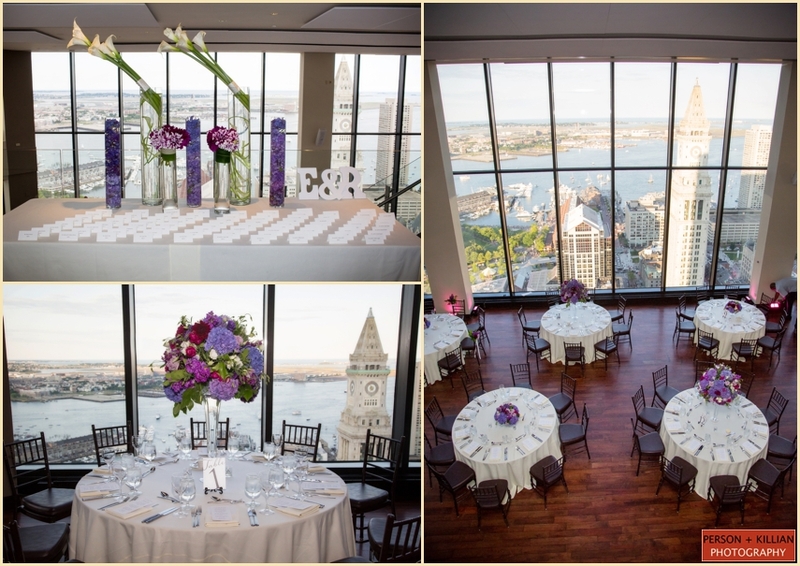 The evening celebration took place high above the city at the gorgeous State Room Boston. 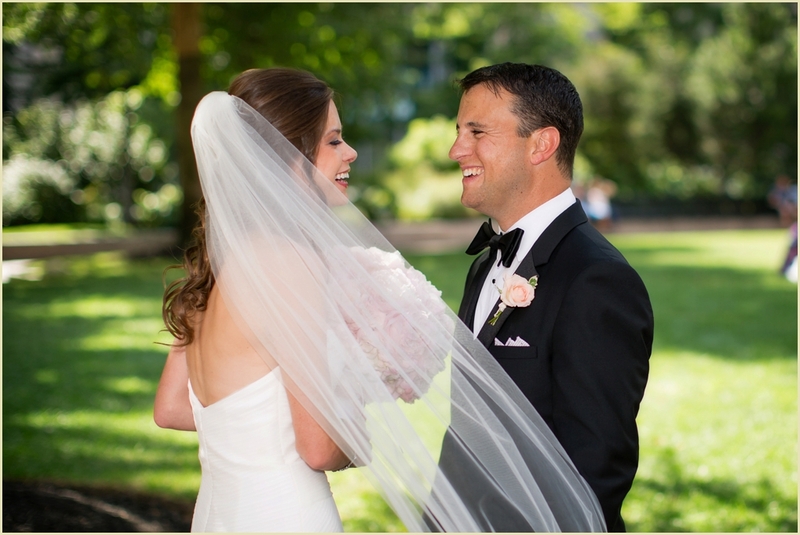 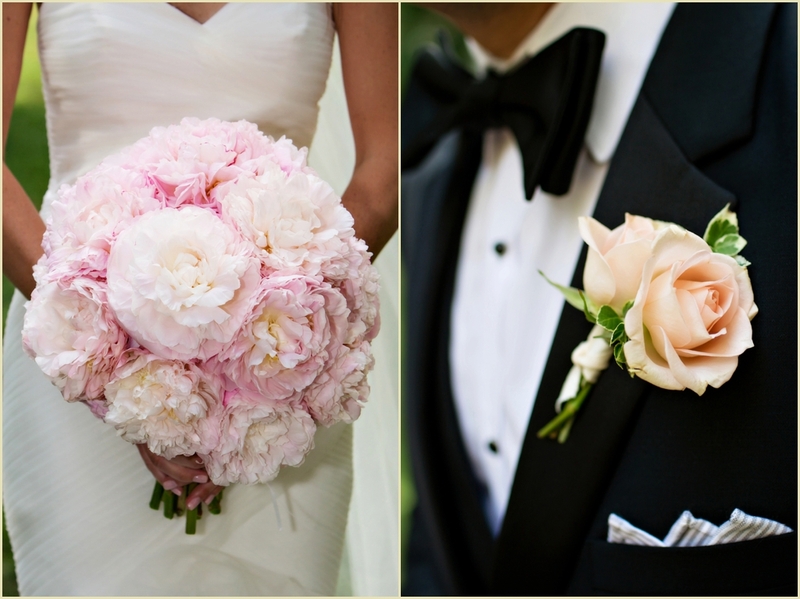 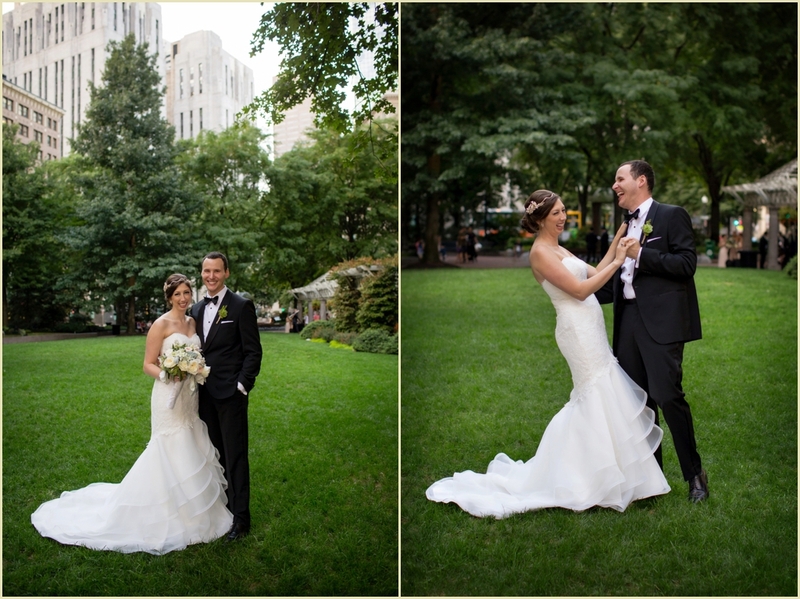 Lindsey and Pat’s vision for their wedding was glamorous and chic, capturing the spirit of a big city wedding. 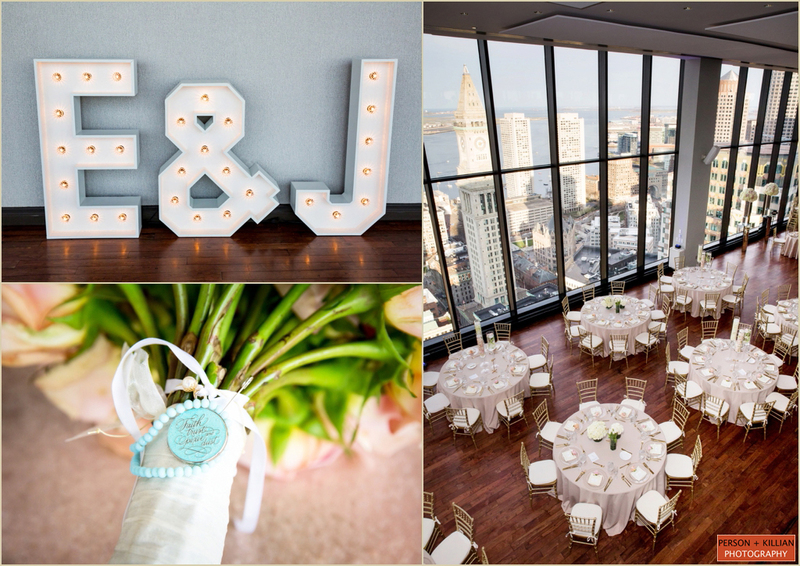 Overlooking the sunny skies and blue water of the seaport below, this State Room Boston wedding was everything they had dreamed of. 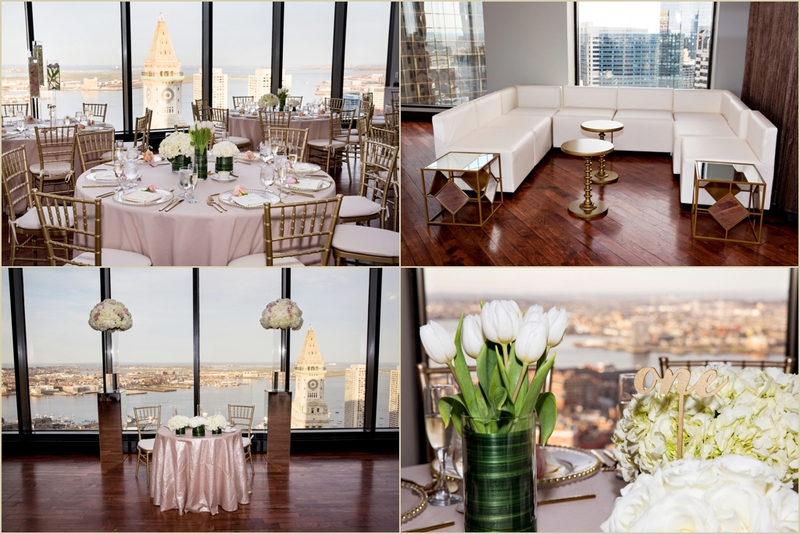 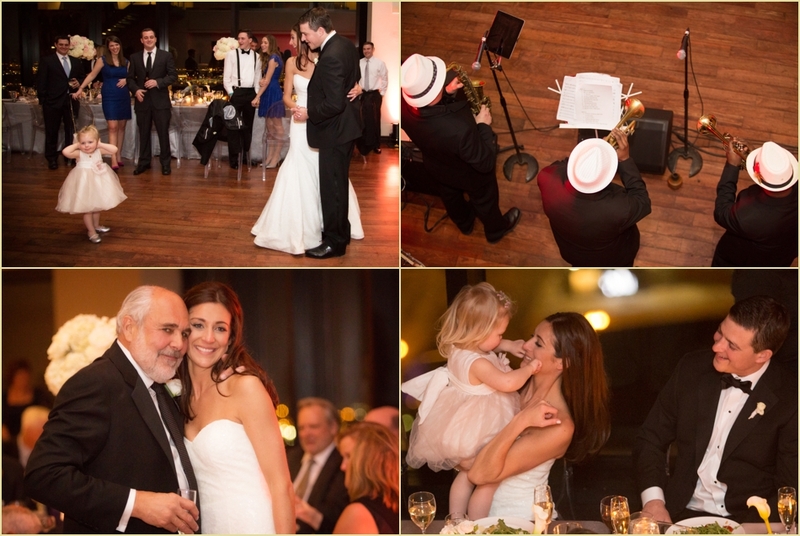 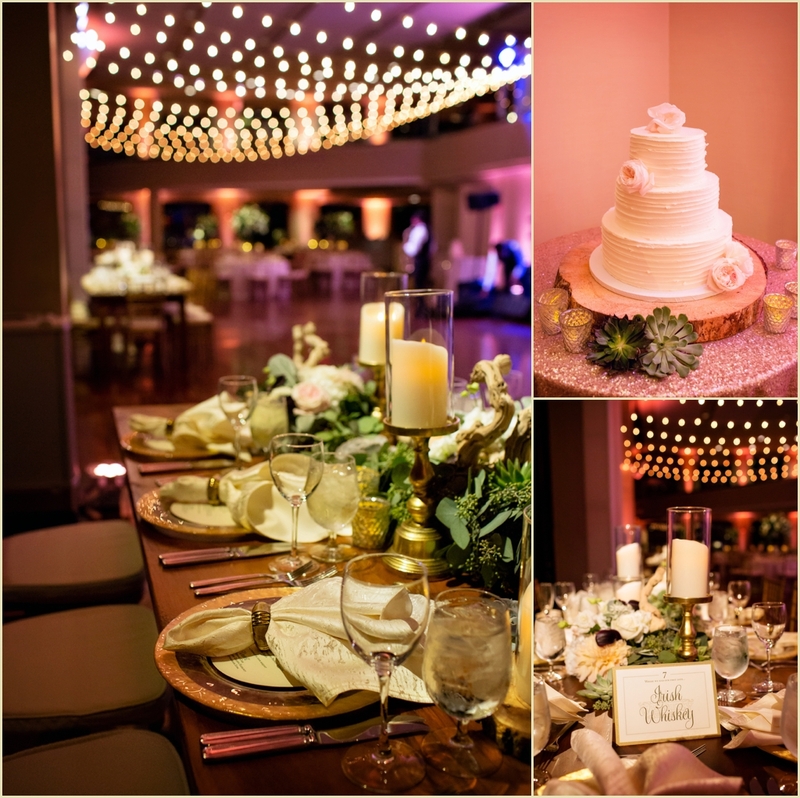 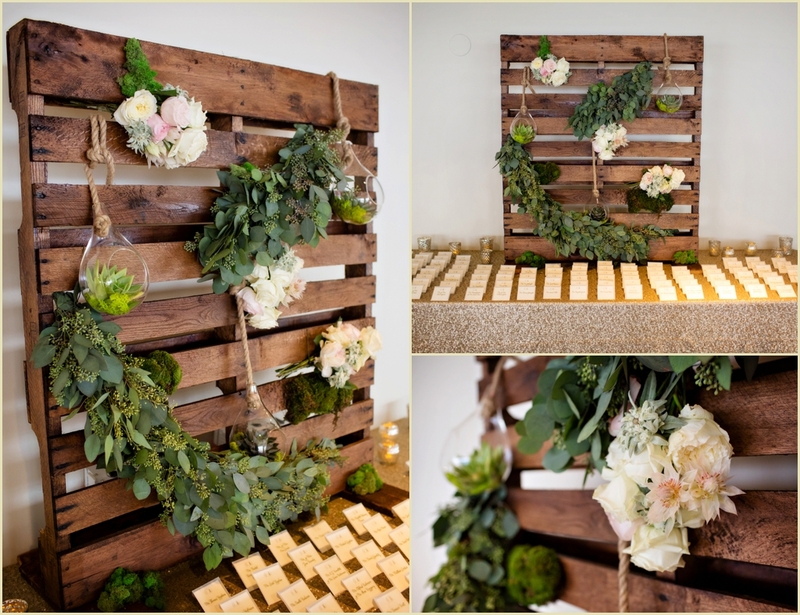 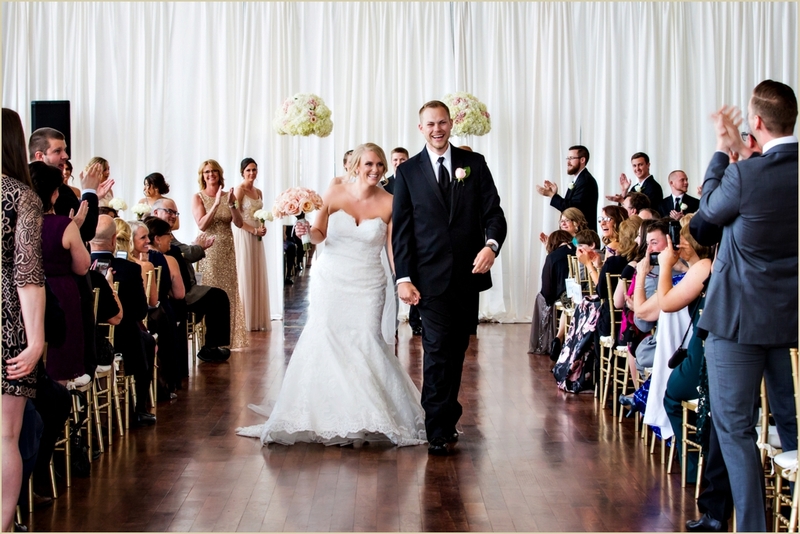 The decor was clean and elegant, with colors of white, black and pops of gold throughout the room. 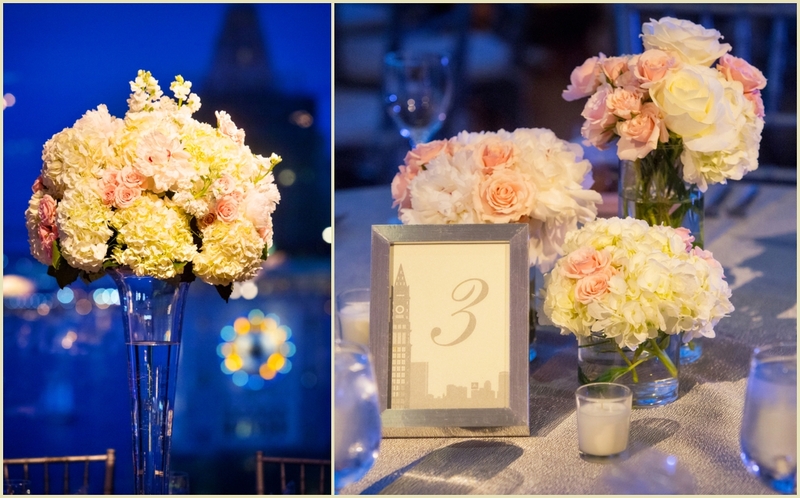 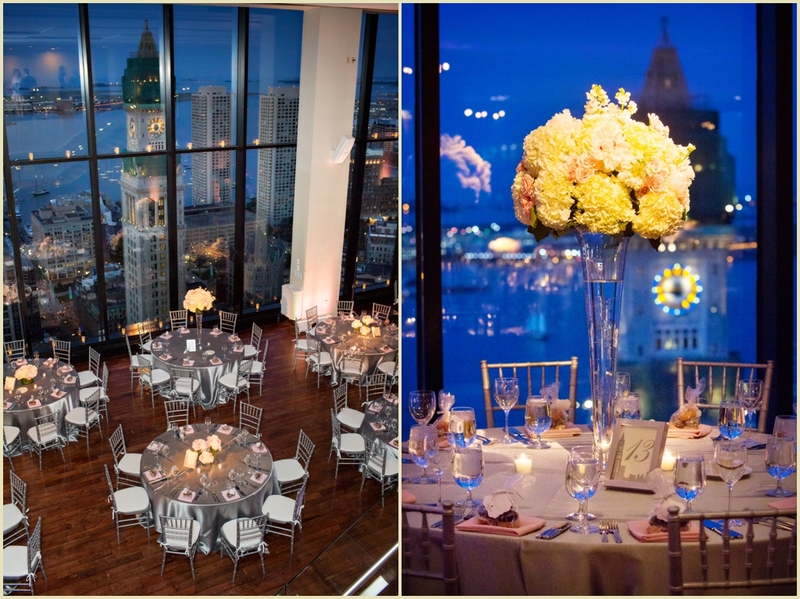 White floral arrangements stood tall on each table in clear crystal vases, and the floor-to-ceiling windows gave the guests an unbeatable view of the spectacular city. 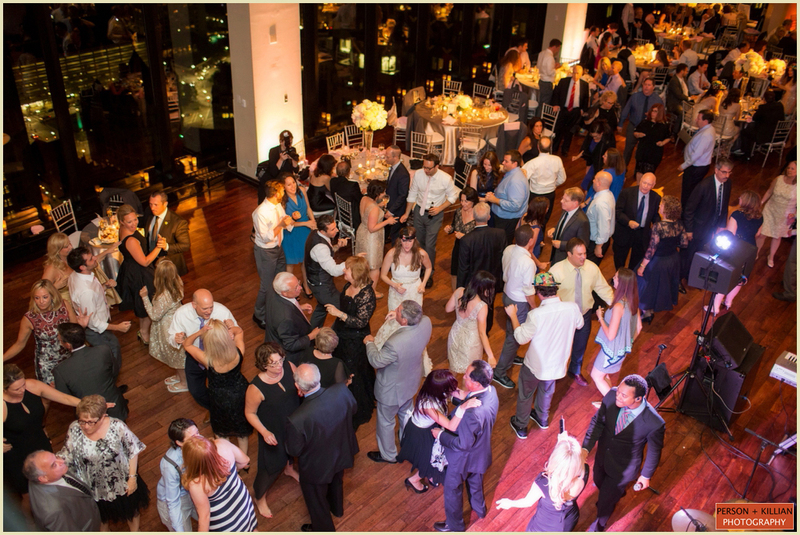 An evening of delicious food, heartfelt toasts, and an energetic dance floor kept this celebration going all night, and we were so thrilled to be there to capture it all. 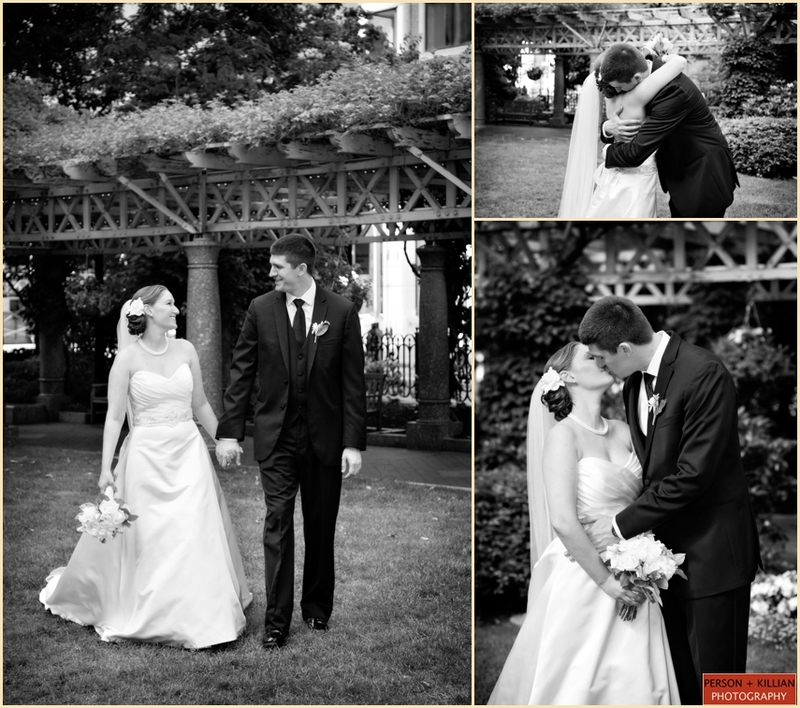 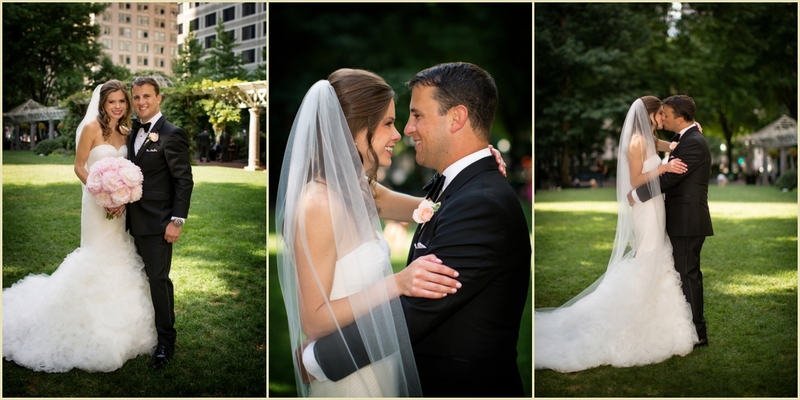 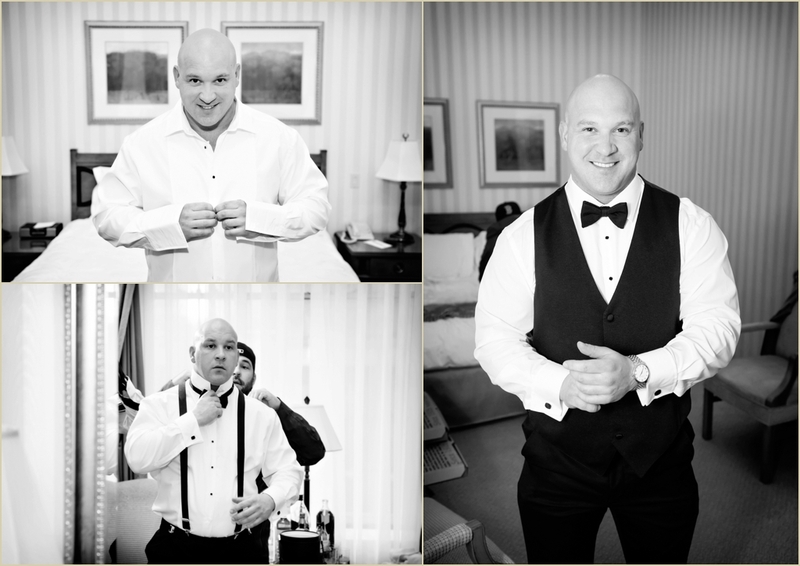 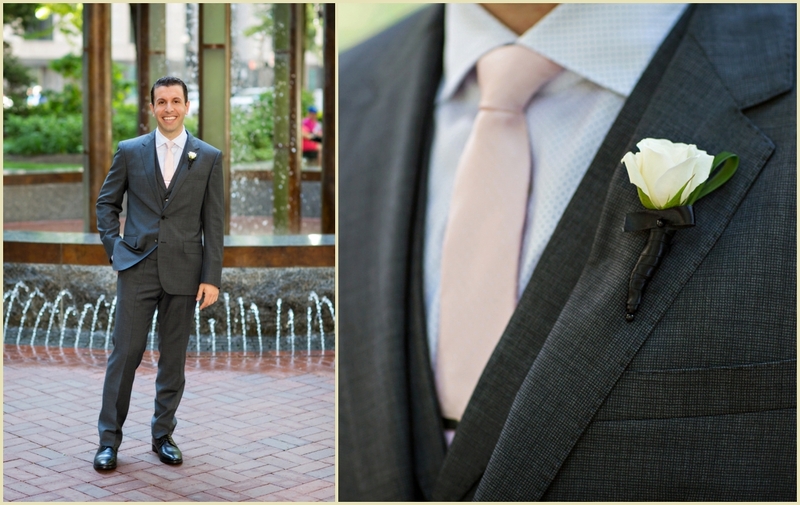 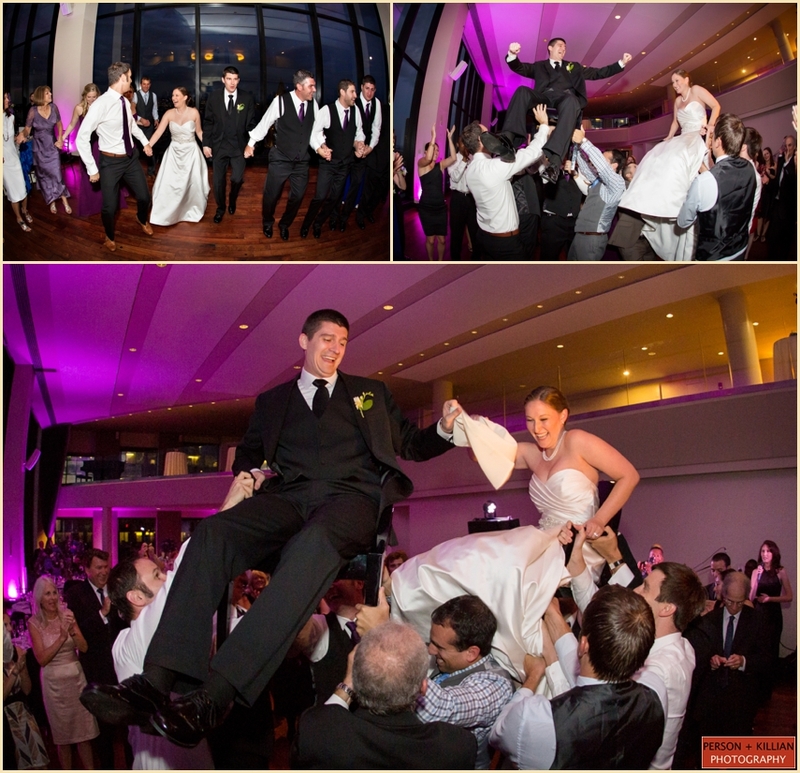 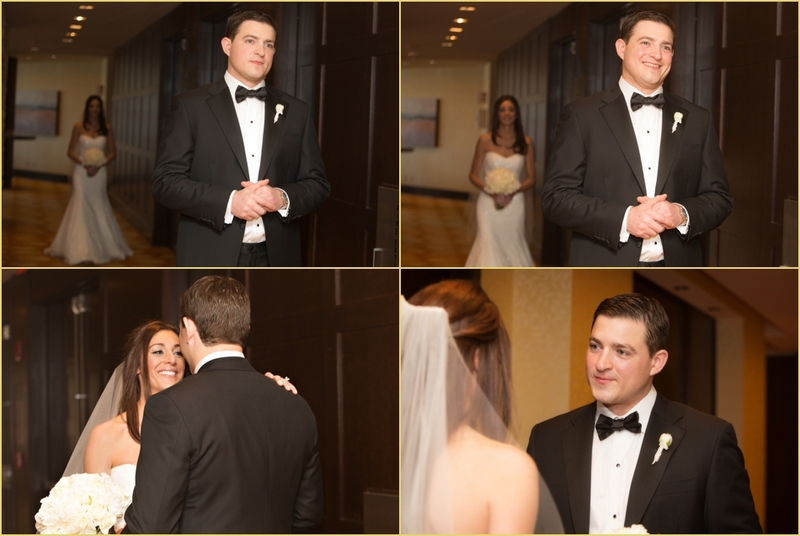 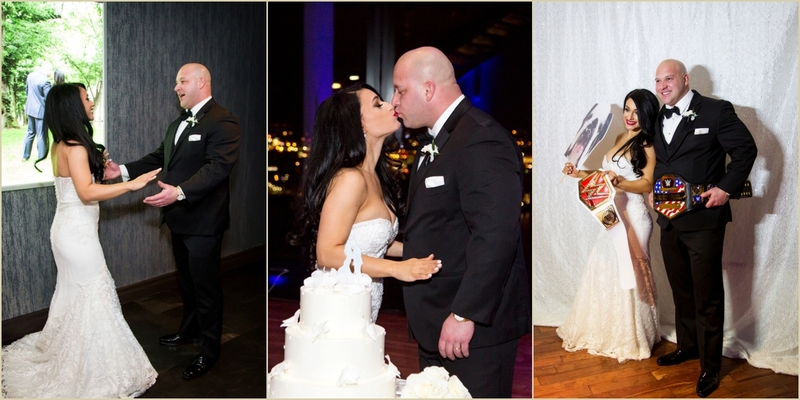 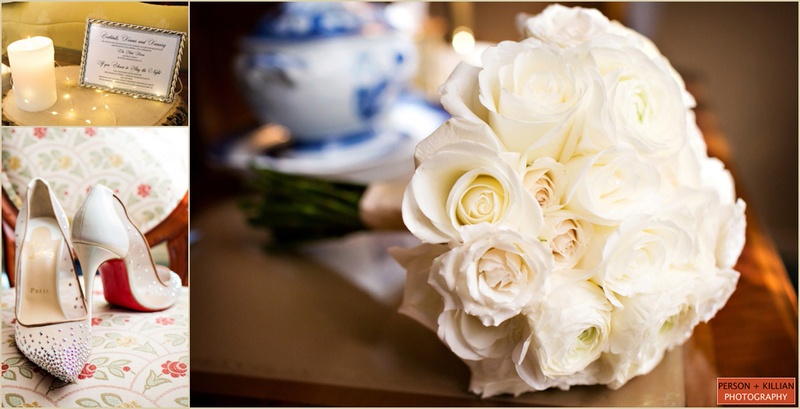 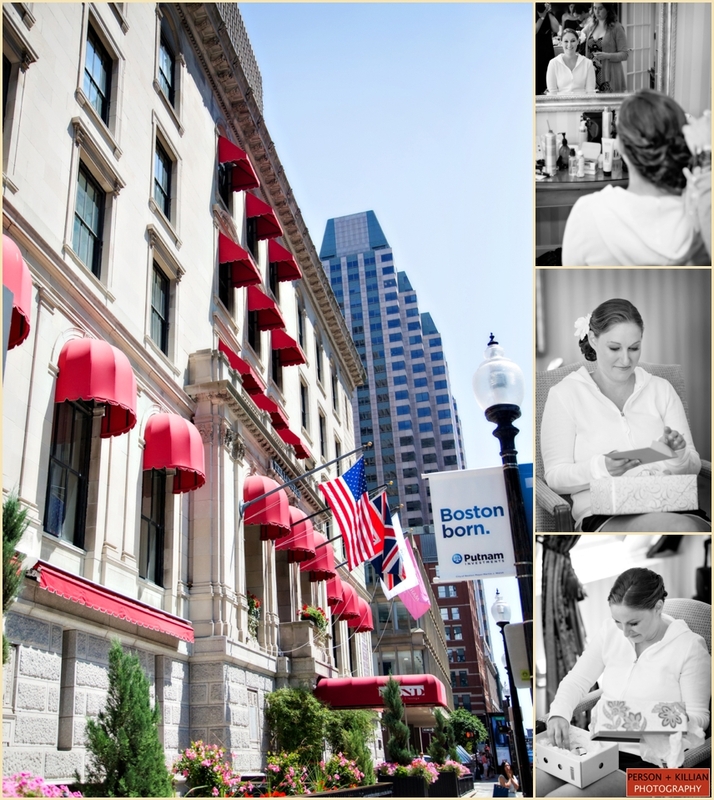 Recently, we had the pleasure of photographing the State Room Boston summer wedding of Stephanie and David. 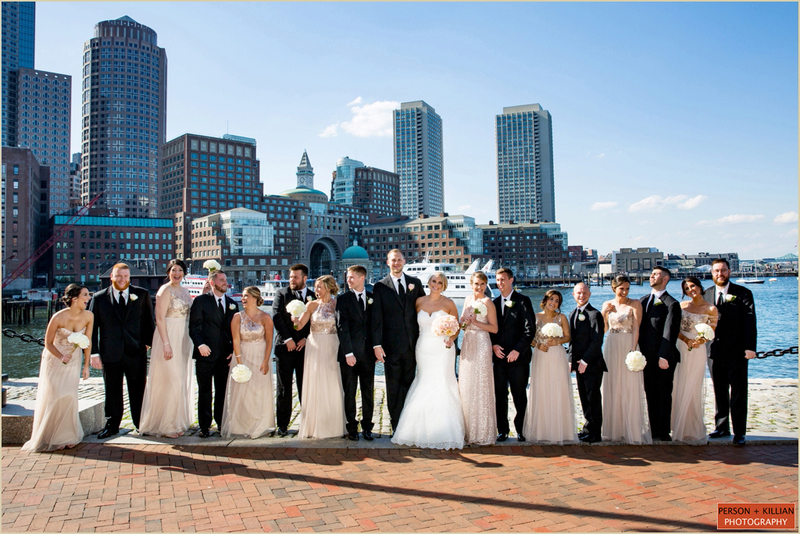 From the bride – “We are Boston. 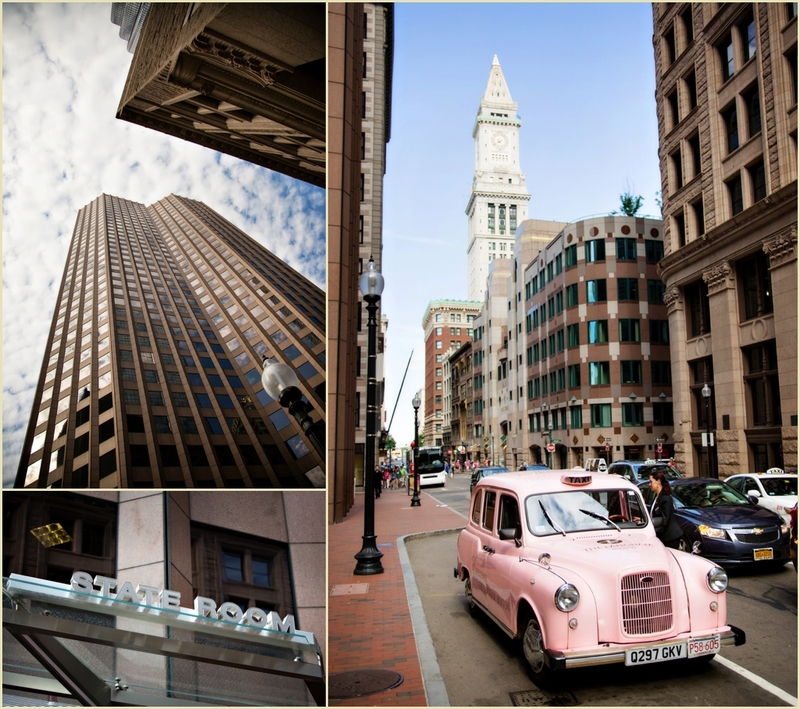 It is where we met (Scholar’s) and where we live (Southie). 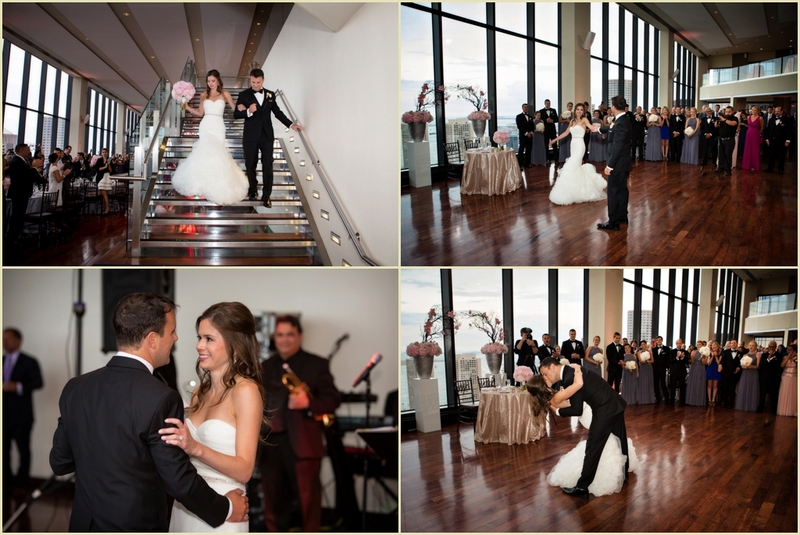 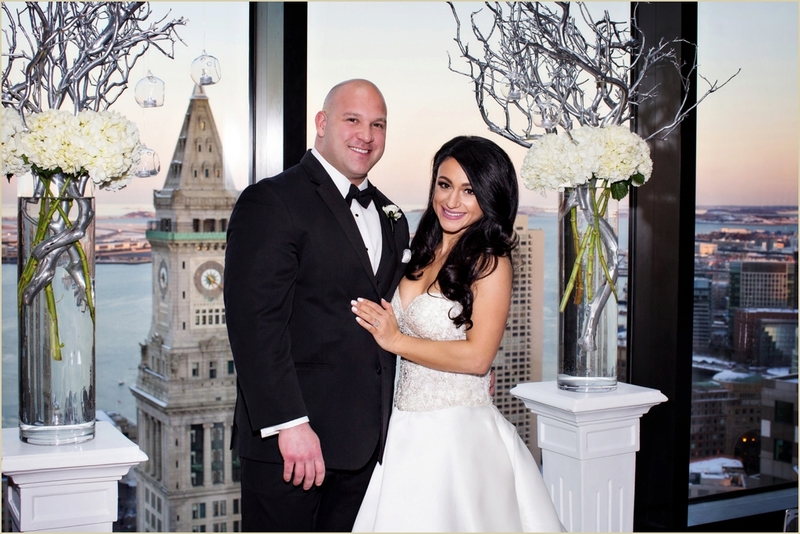 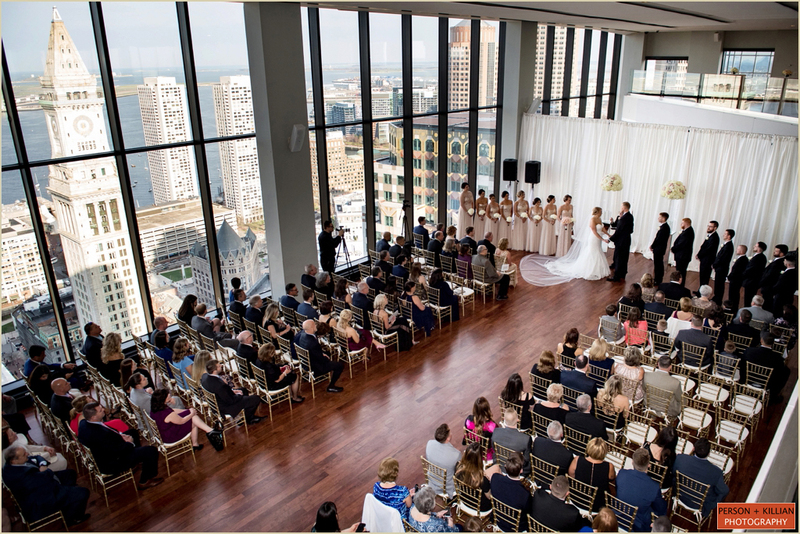 We wanted a personal wedding that was true to us and asked our close friend to marry us.” With sweeping views of the city, the State Room was the perfect location to showcase their beloved home town. 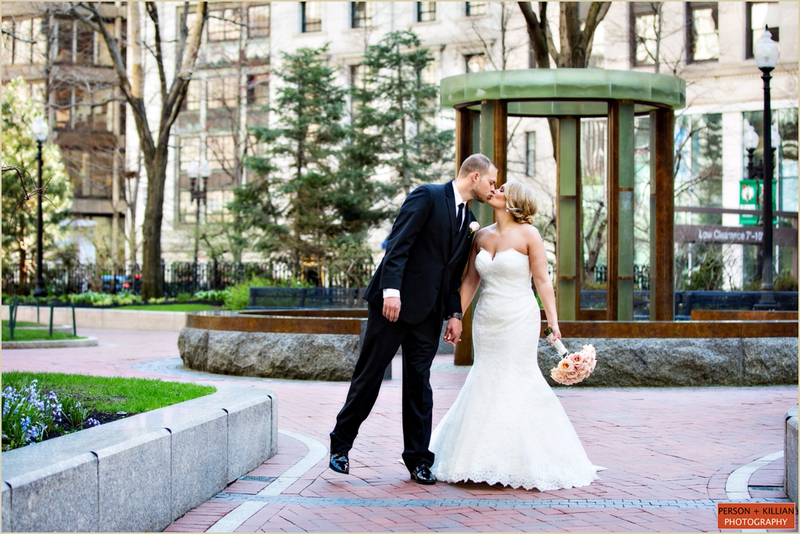 After getting ready at the nearby Langham Hotel, we walked across the street to picturesque Post Office Square. 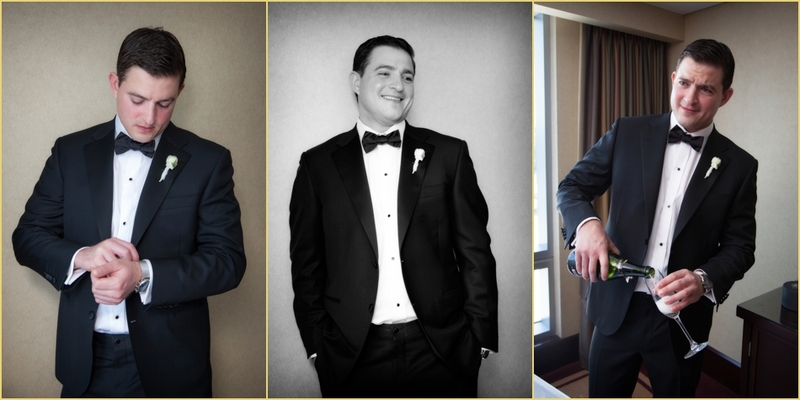 Waiting for the bride for their first look alongside Dave was their beloved dog Manny (who made an appearance at their engagement sessions earlier this year). 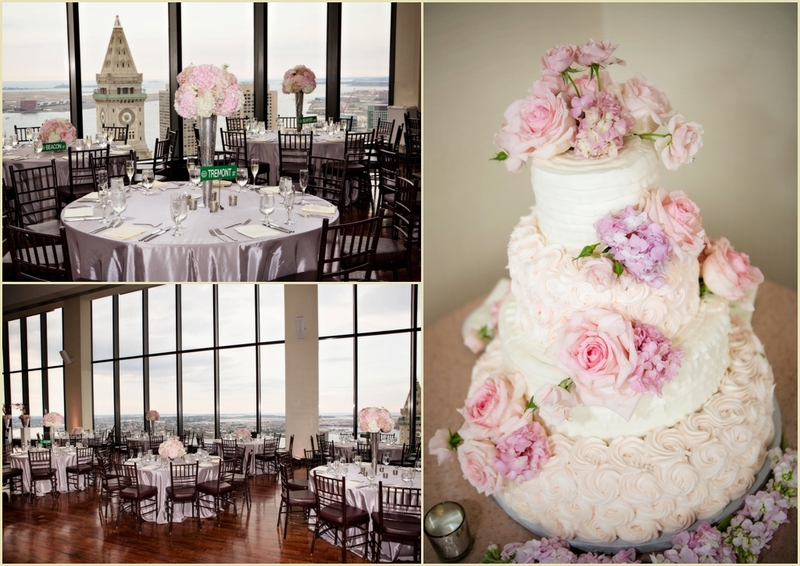 Steph also wanted to incorporate her love for the color pink and went with a soft pink and grey color pallet for the day. 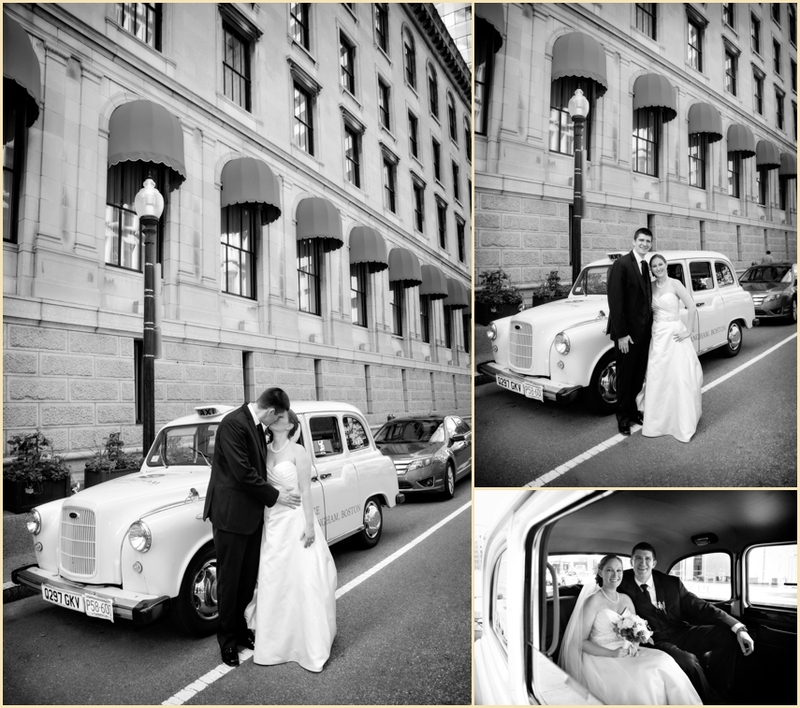 As a surprise, the parents of the bride had the pink taxi from the Langham to drive the bride over to State Street. 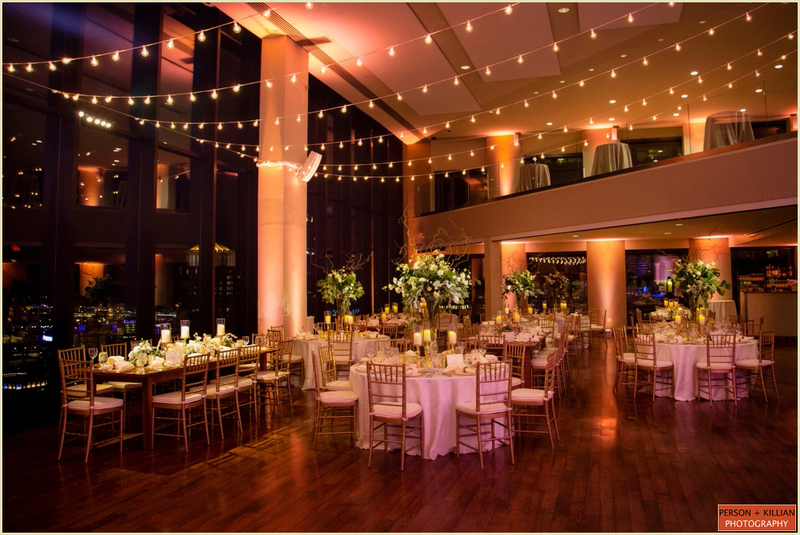 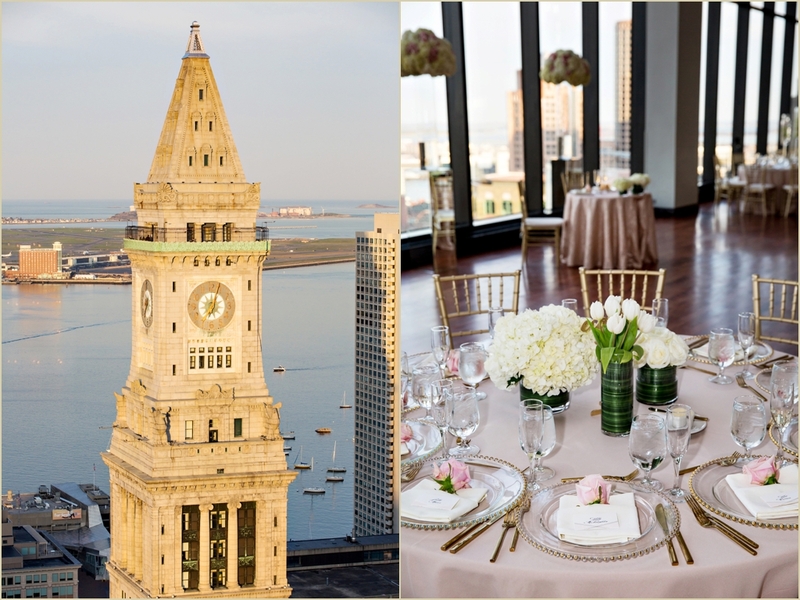 The ceremony and reception took place in the Great Room where guests watched the sunset over the Boston Harbor as they enjoyed dinner and heartfelt toasts. 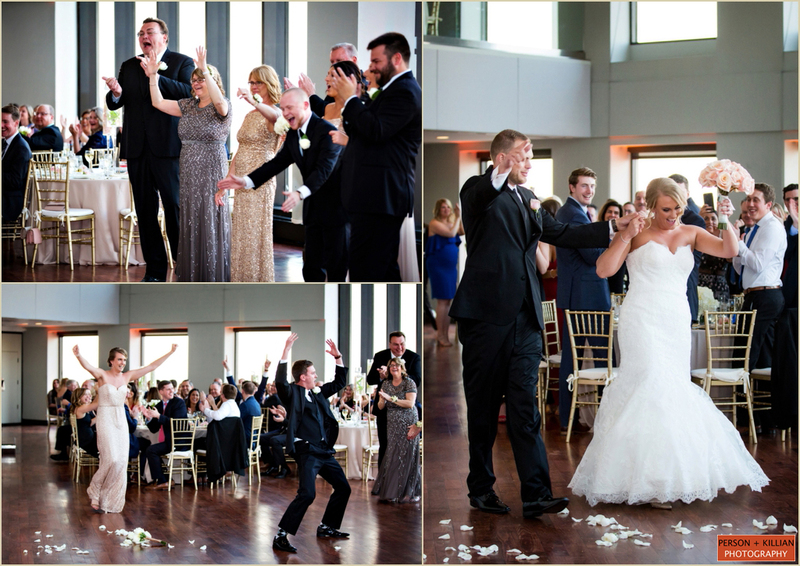 Joey Scott and the Connection had the room dancing and celebrating for the rest of the evening. 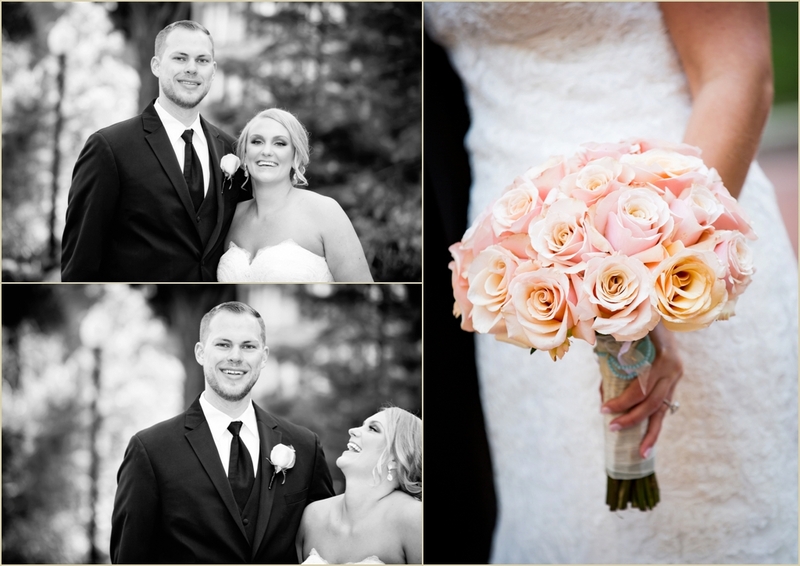 Congratulations Steph and Dave and thank you for being such a pleasure to work with on your beautiful day! 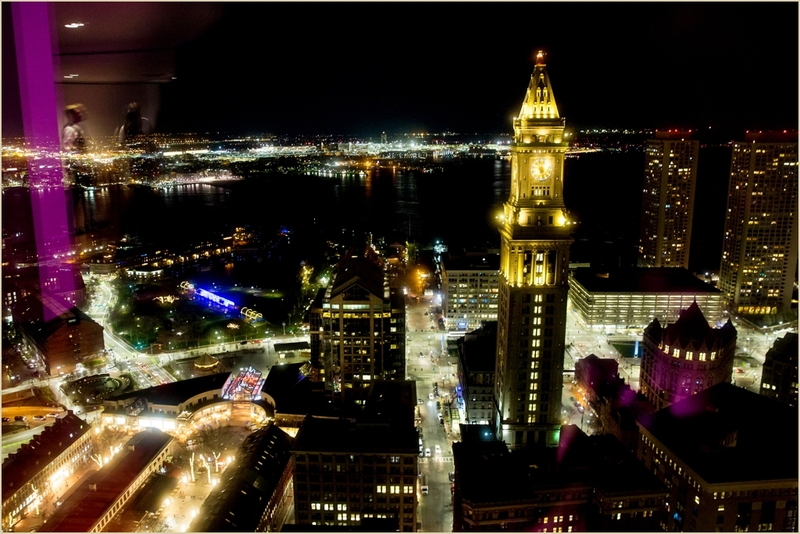 Also a big thank you to the always amazing team at State Room Boston. 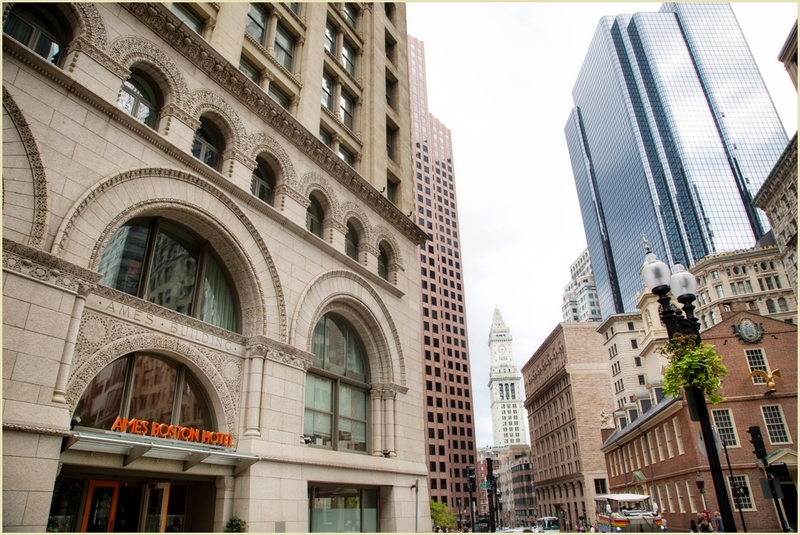 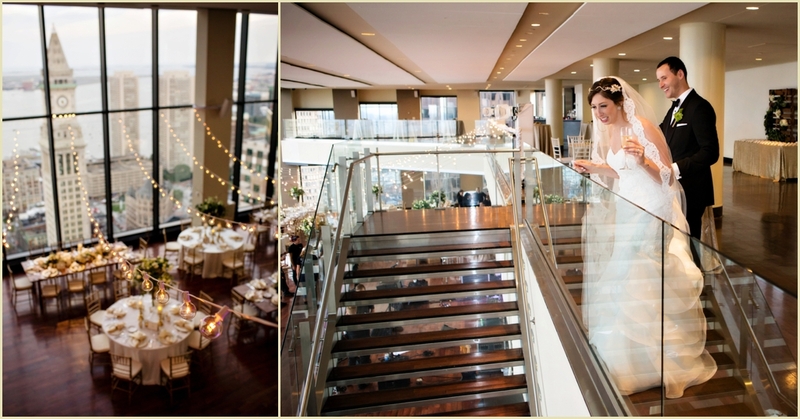 The State Room is an incredibly photogenic venue, and we were thrilled to return there to photograph the downtown Boston wedding of Stacey and Evan. 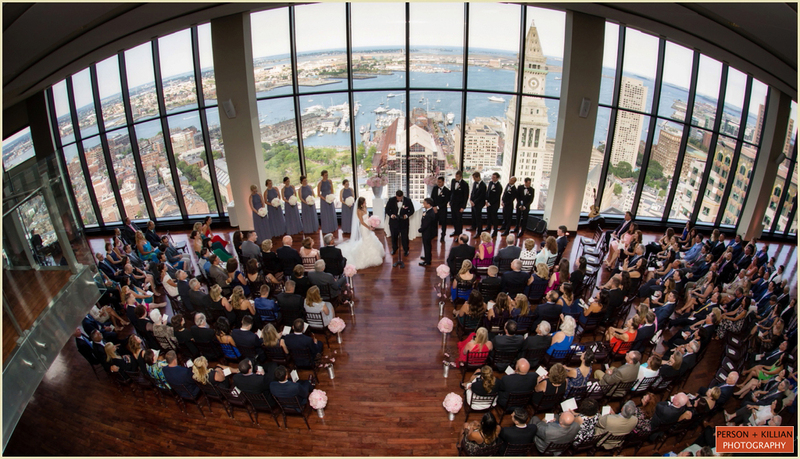 These newlyweds love Boston, and wanted a wedding that encapsulated all the beautiful and unique experiences the city has to offer. 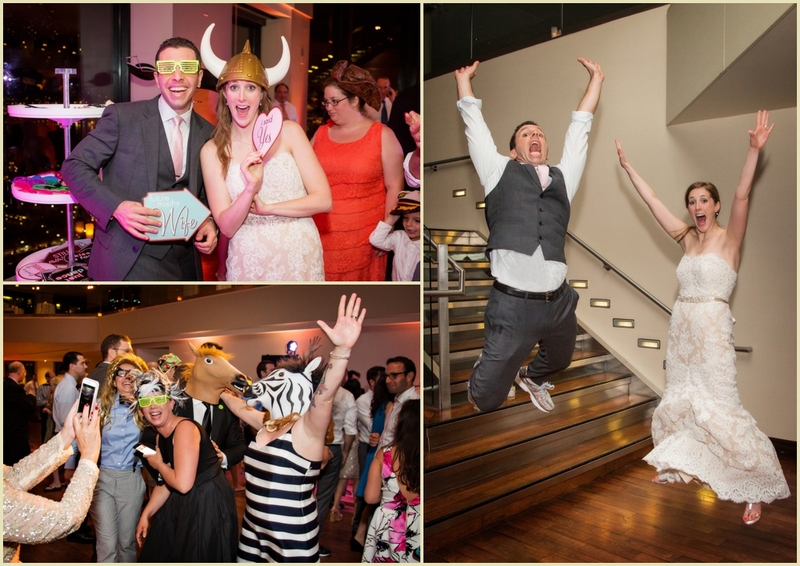 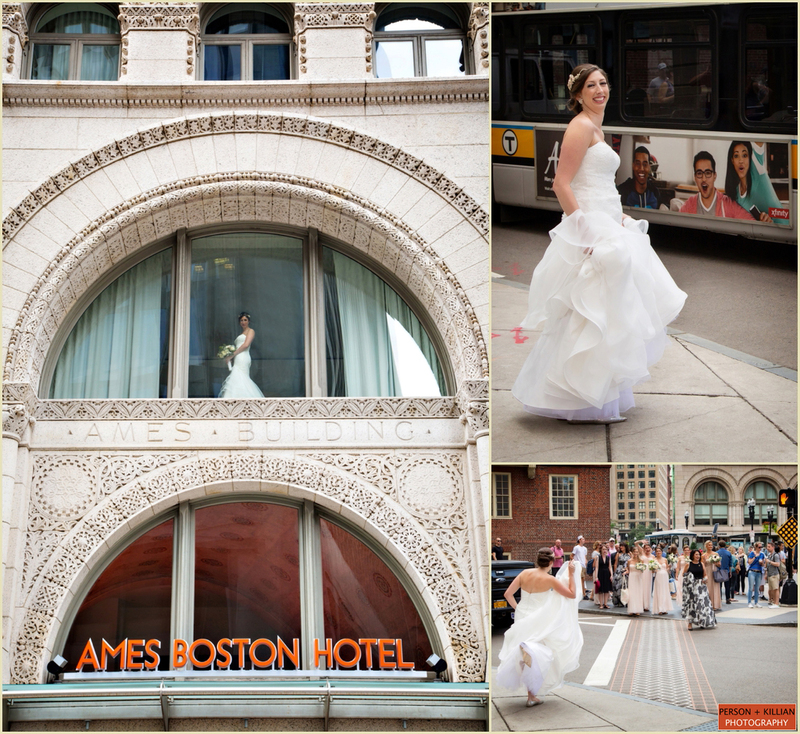 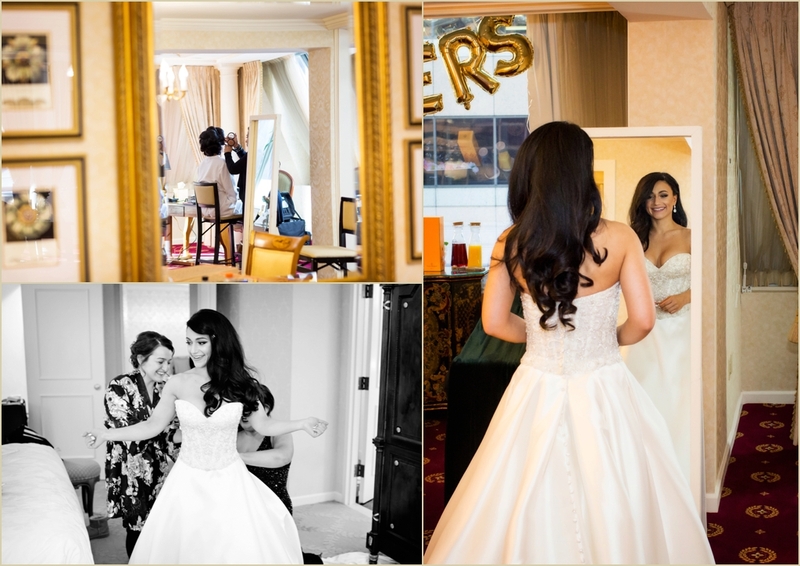 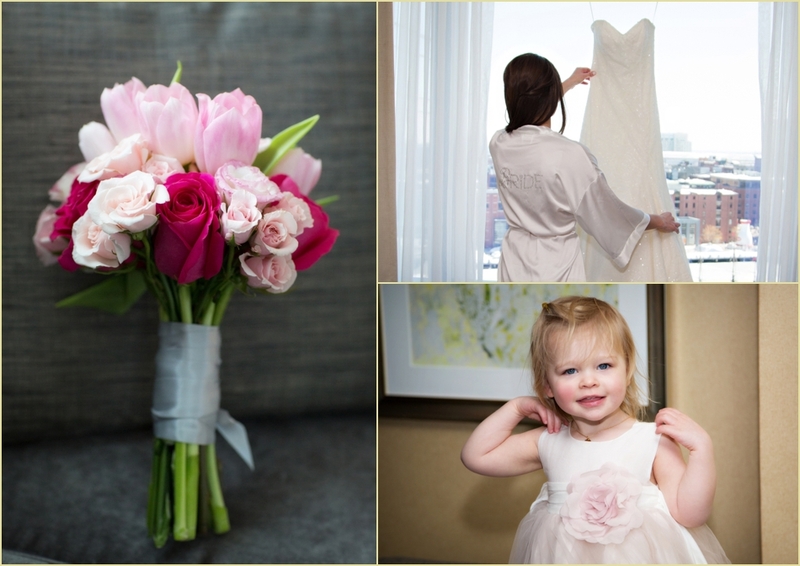 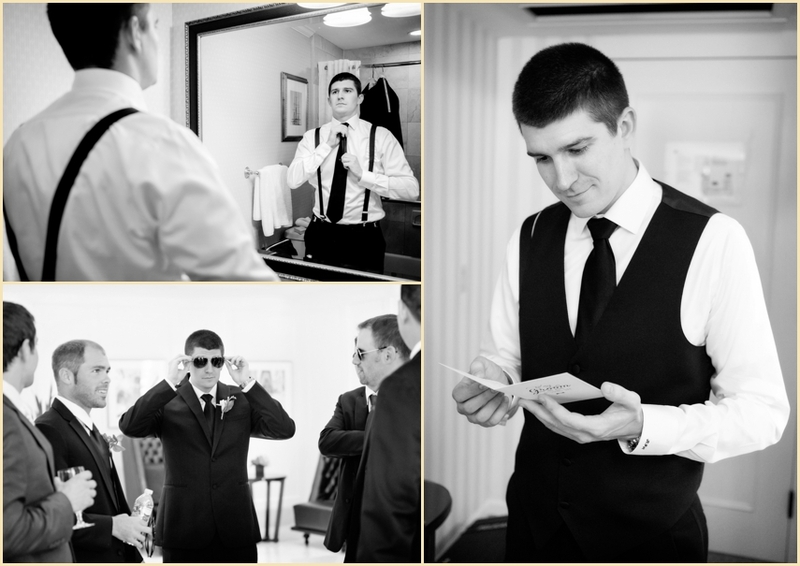 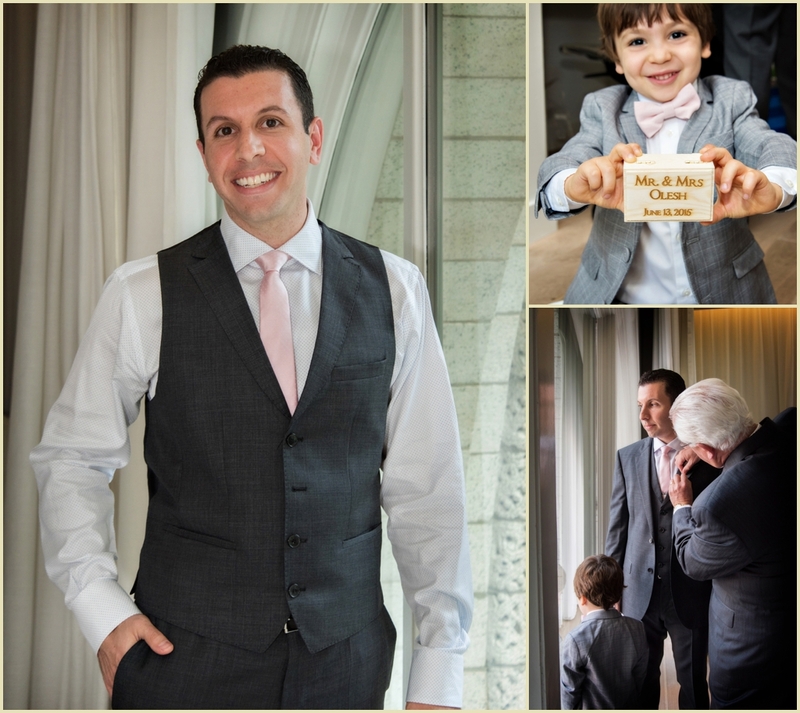 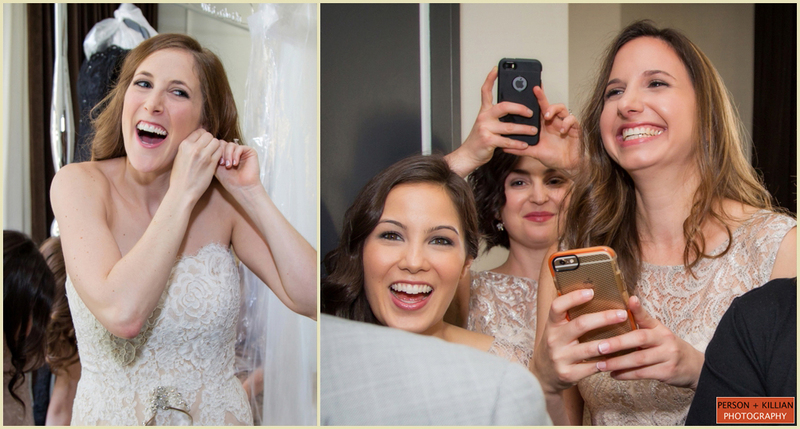 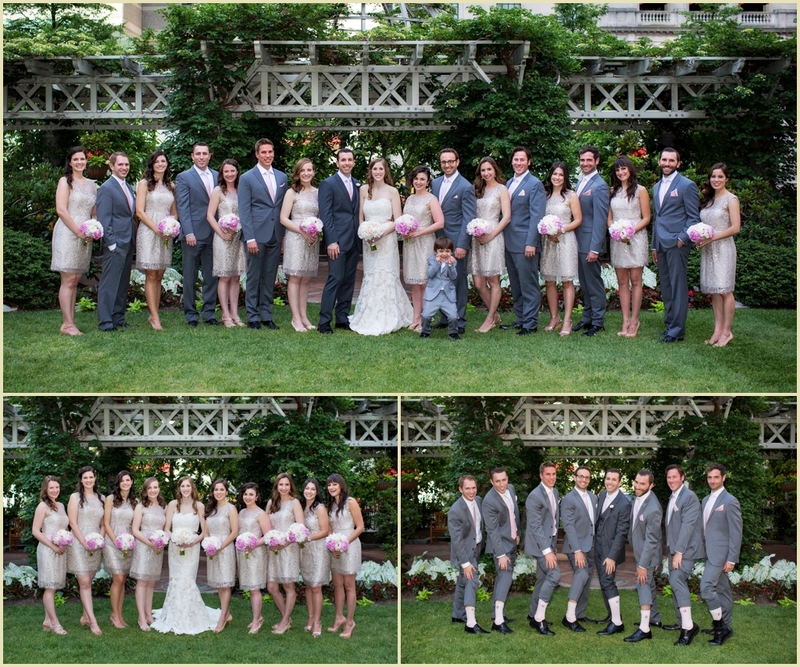 From getting ready at the stately Ames Boston Hotel to first look and formal photographs in Post Office Square, Stacey and Evan’s wedding really embodied the flavor of the city (literally, with favors from the famously creative South End Blackbird Doughnuts, and cupcakes from Wicked Good Cupcakes!). 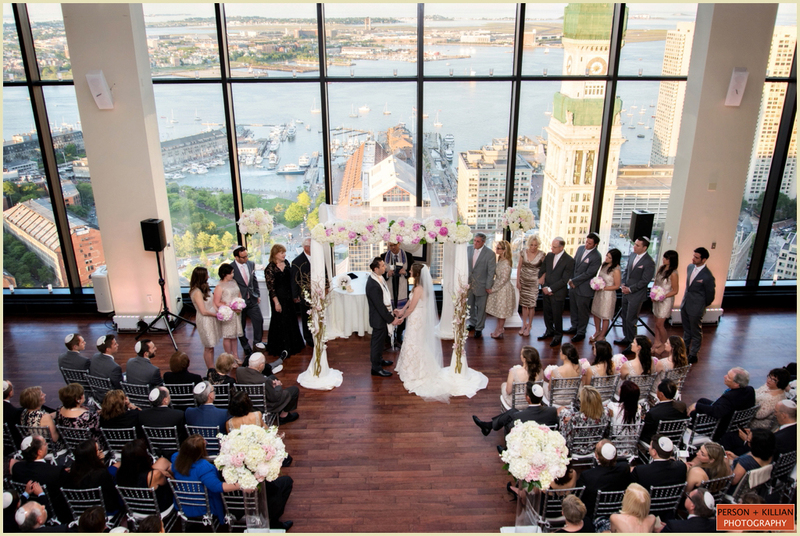 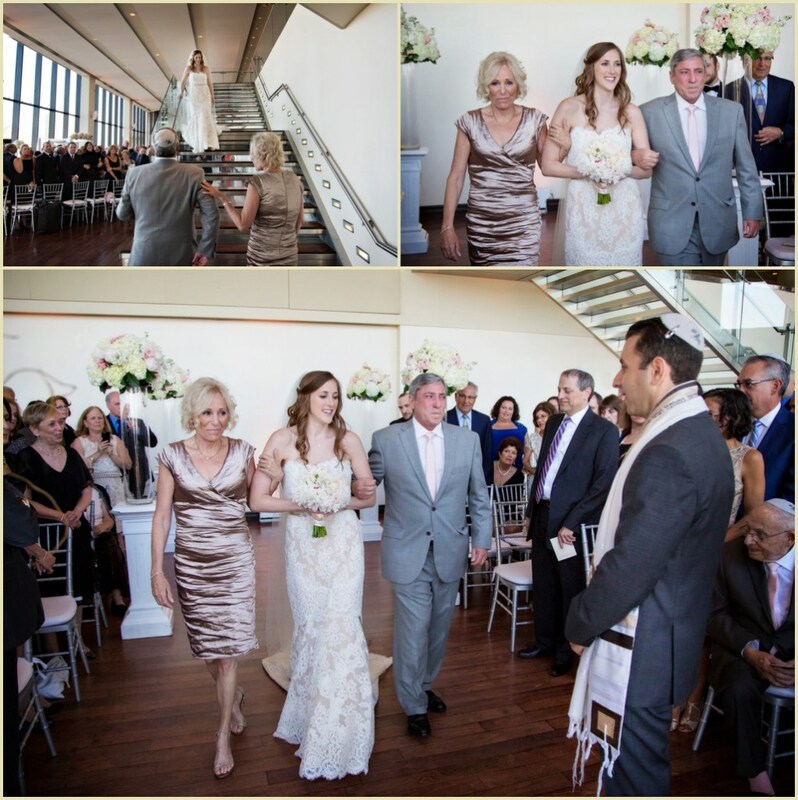 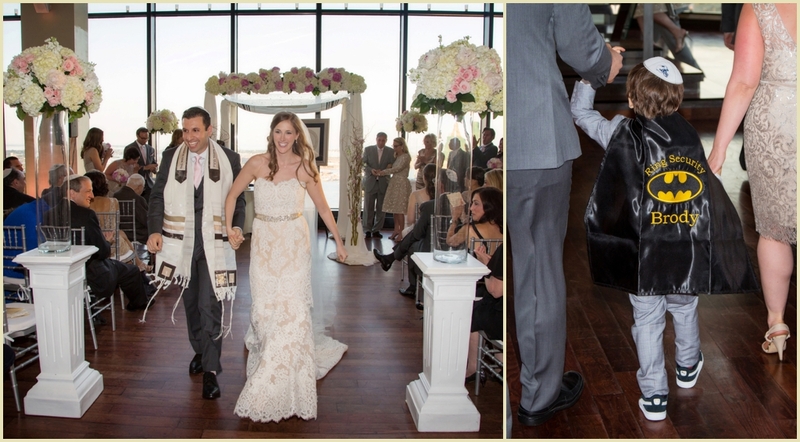 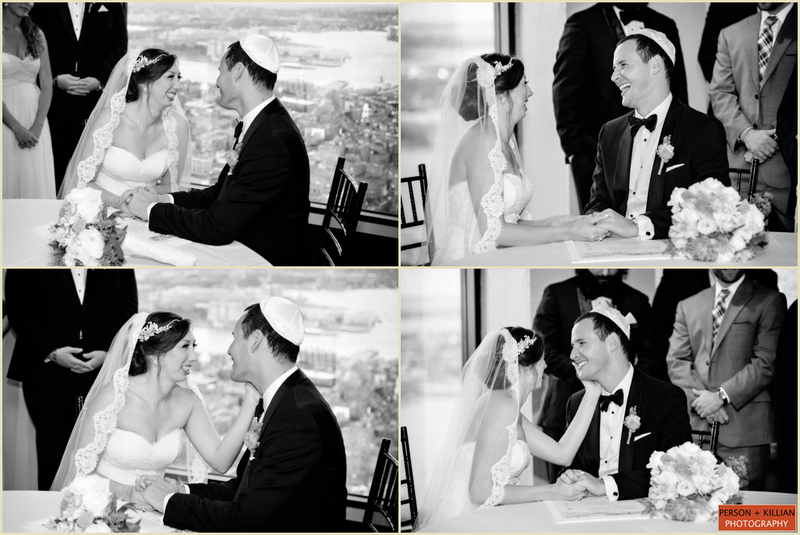 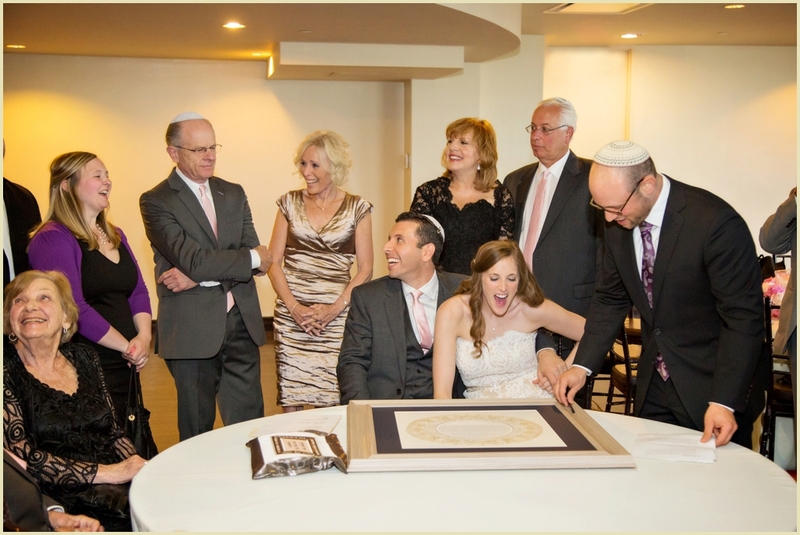 The couple had a beautiful traditional Jewish ceremony, with a floral chuppah and panoramic views of the historic Boston waterfront. 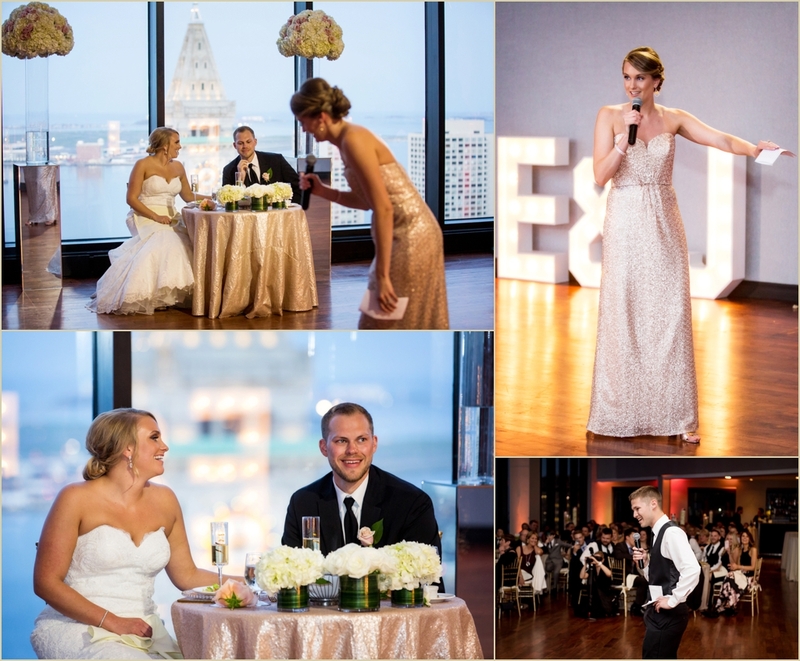 Congratulations Stacey and Evan! 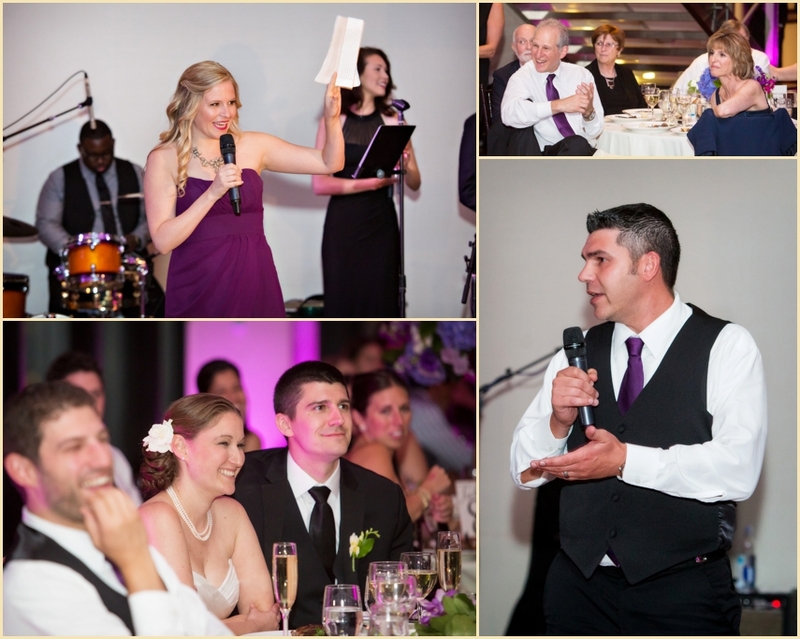 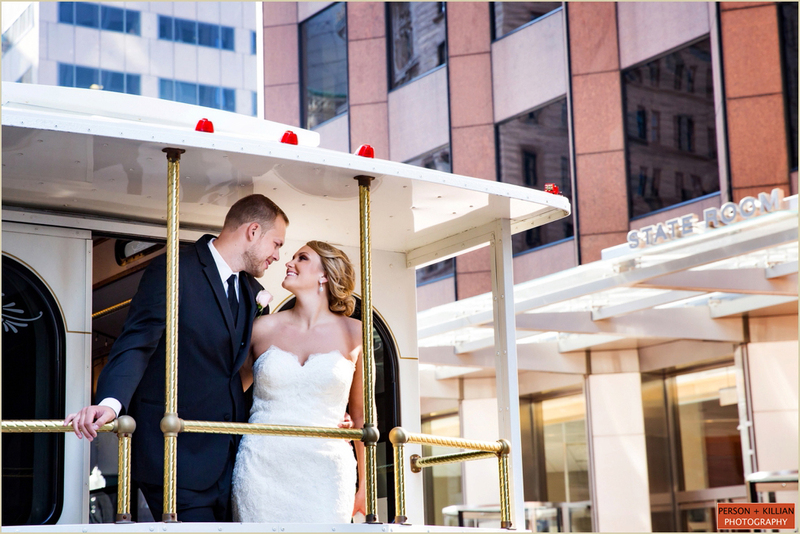 Thank you for choosing Person + Killian to be a part of your celebration! 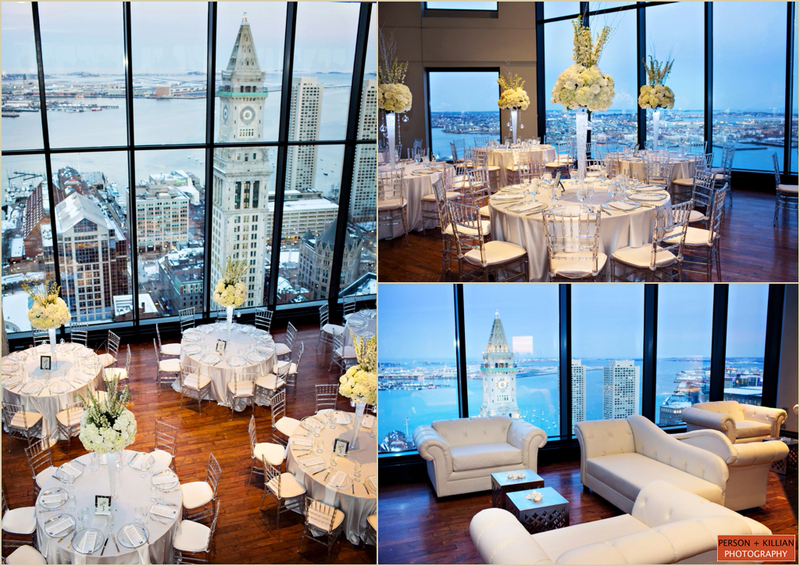 Venue: The State Room Boston; Hair: Stacey Frasca; Invitations/Paper Products: Gus & Ruby Letterpress; Dress: Anne Barge for Nordstrom Bridal; Flowers: Madison Floral; Cake: Wicked Good Cupcakes; Linens: Rentals Unlimited; Lighting: SociaLight; Entertainment: Nightshift; Video: Meghan Corbett. 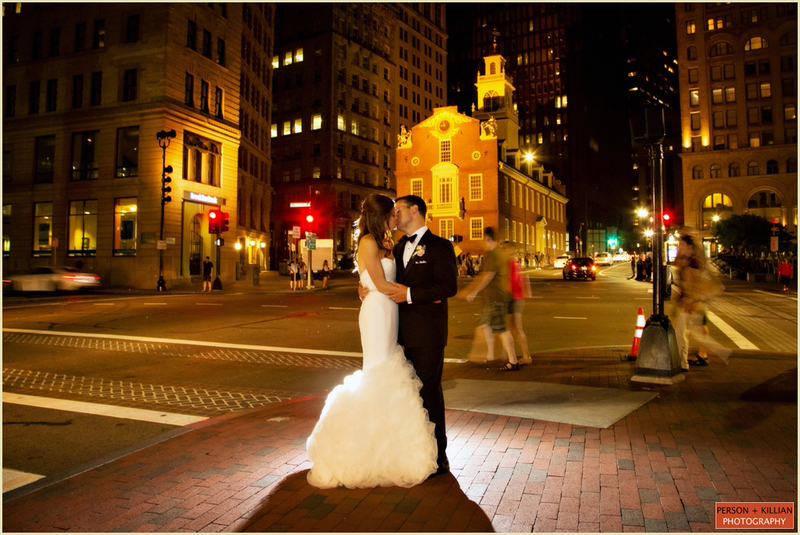 When Liz and Rob were looking for their perfect Boston wedding venue, they wanted a location that really showcased the beauty of the city. 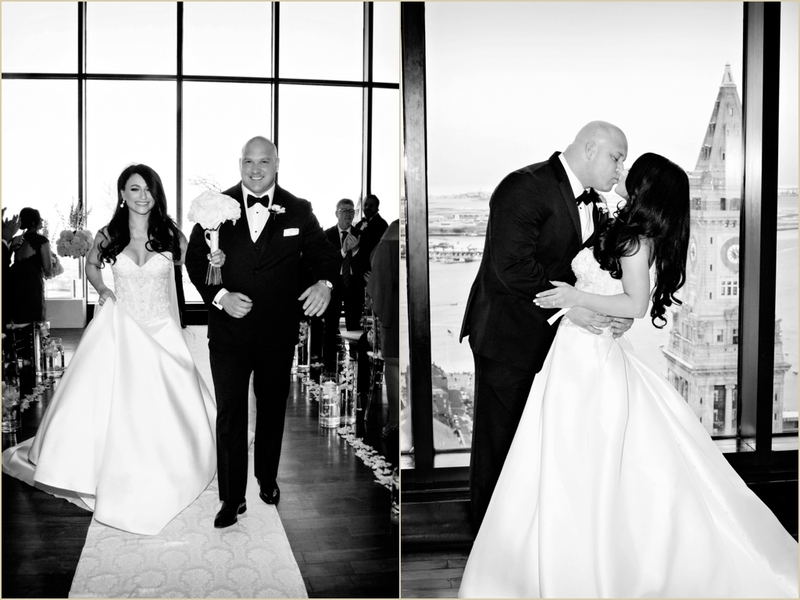 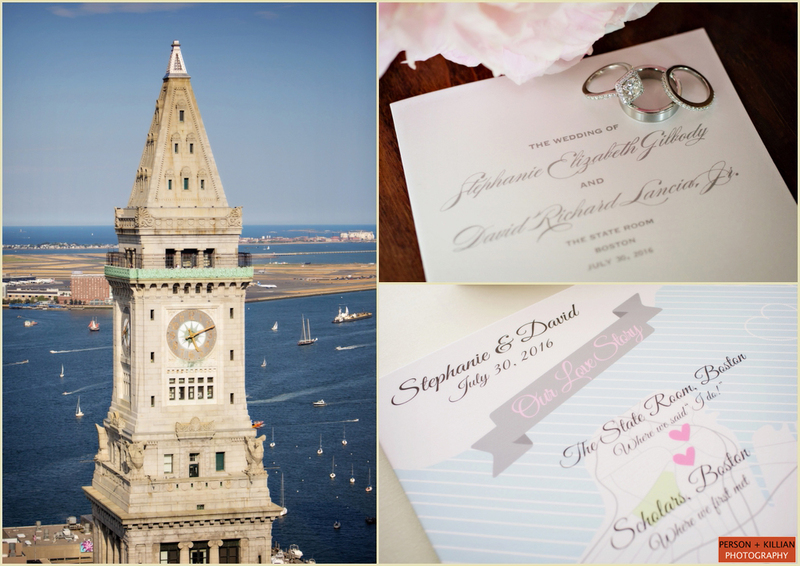 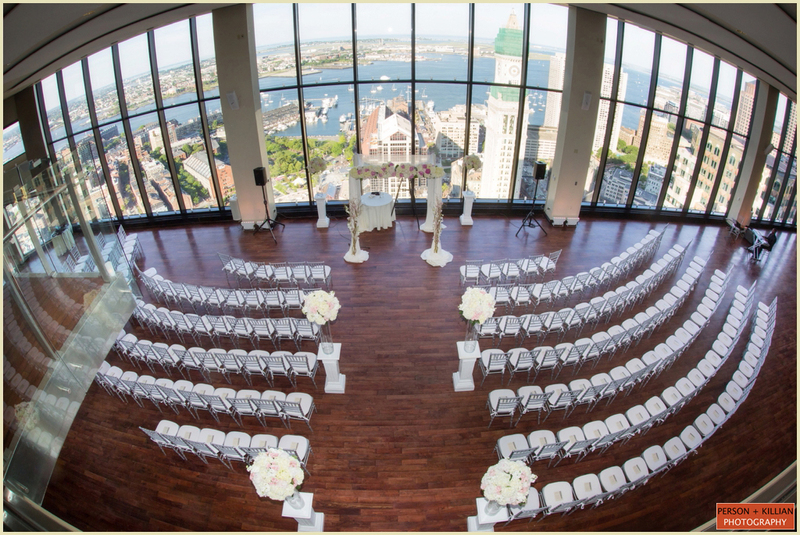 Their summer wedding at the State Room gave their guests an unforgettable night in Boston with one of the best views in the entire city. 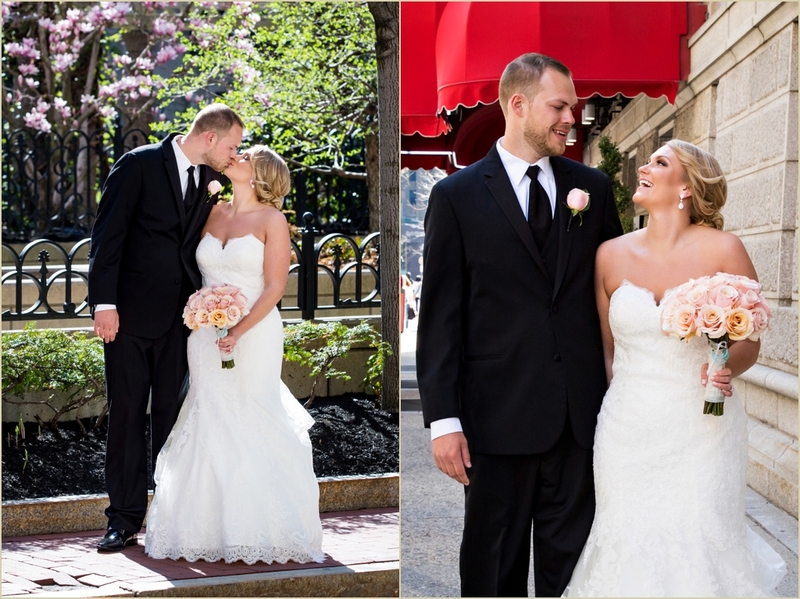 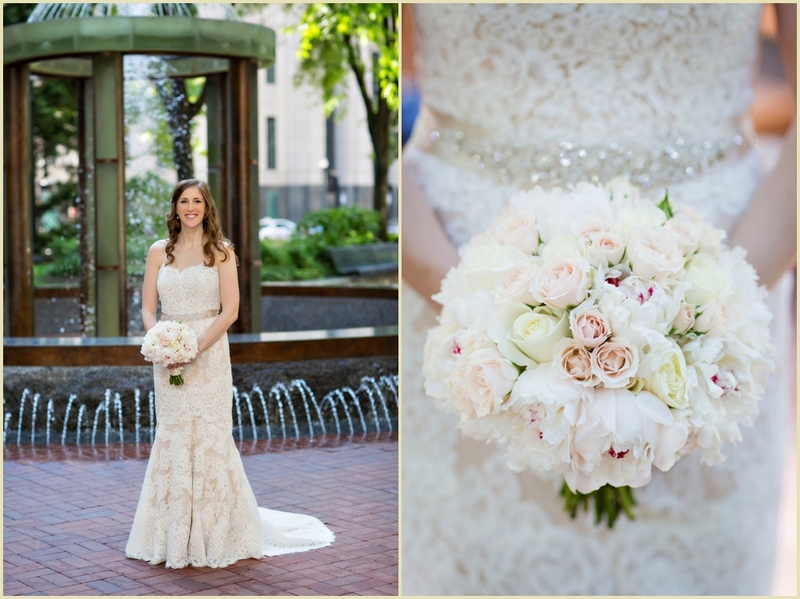 The bride and groom both got ready at the nearby Langham Hotel and the first look took place in Boston’s beautiful Post Office Square just across the street. 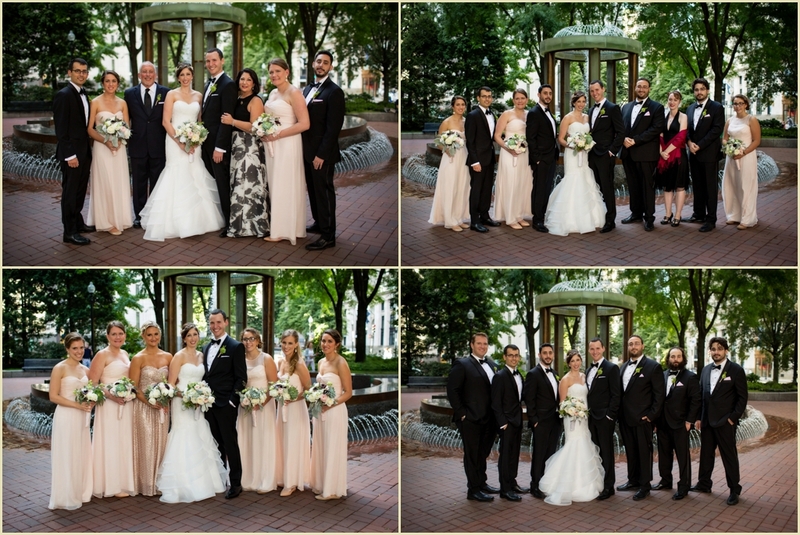 Before heading to the State Room for the ceremony we spent some time taking photos of the couple with their wedding party in the beautiful surroundings before the short walk over to State Street. 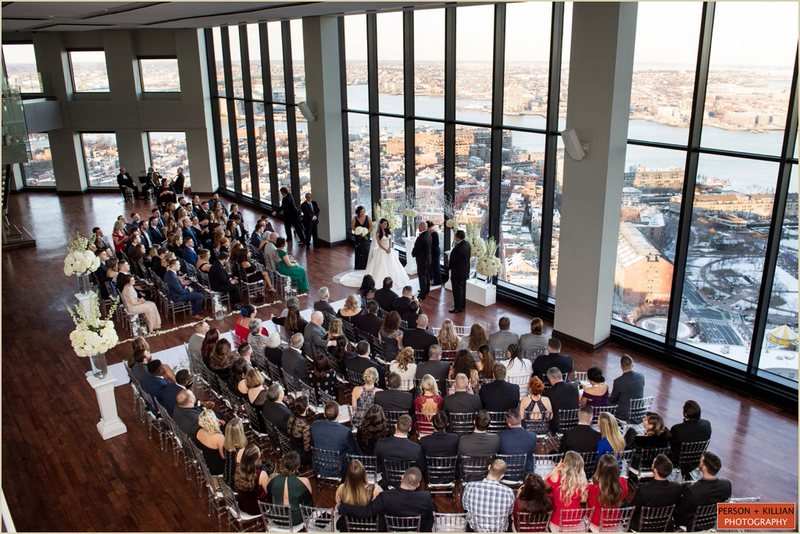 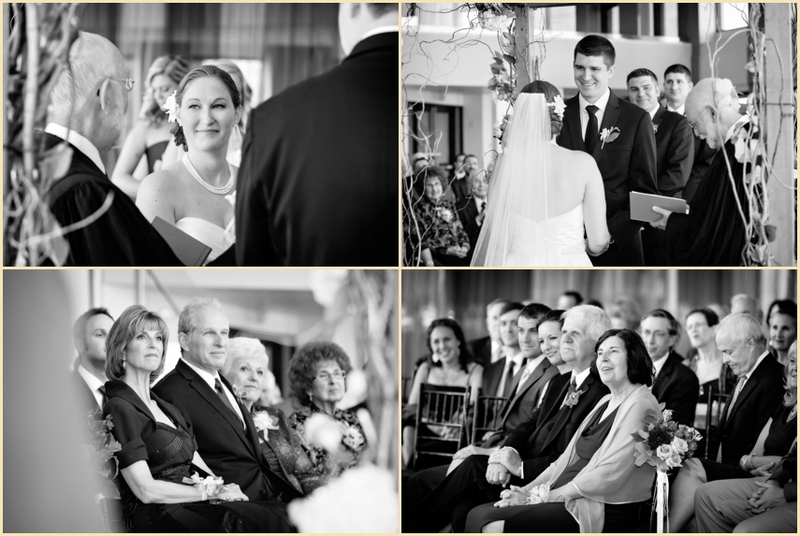 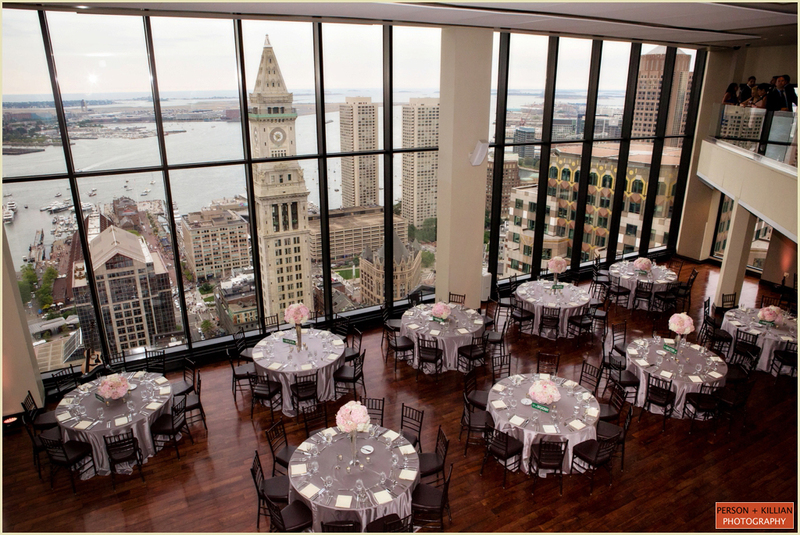 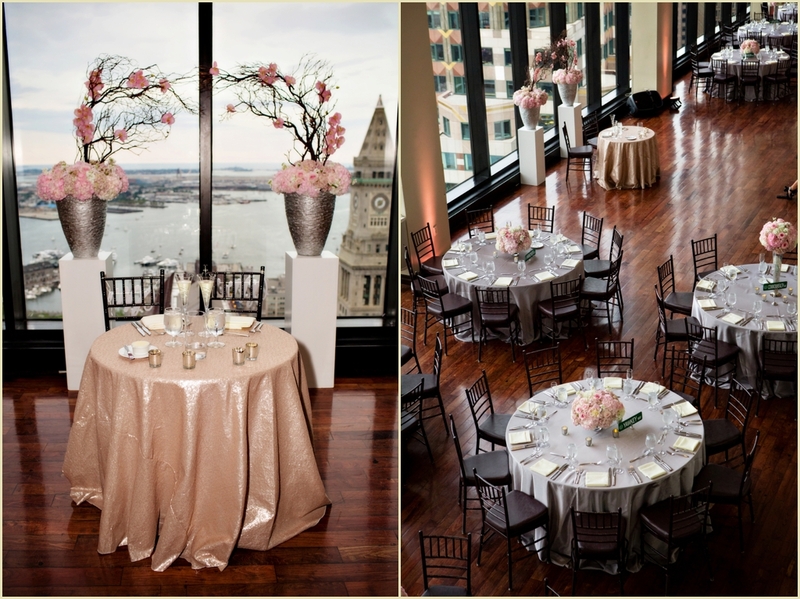 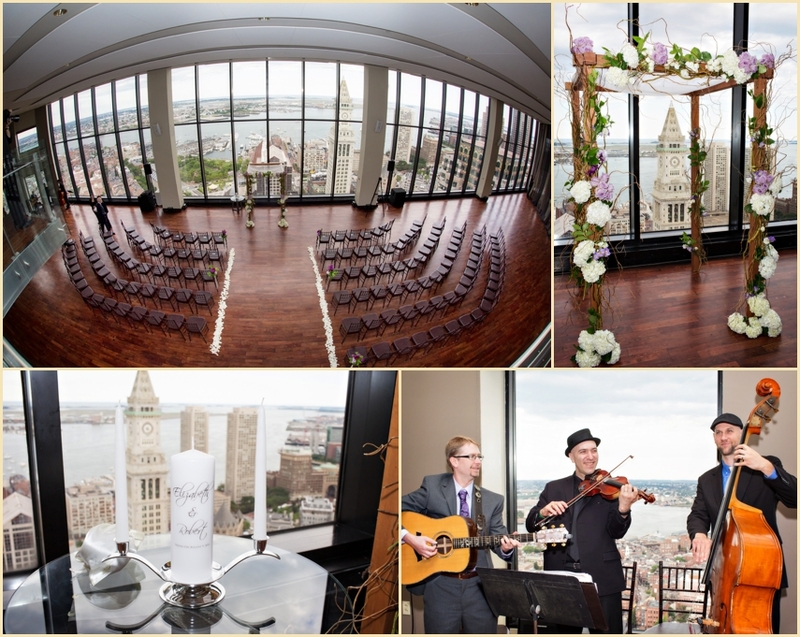 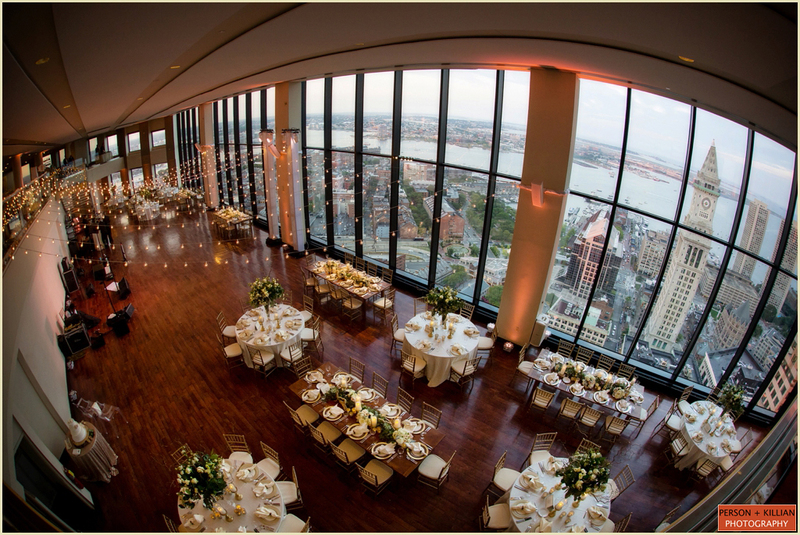 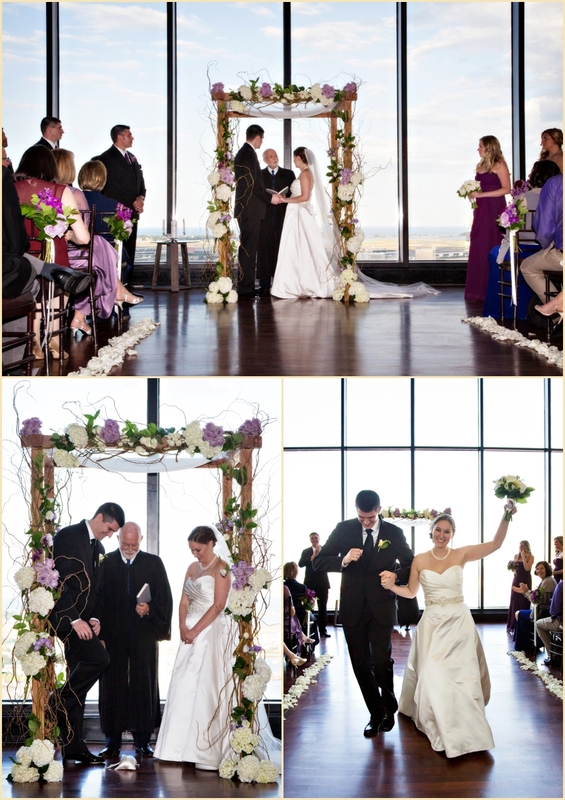 The late afternoon wedding ceremony took place in the State Room Boston’s Great Room, overlooking the city 33 stories below. 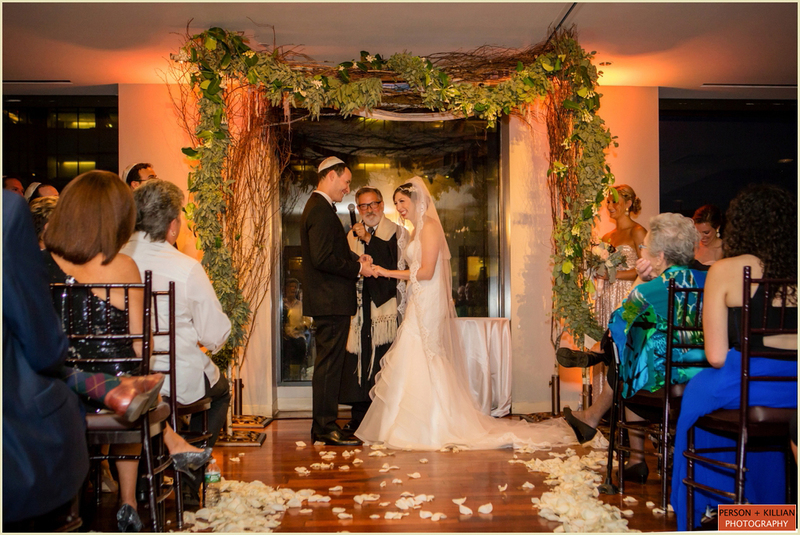 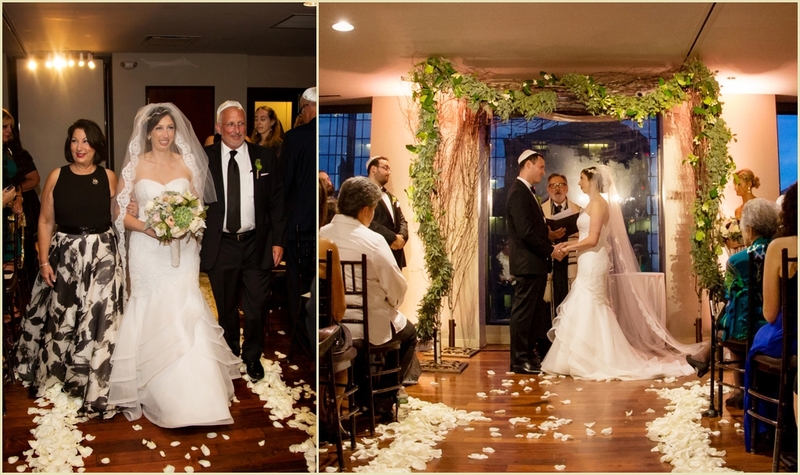 Liz and Rob said their “I do”s underneath a traditional wedding Chuppah, interwoven with beautiful white and purple flowers. 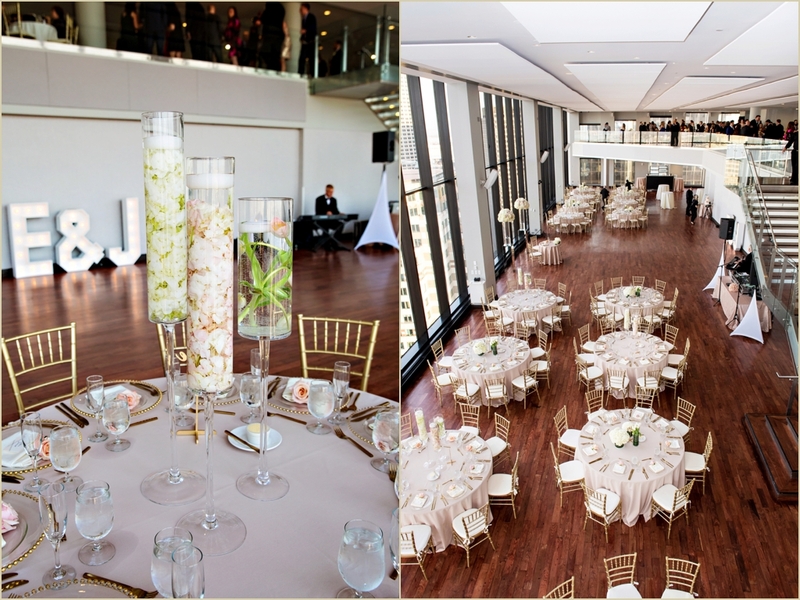 After the ceremony, guests moved upstairs to enjoy cocktails and hors d’oeuvres while the Great Room was transformed for the reception. 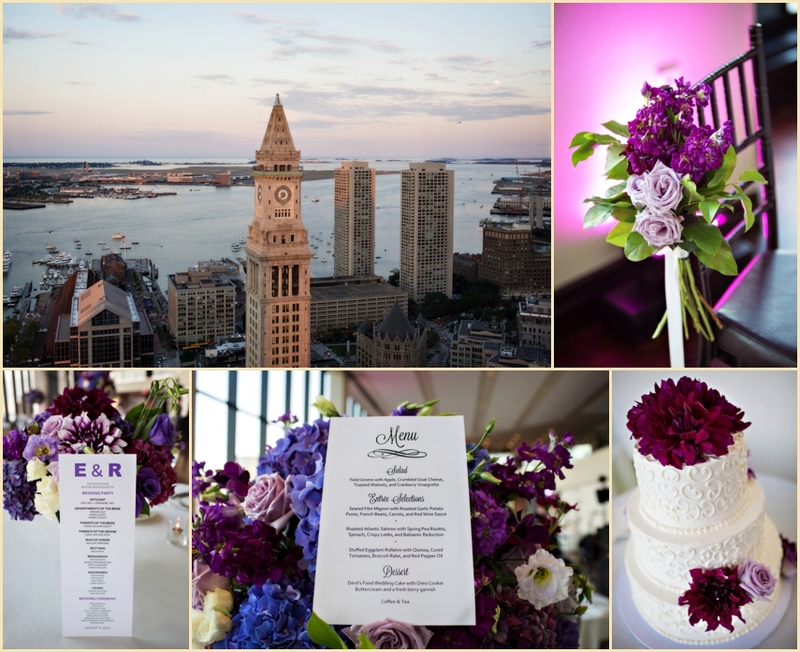 The Great Room was lit with a wash of purple uplights and tables were topped with a mix of short and tall floral arrangements in various shades of purple and green. 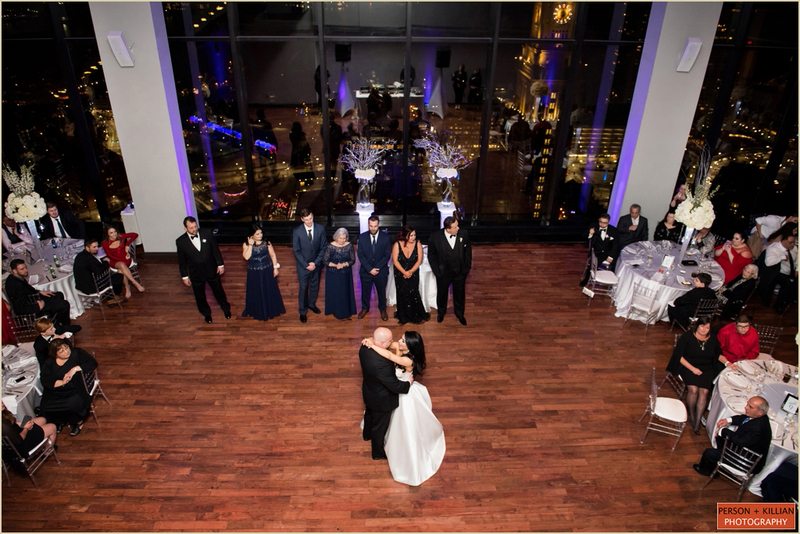 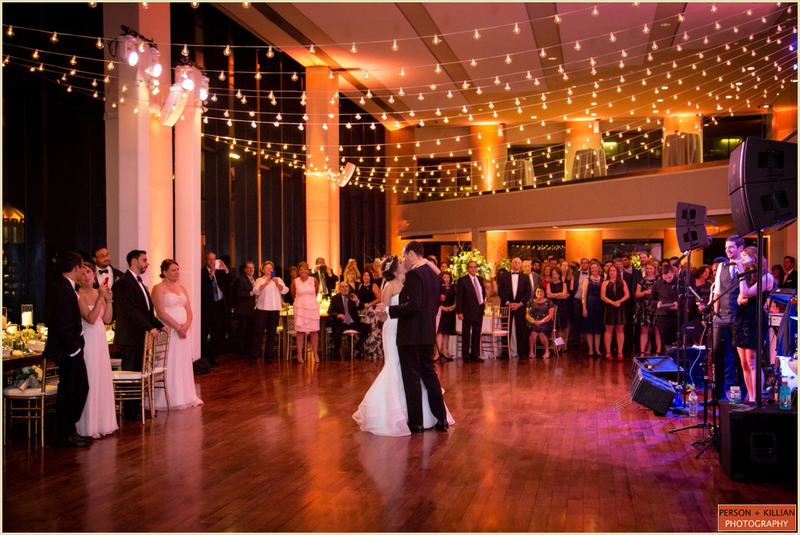 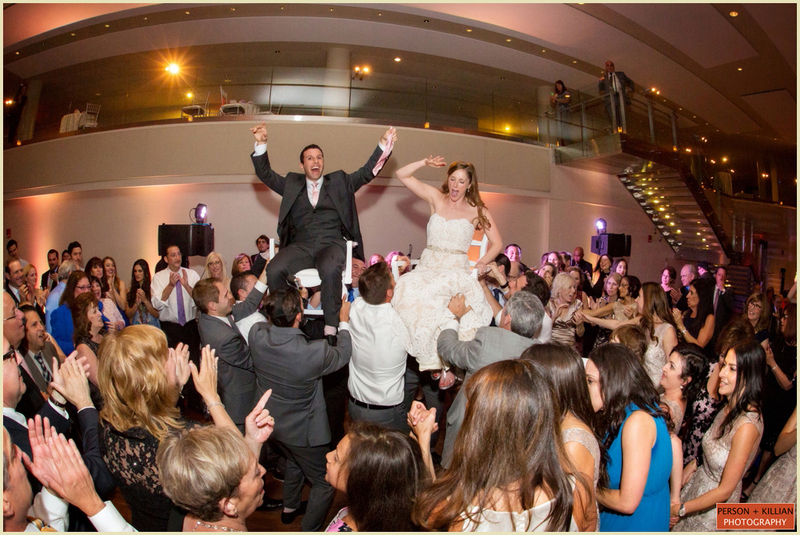 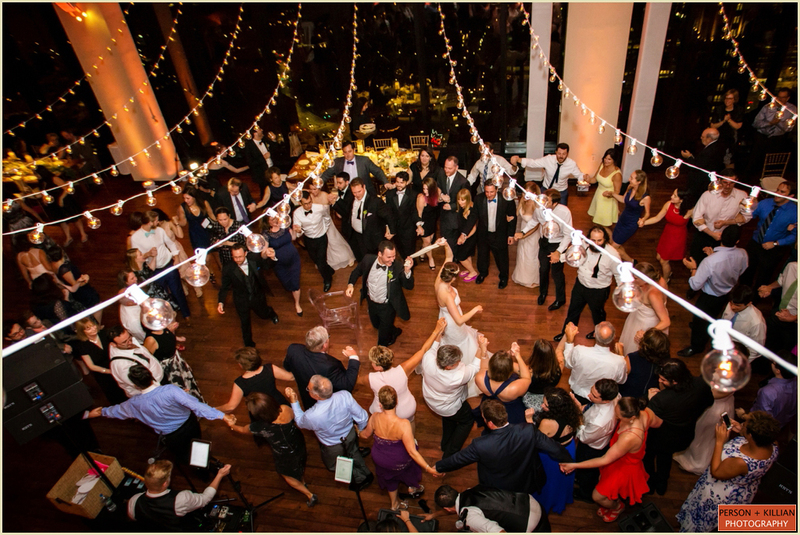 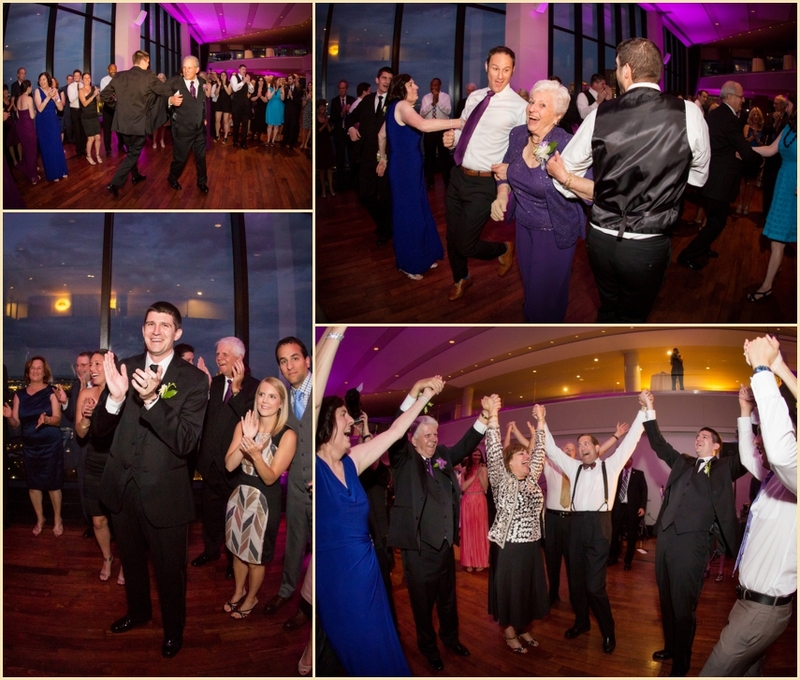 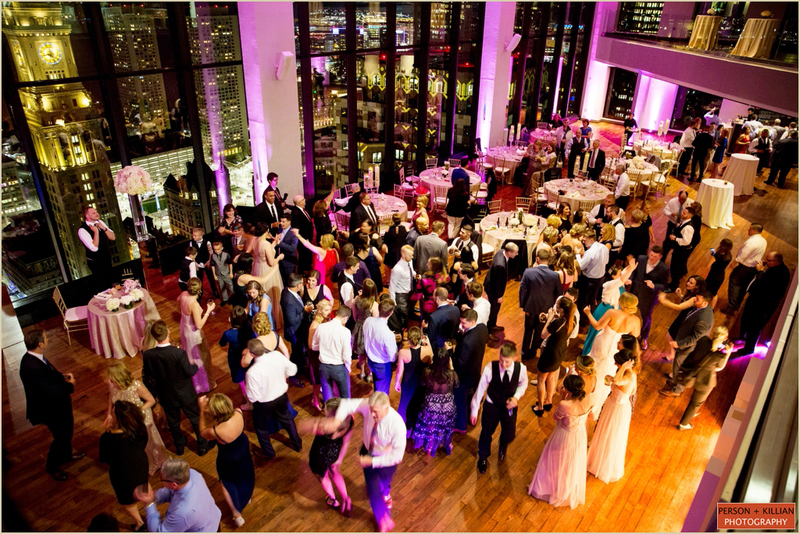 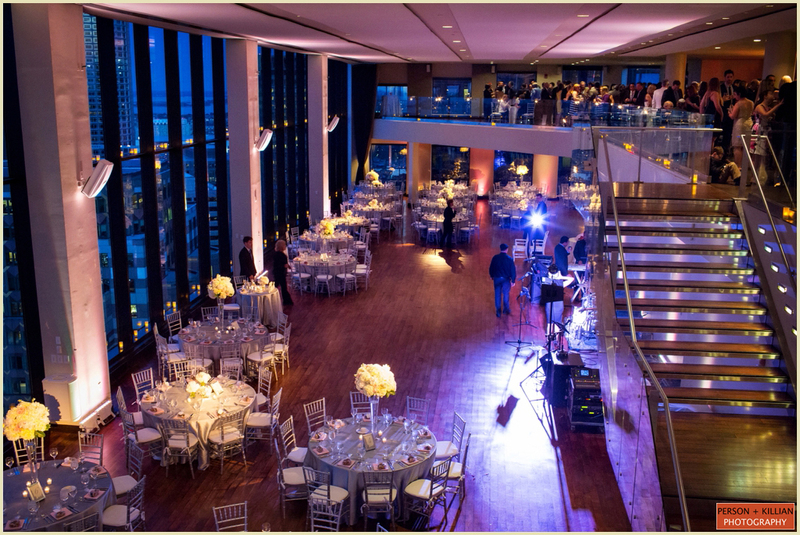 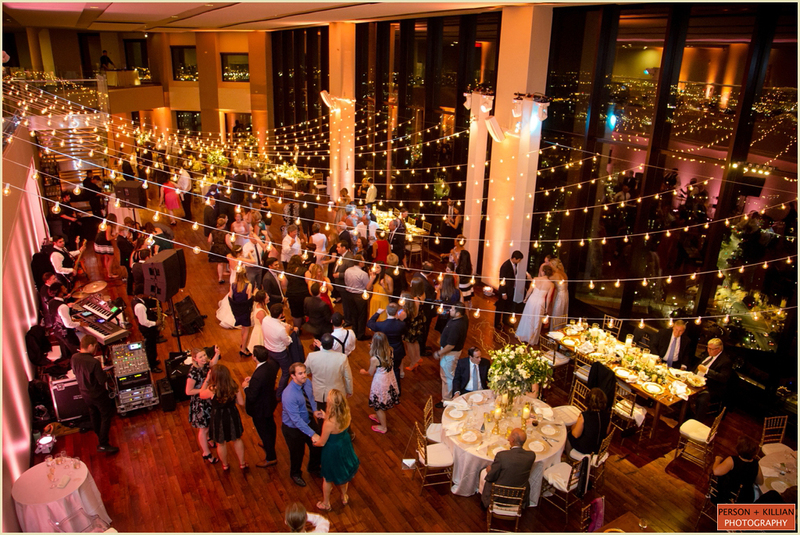 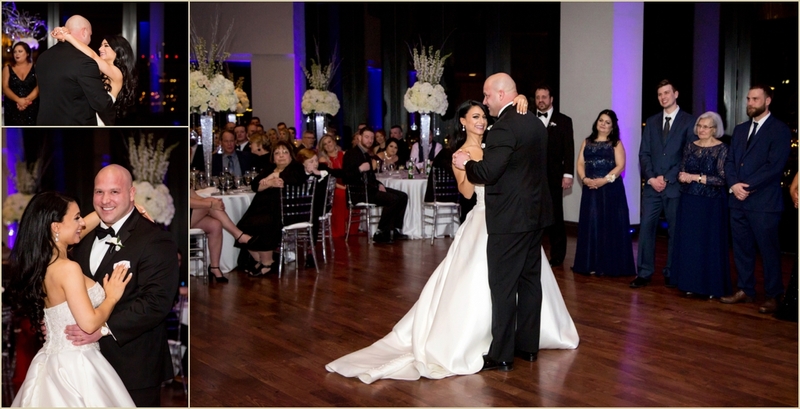 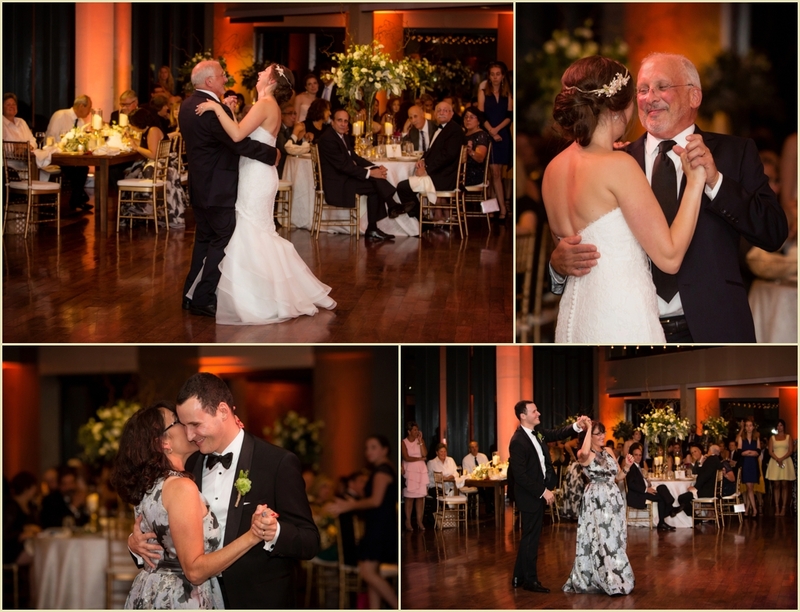 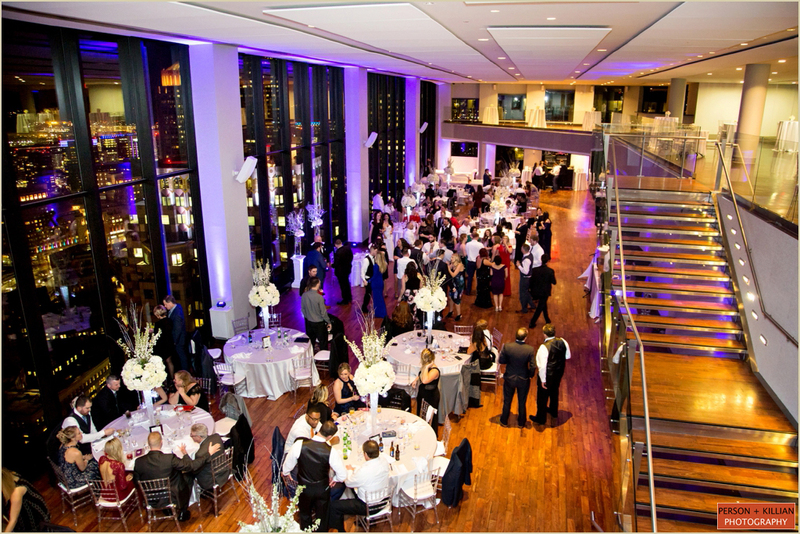 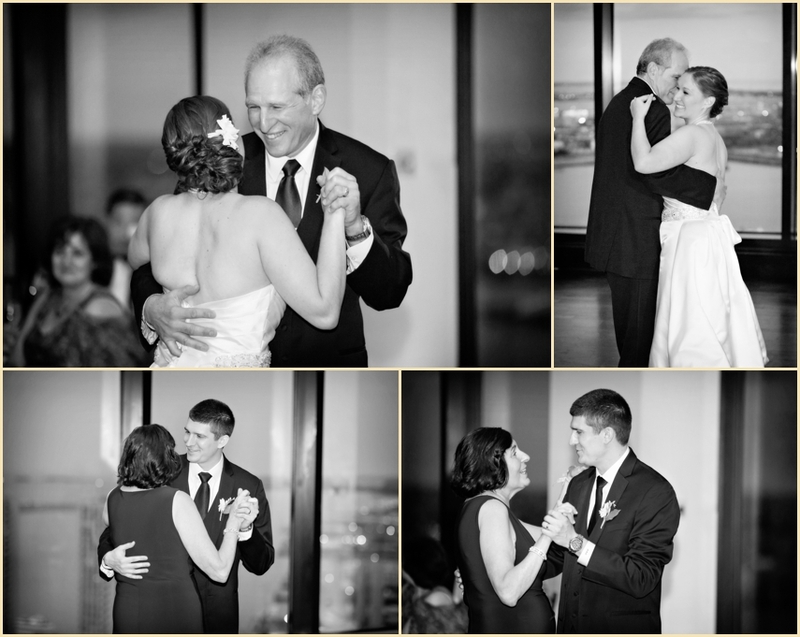 Guests enjoyed an energetic Hora, toasts, and parent dances, as well as the gorgeous view of the sunset (followed by a spectacular supermoon) through the State Room’s floor-to-ceiling windows. 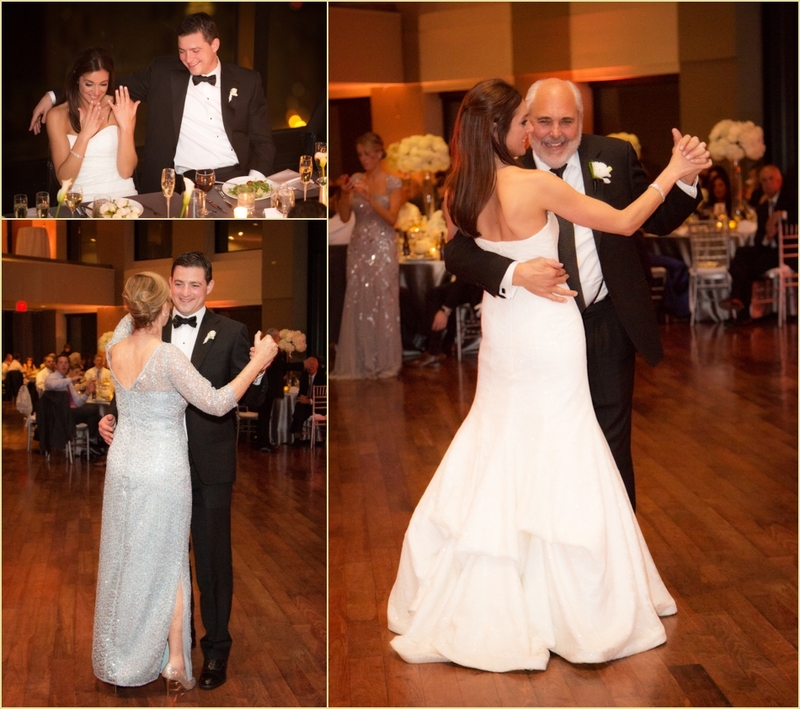 The dance floor was packed all night as friends and family celebrated with this wonderful couple. 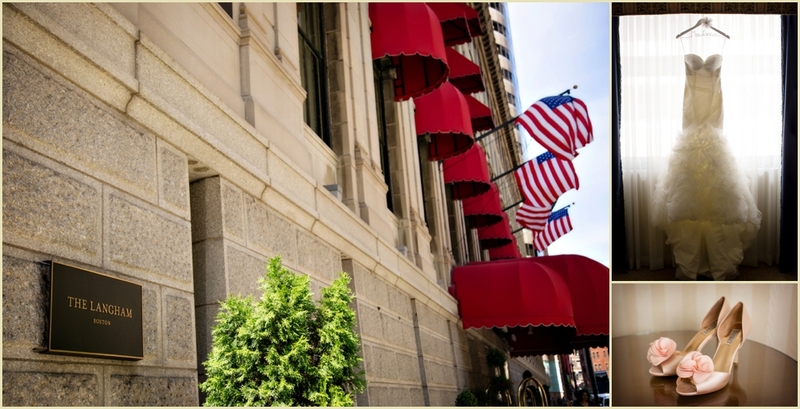 Thank you to the team at the State Room Boston, and to Liz, Rob and their families for being so great to work with. 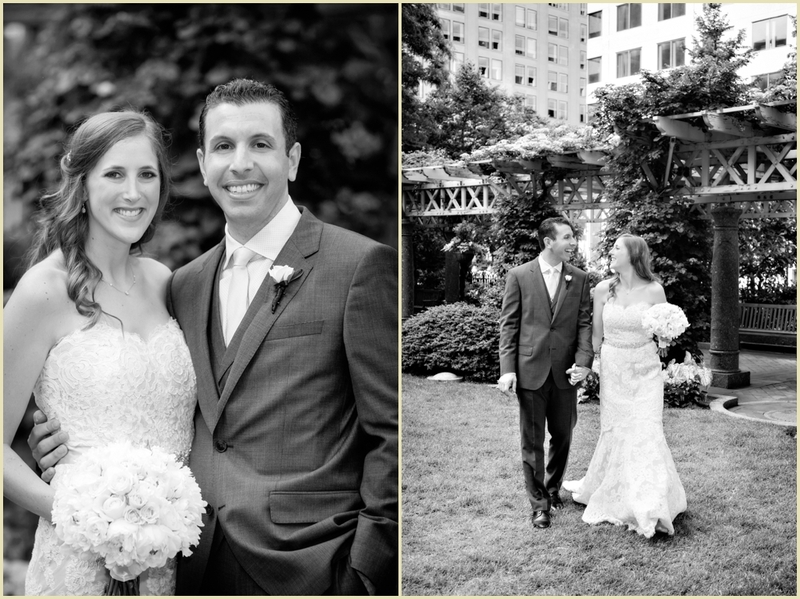 Congratulations Liz and Rob! 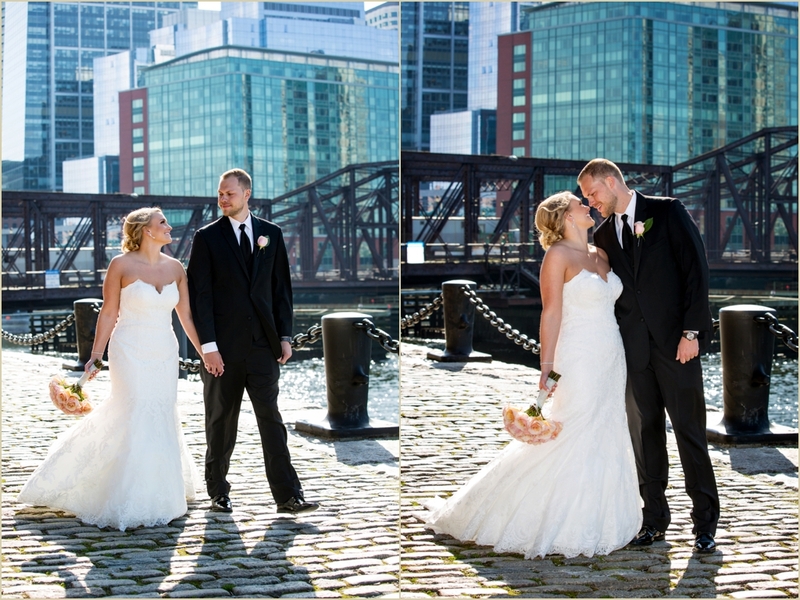 Earlier this month we had the pleasure of photographing the wedding of Katelyn and Kevin who wed near their house in South Boston. 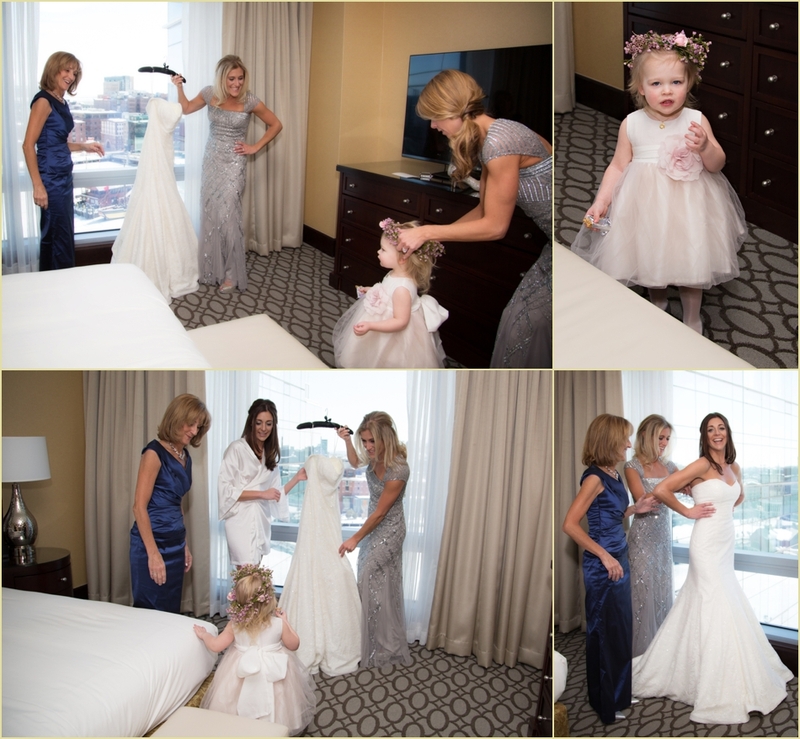 Before the ceremony, Katelyn and the bridesmaids got ready at her parents house in Canton while Kevin and the groomsmen got ready at their home just blocks from the church. 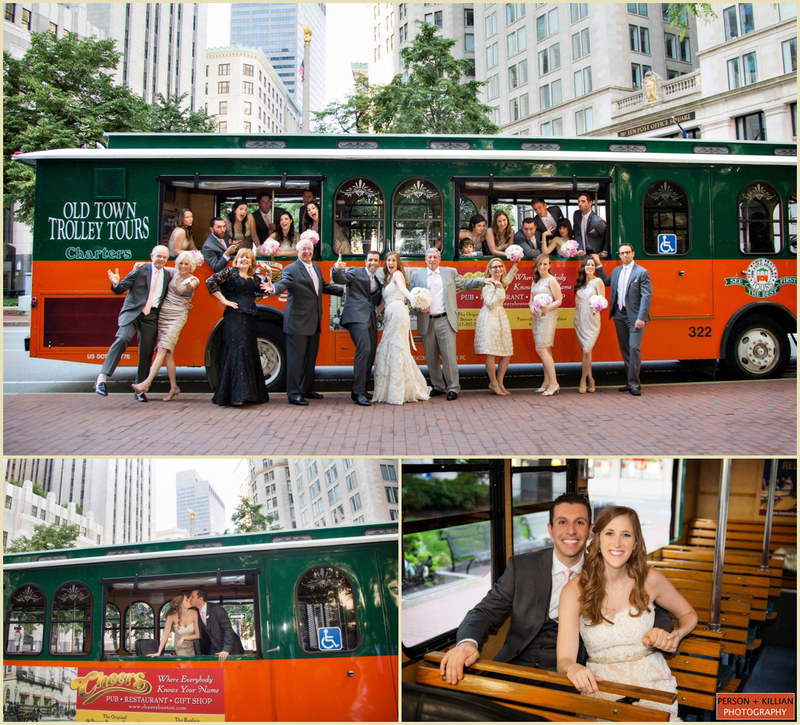 Following their beautiful afternoon ceremony, the wedding party boarded a trolly and headed to Post Office Square in Downtown Boston for formal photographs. 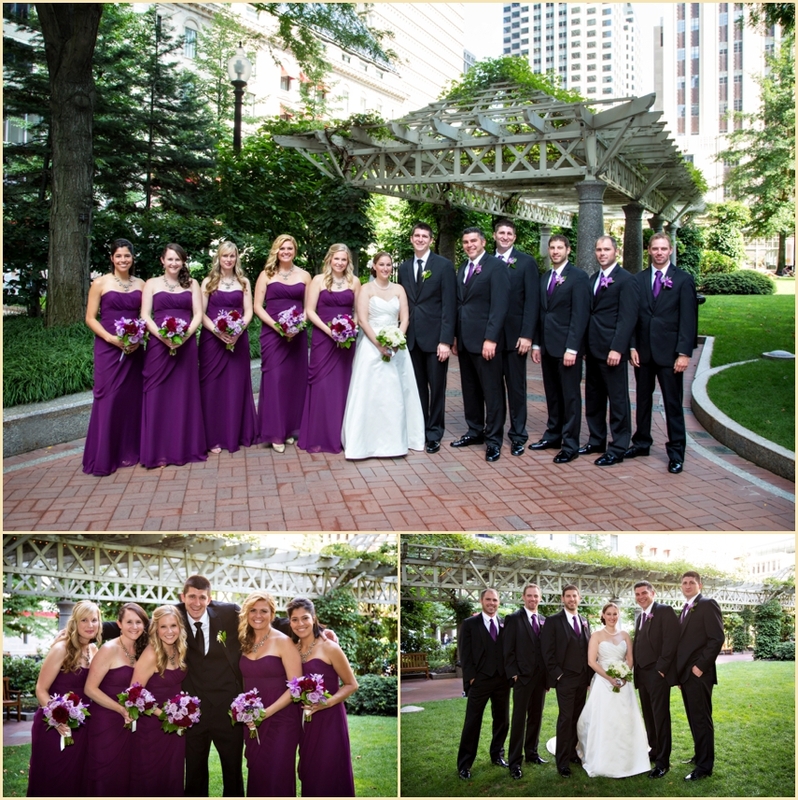 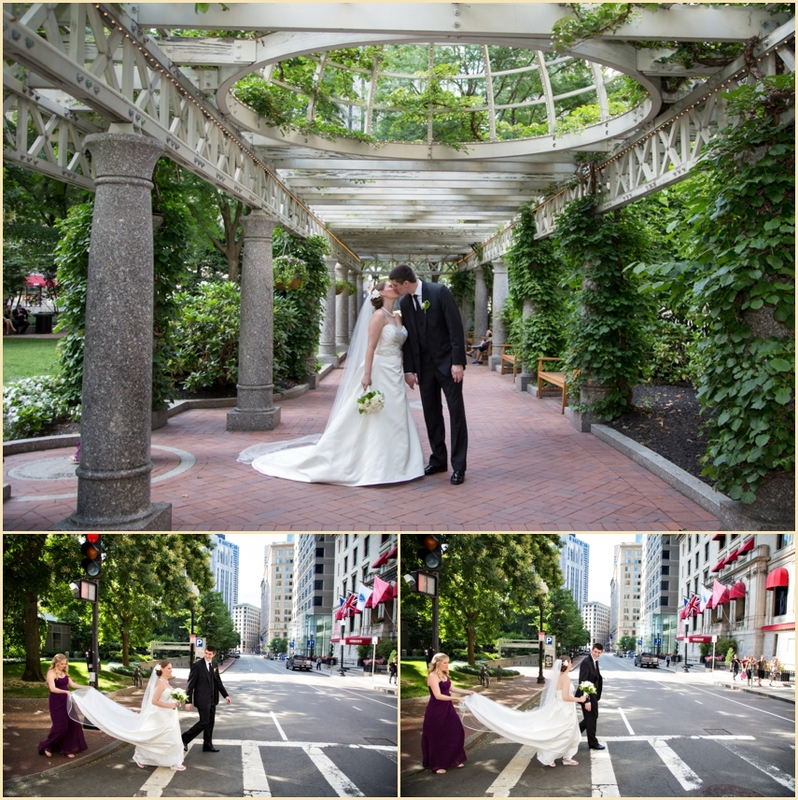 PO Square is one of our favorite locations to photograph in the city and is located just around the corner from the State Room Boston where the reception was held. 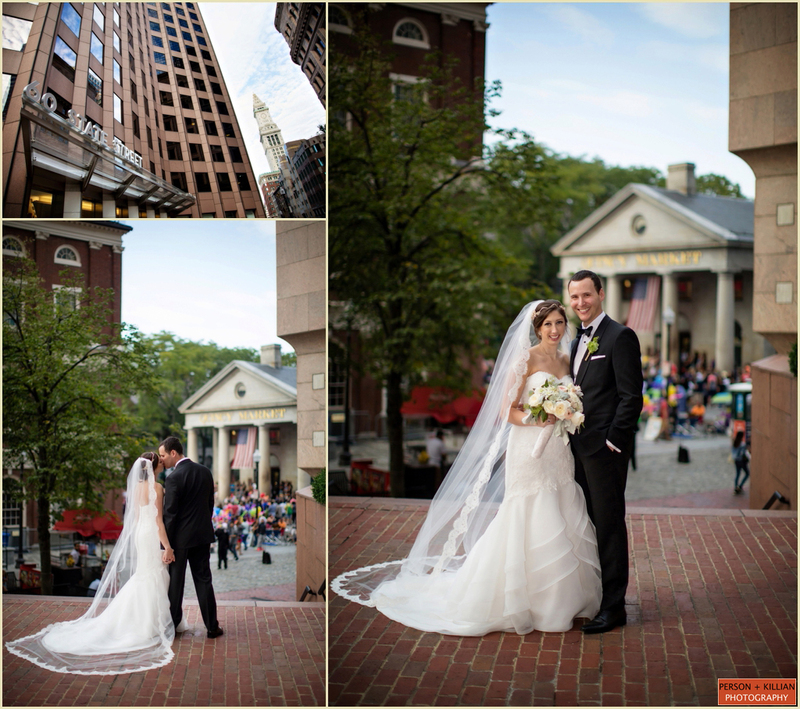 Before the newlyweds joined cocktail hour, we took a moment for a few more photographs on State Street overlooking the Old State House. 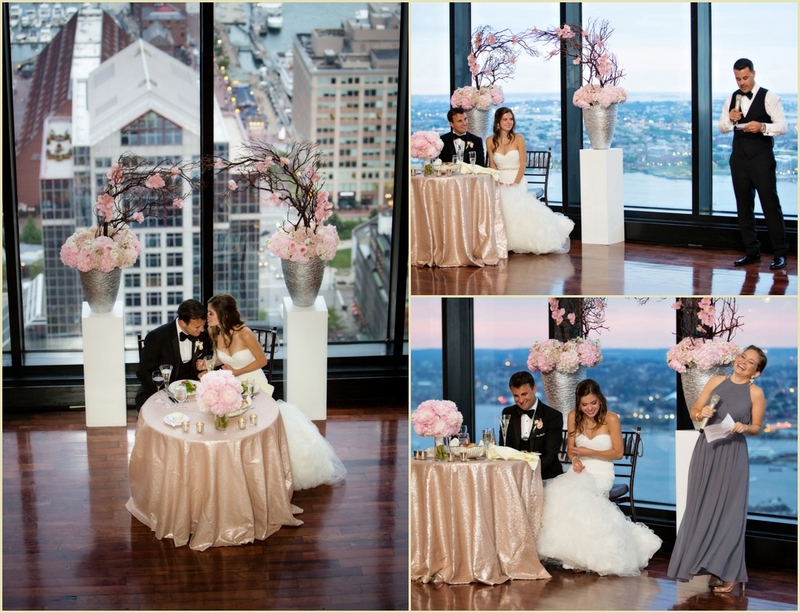 While guests enjoyed cocktails and hors d’oeuvres on the balcony they took in the view of the city as the sun started to set. 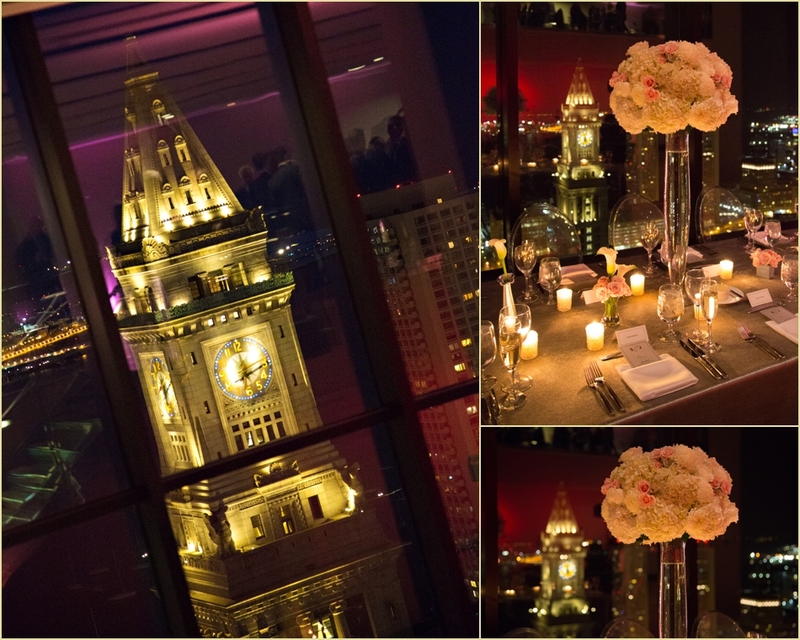 The always gorgeous view was extra spectacular as the rare super moon shined bright in the background throughout the evening celebration. 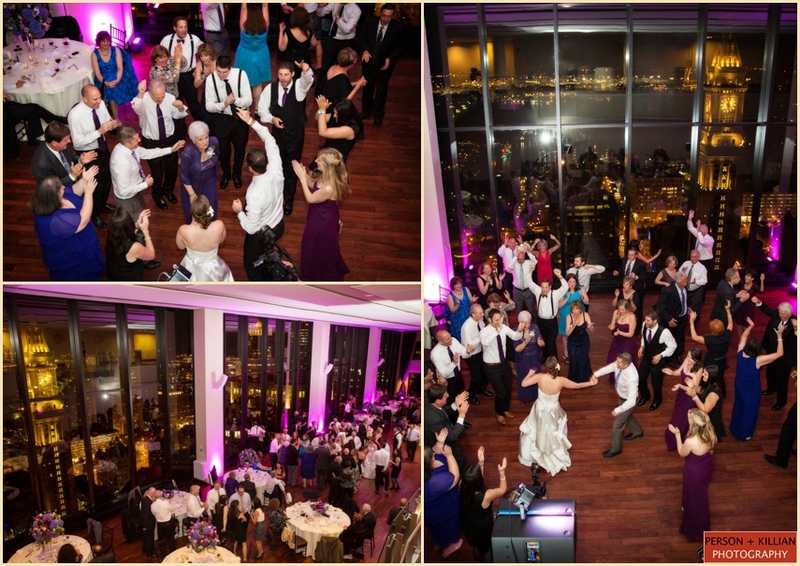 After dinner, Sweet Tooth and the Sugarbabies opened the dance floor and kept the party going throughout the night. 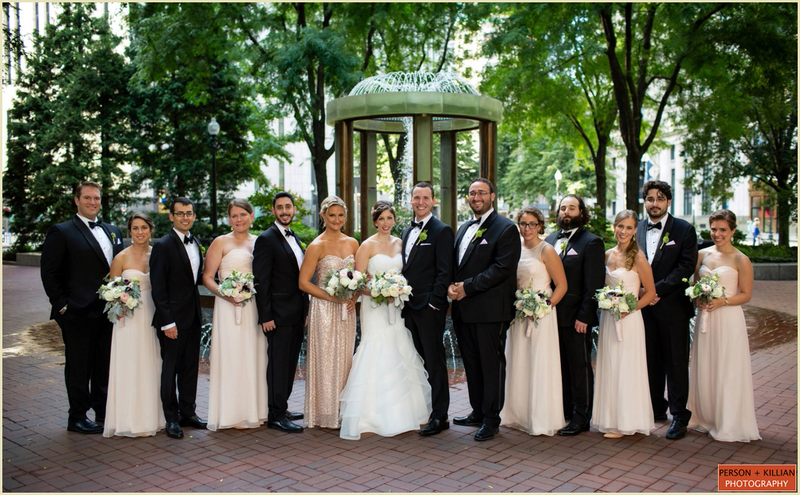 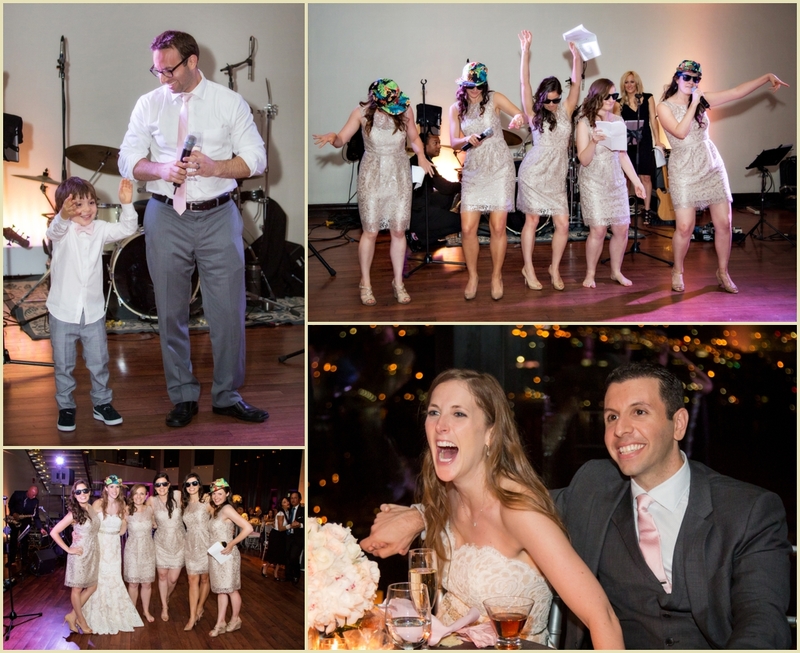 Congratulations Katelyn and Kevin, thank you for having us there to capture your beautiful and fun wedding celebration and thank you to the team at the State Room for always being so wonderful work with!